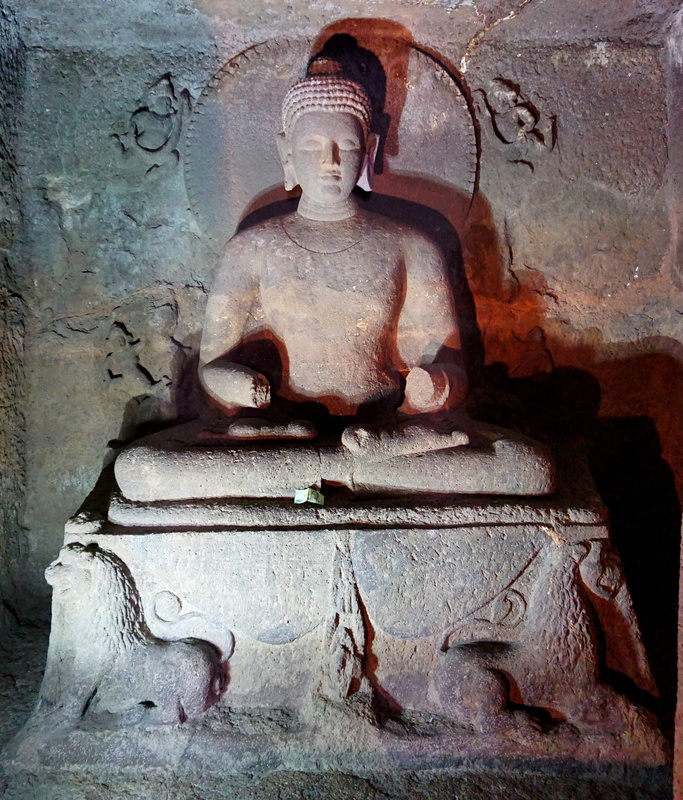 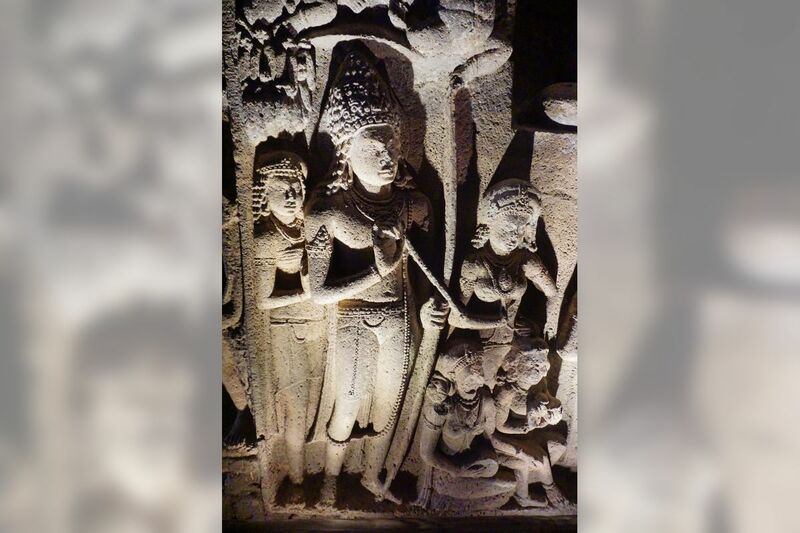 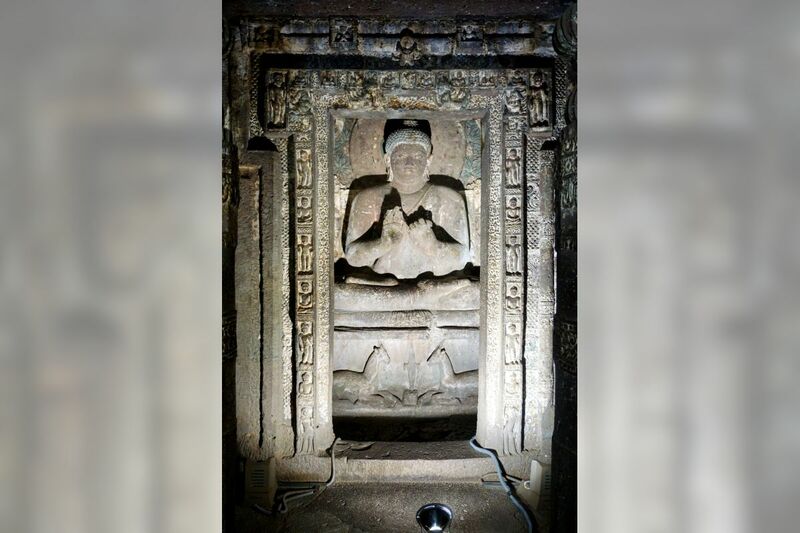 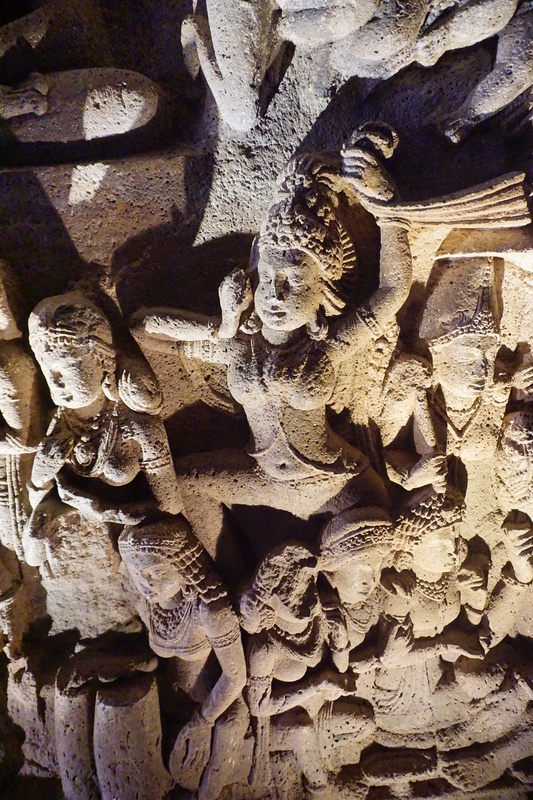 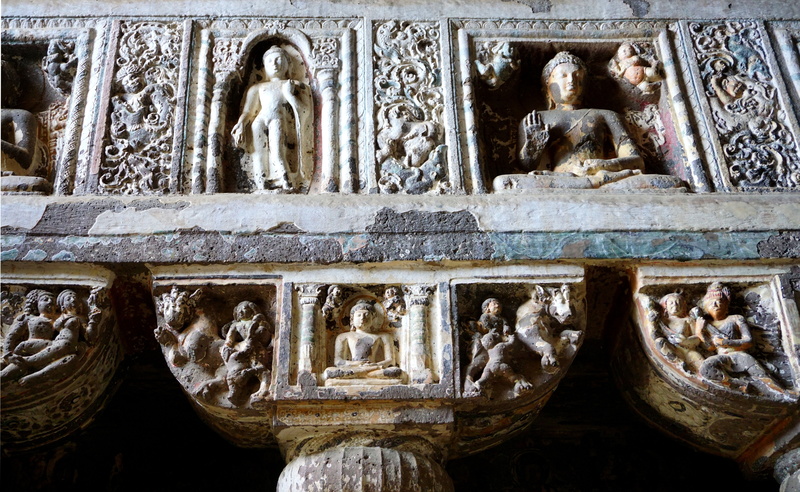 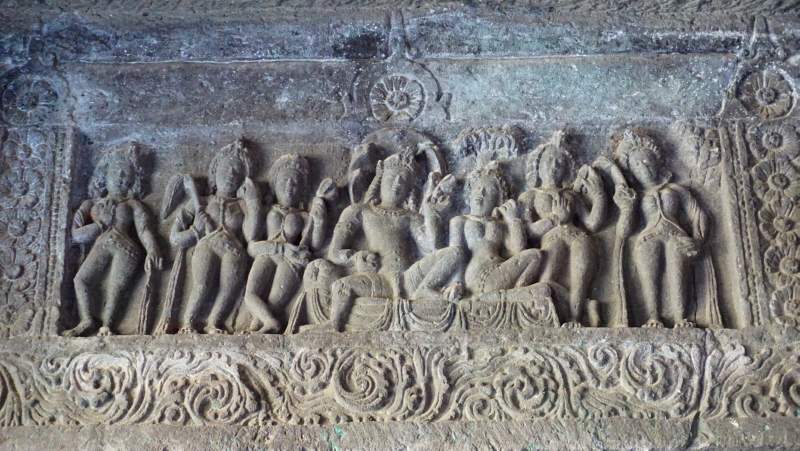 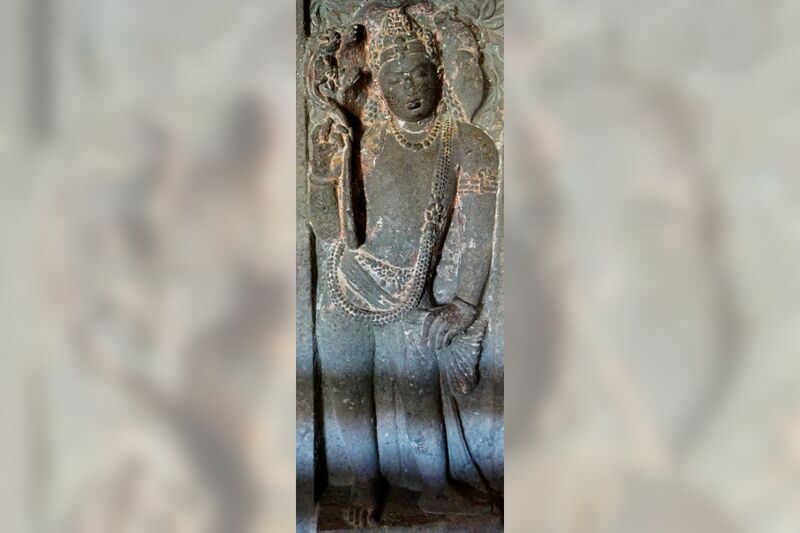 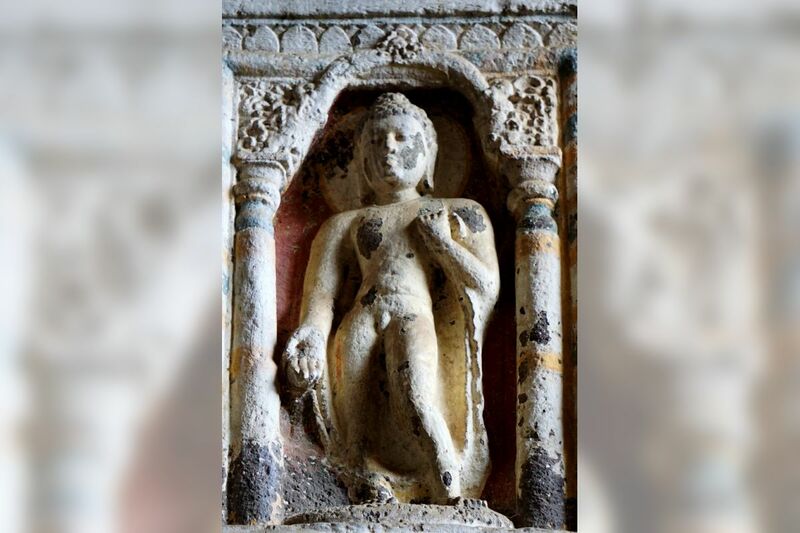 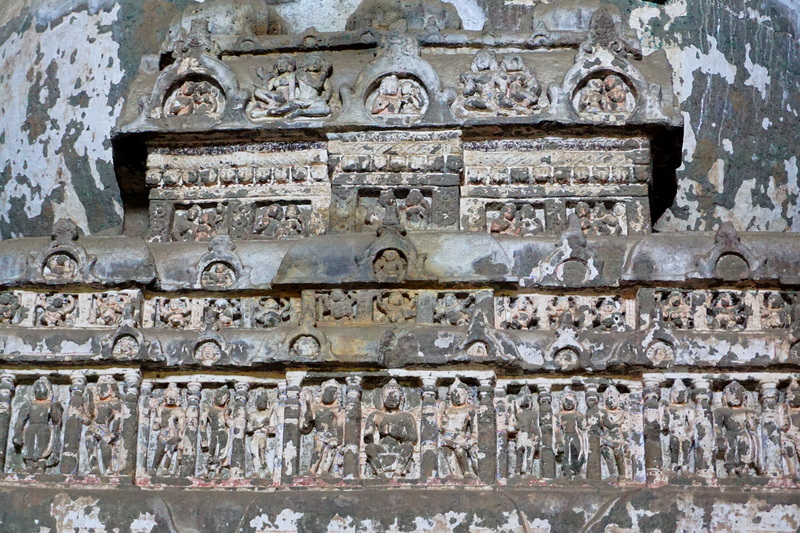 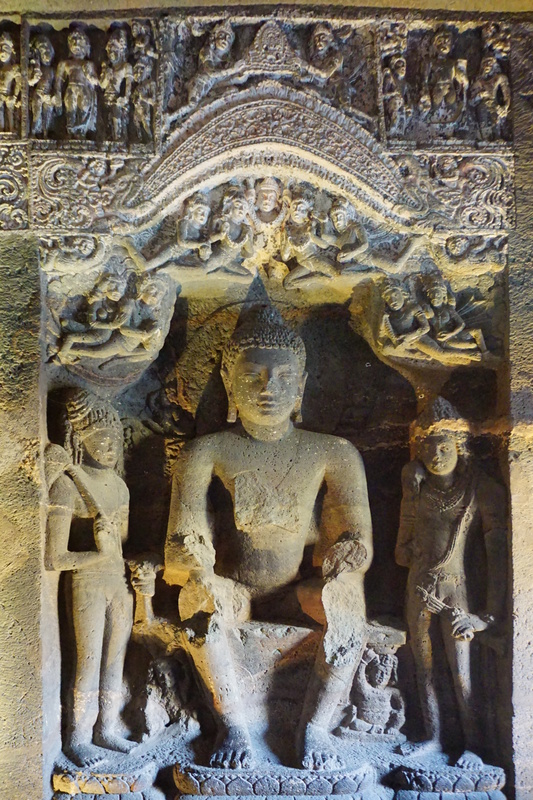 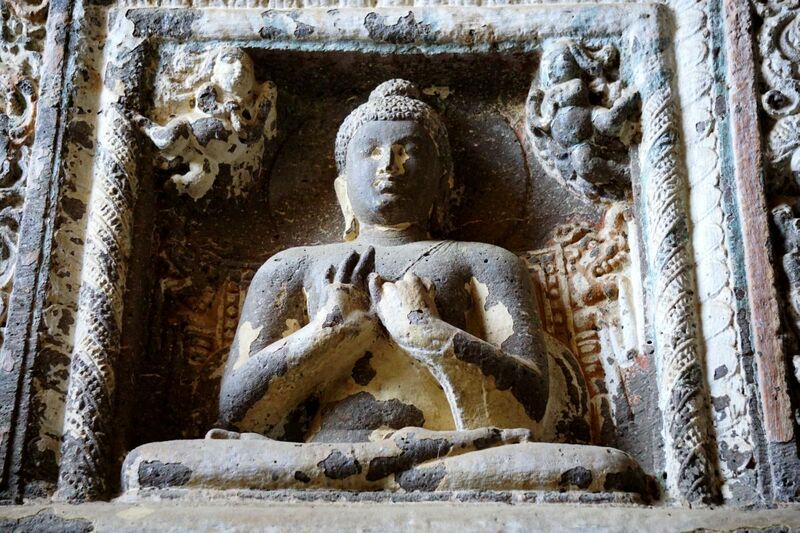 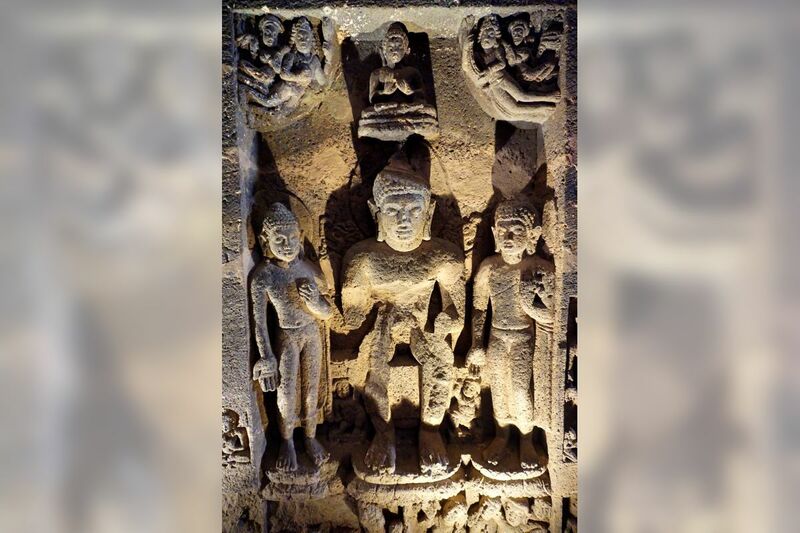 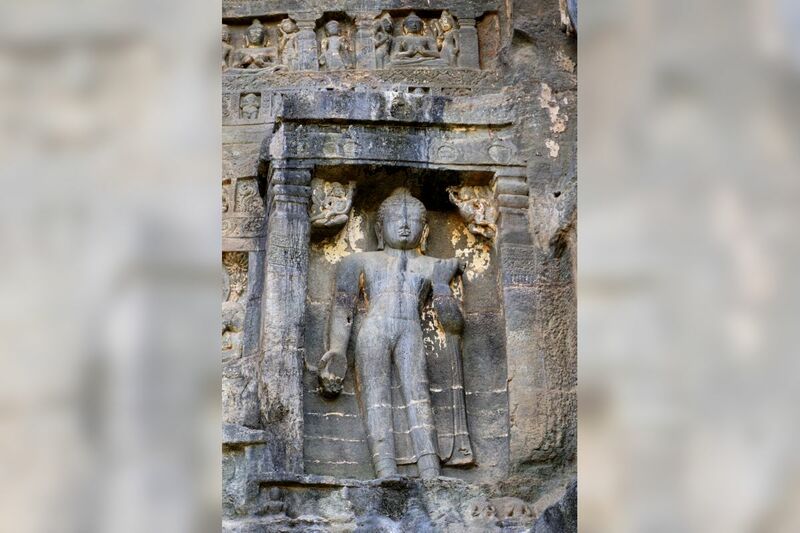 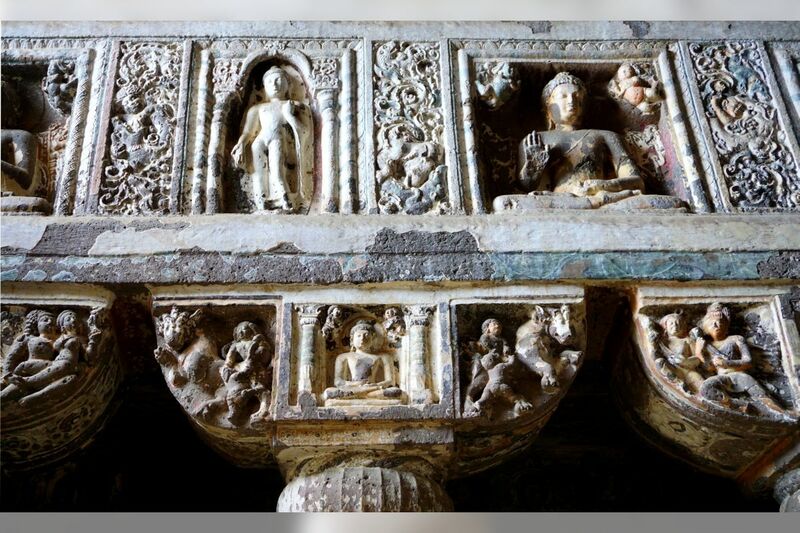 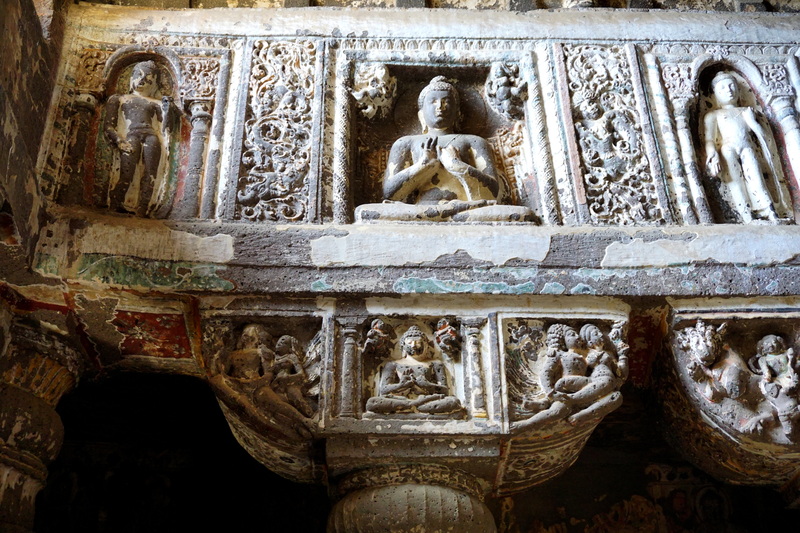 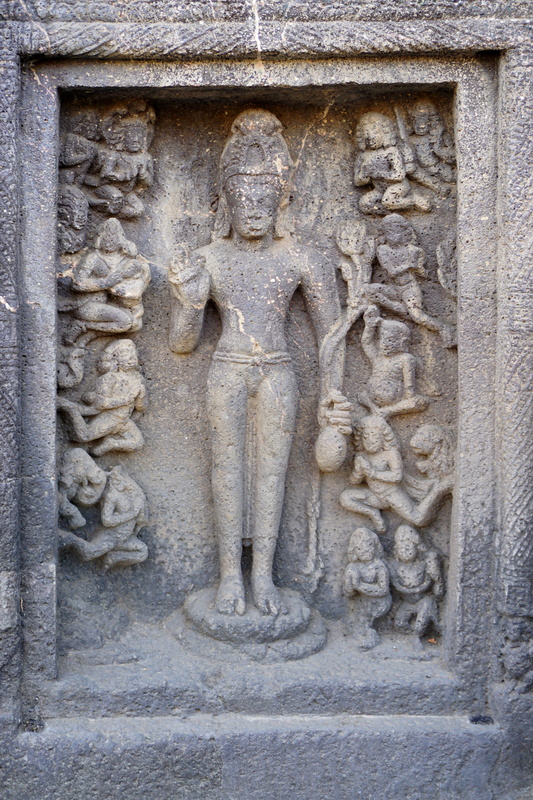 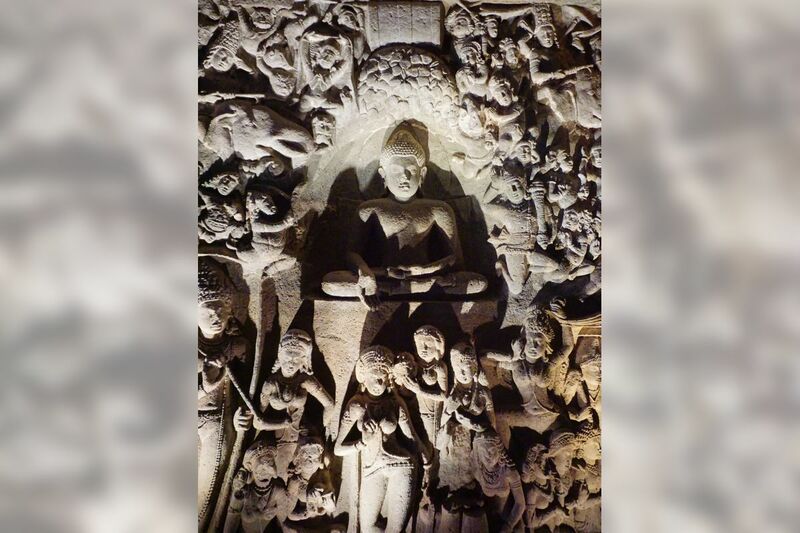 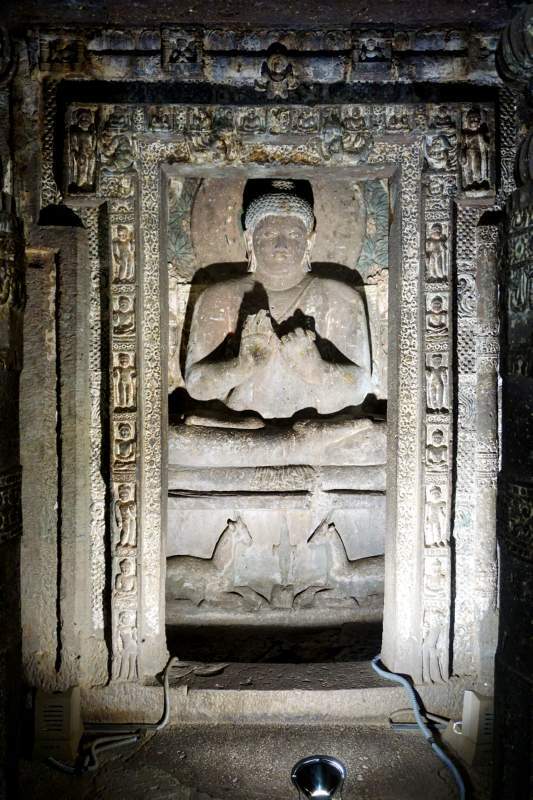 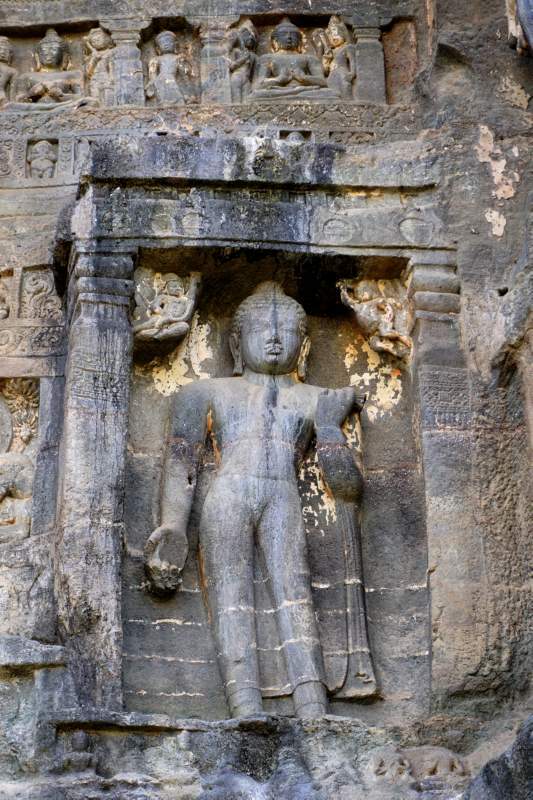 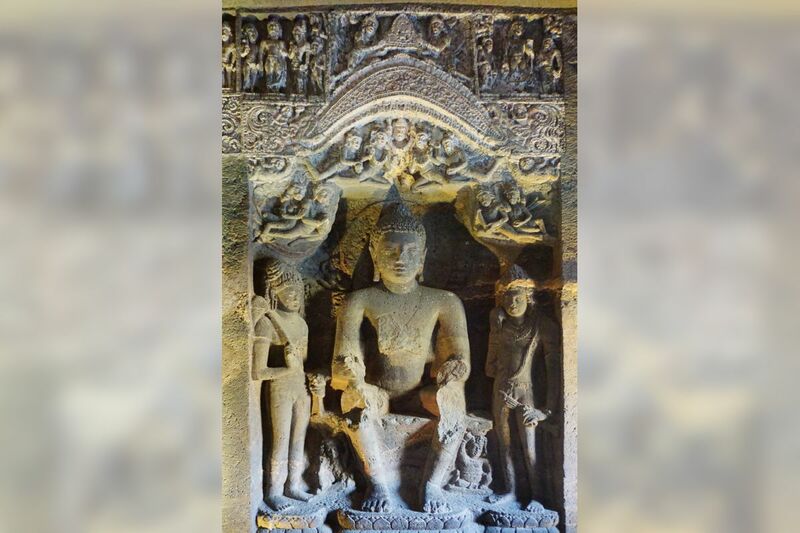 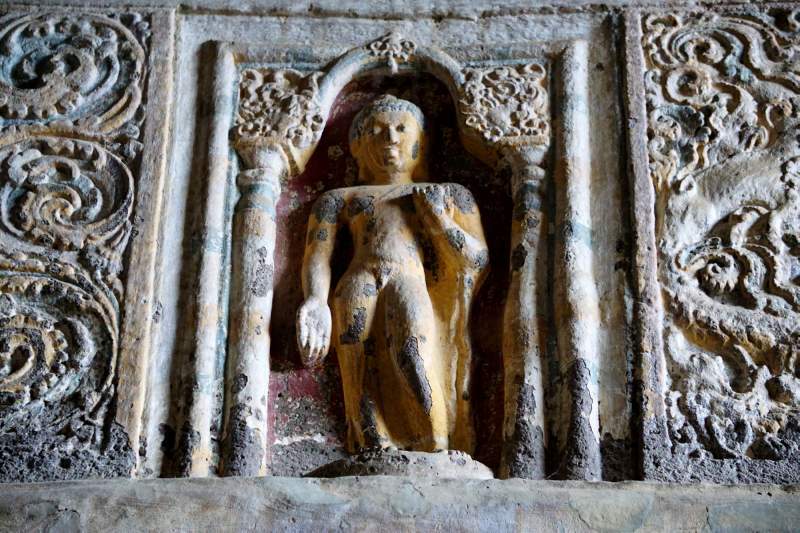 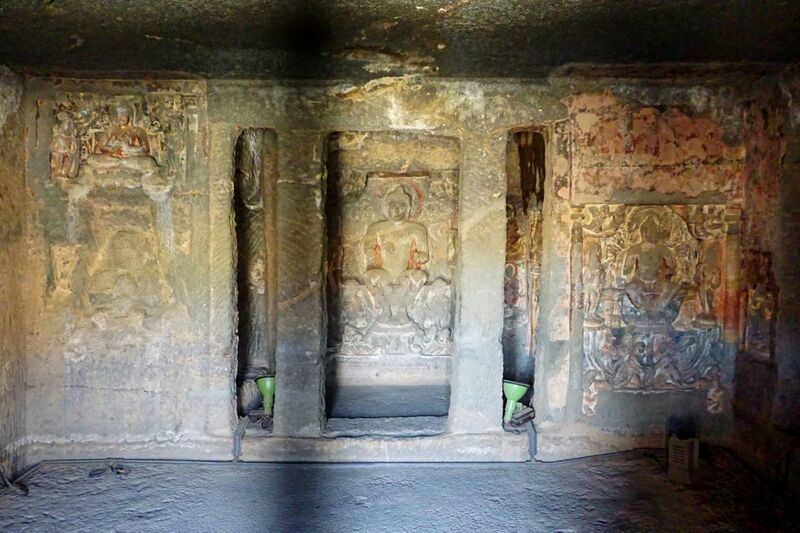 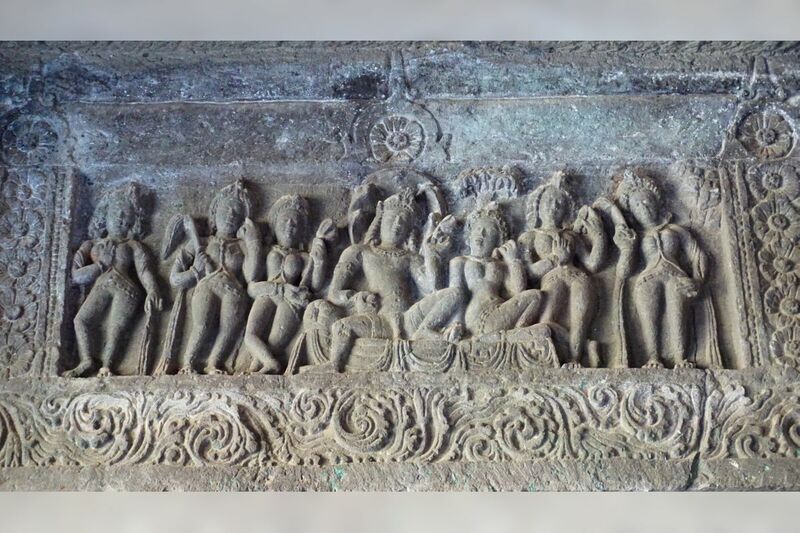 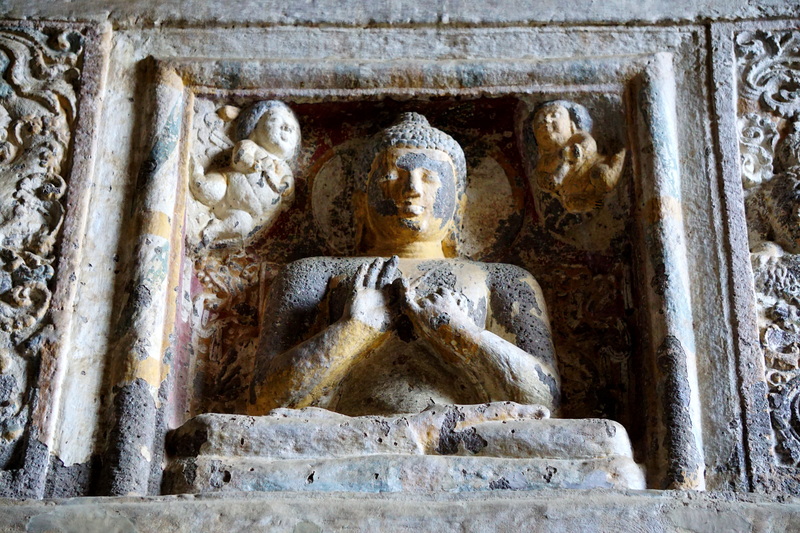 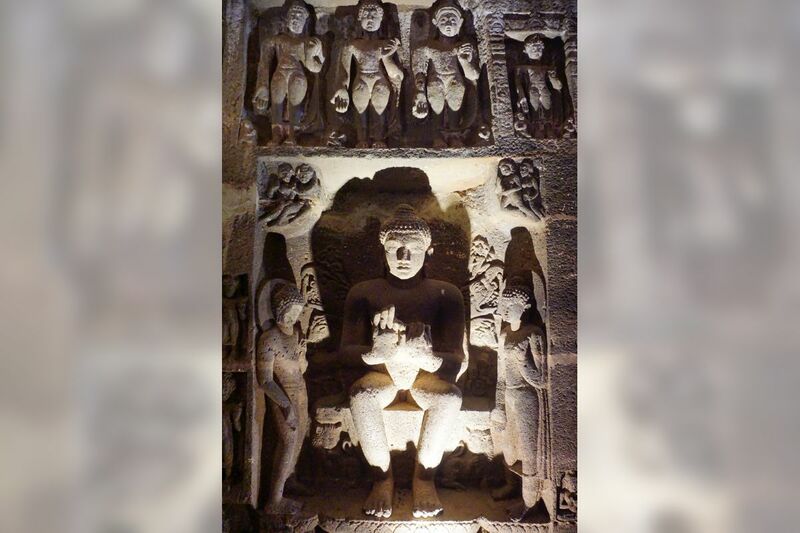 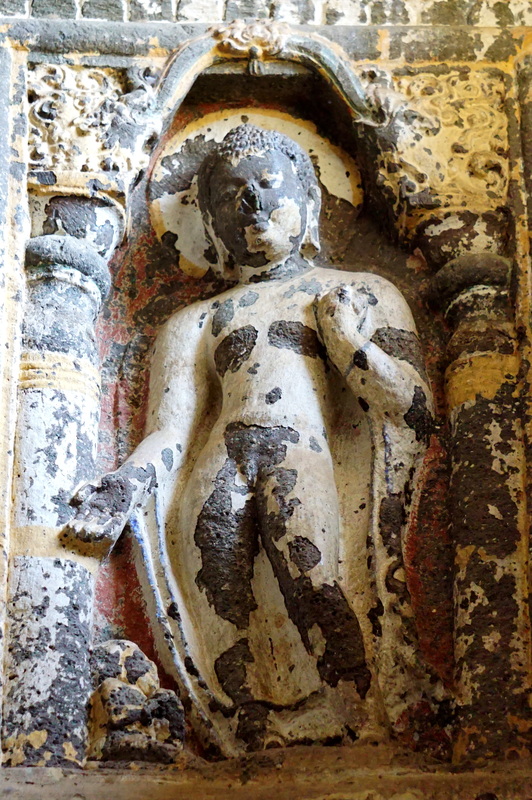 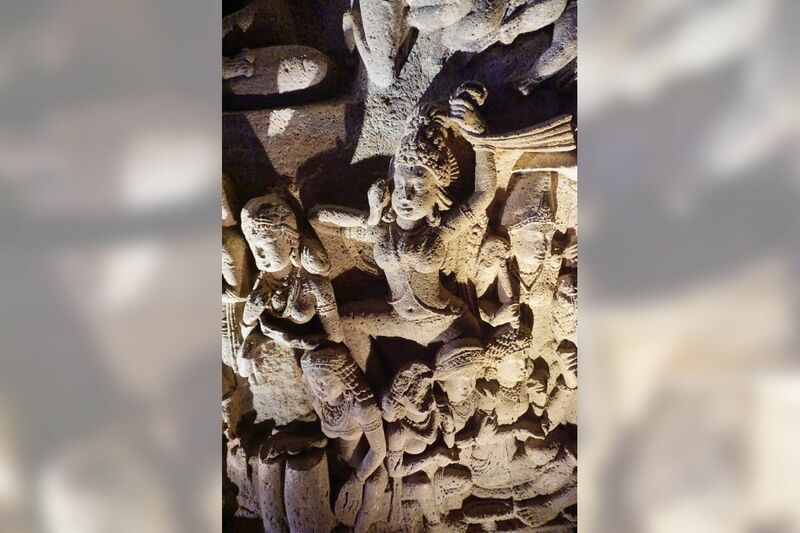 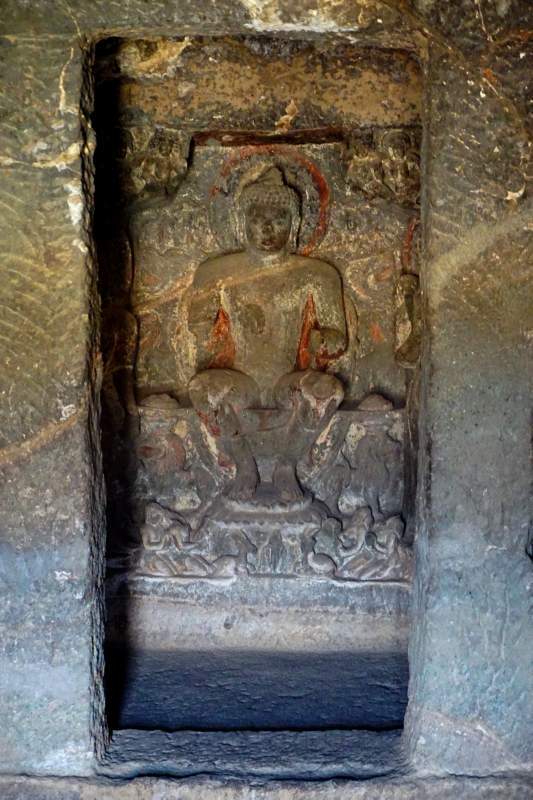 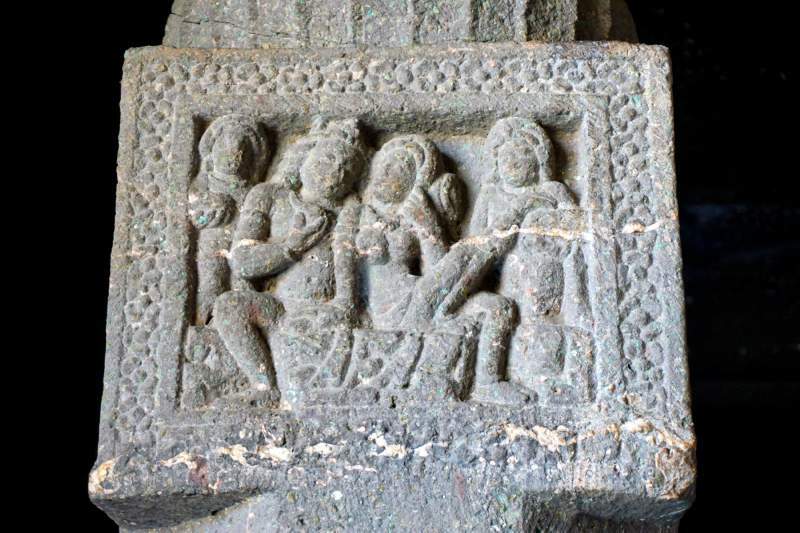 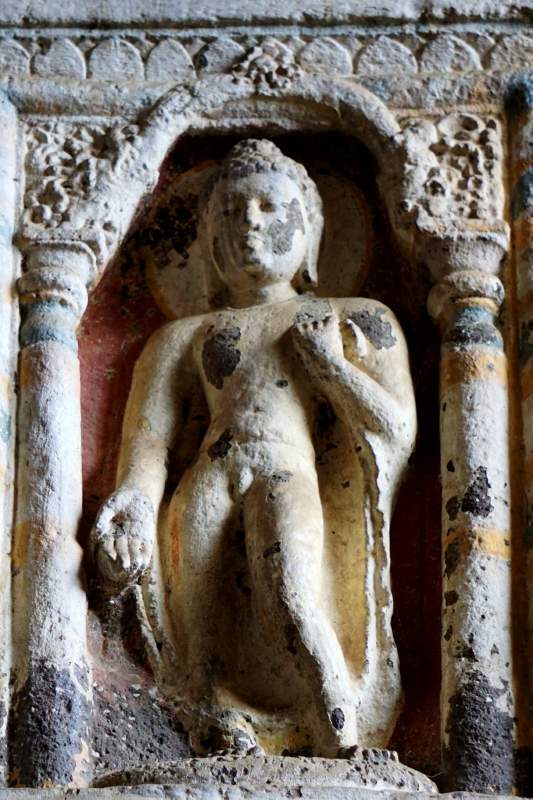 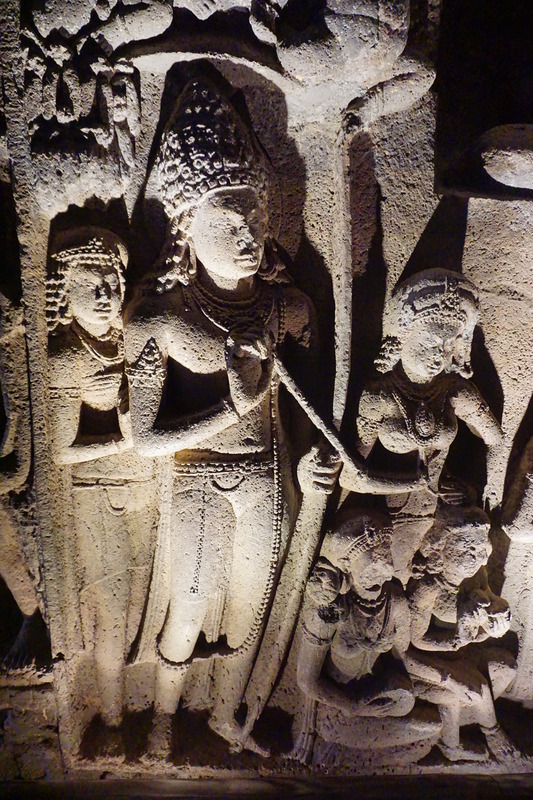 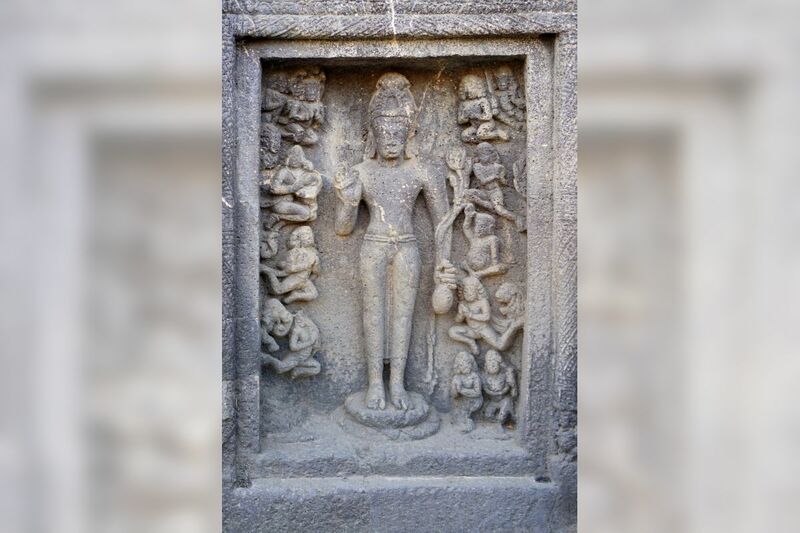 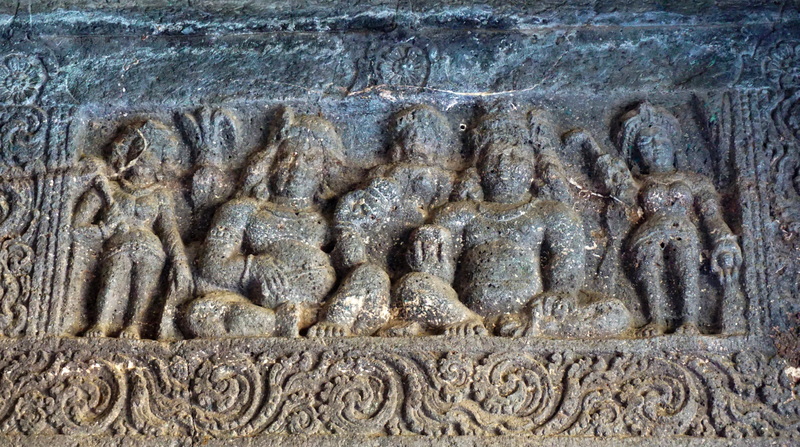 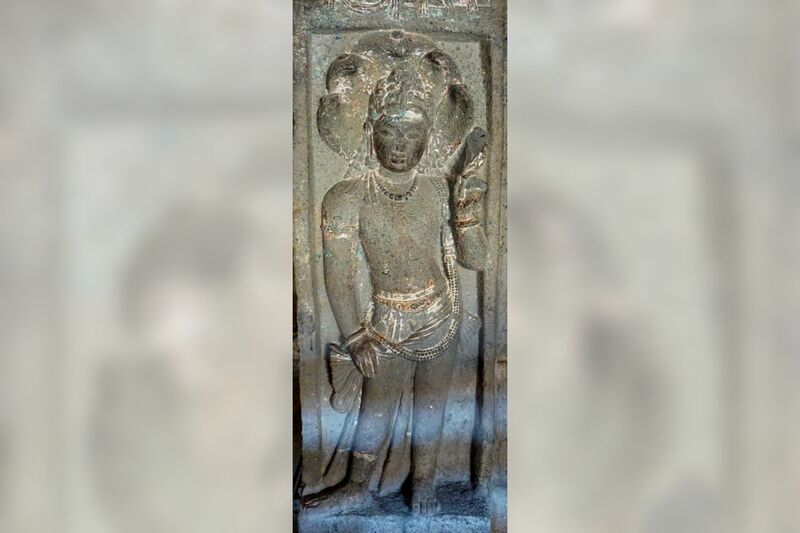 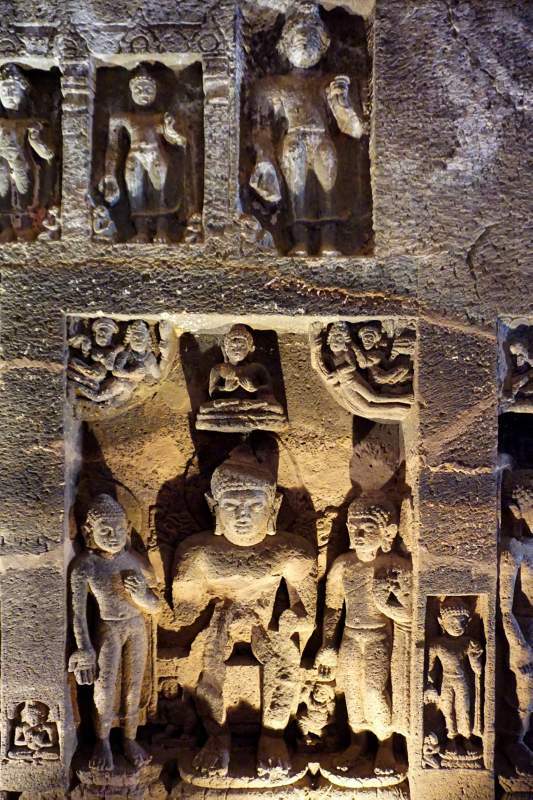 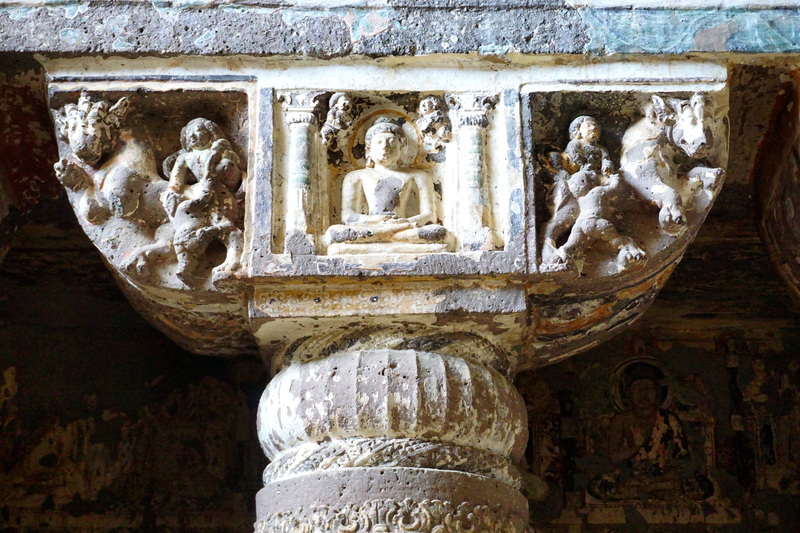 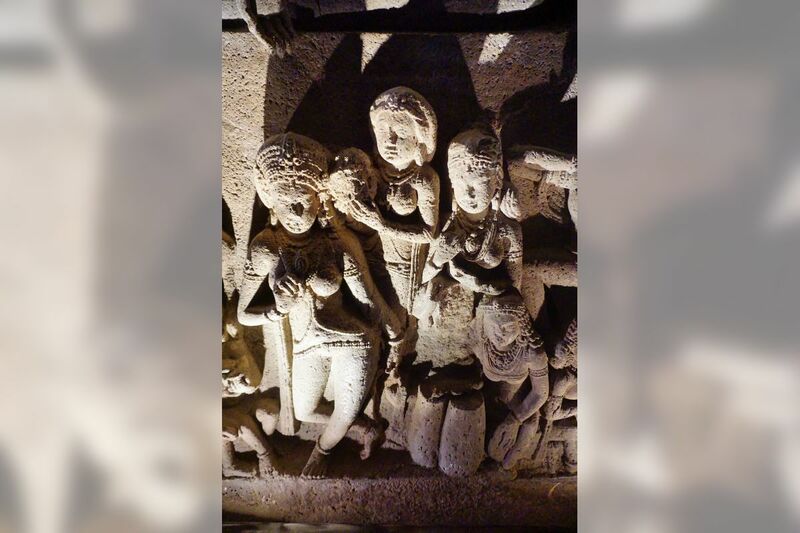 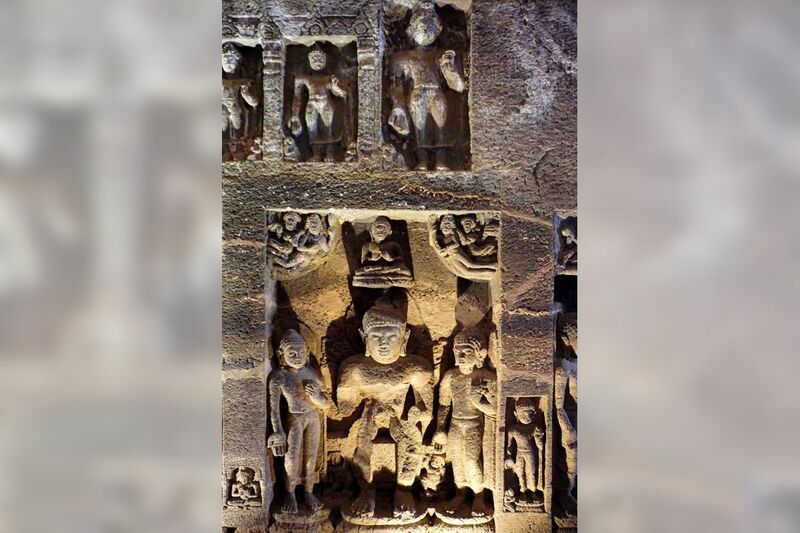 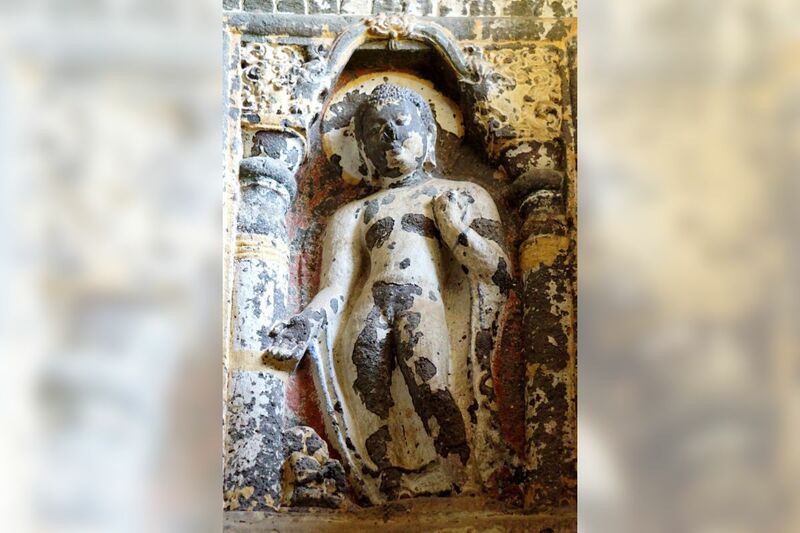 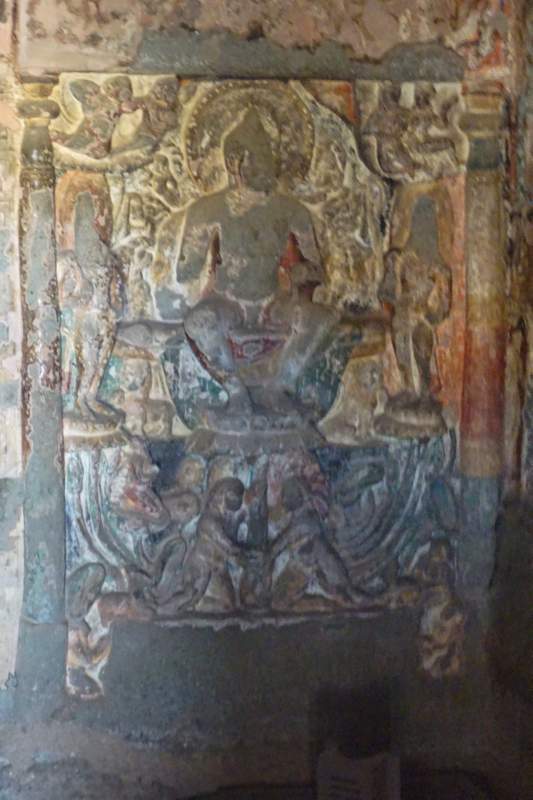 high-definition creative commons photographs from the final group of rock-cut cave temples at Ajanta (caves 19-26), Maharasthra, together with a description. Belonging to the late 5th century, this cave is a magnificent Mahāyāna Chaitya Hall and was originally painted throughout. 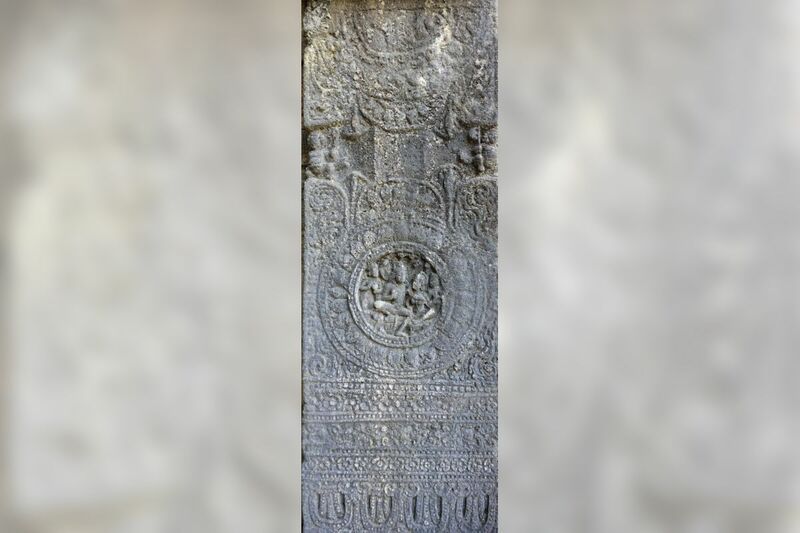 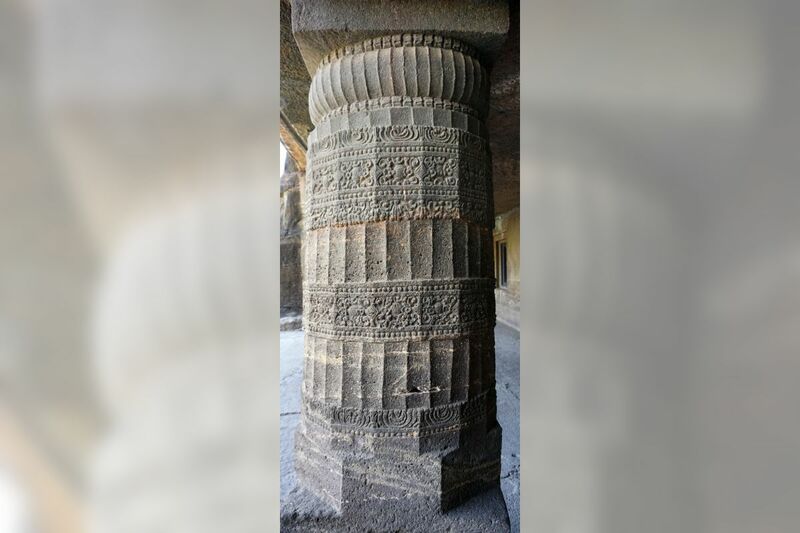 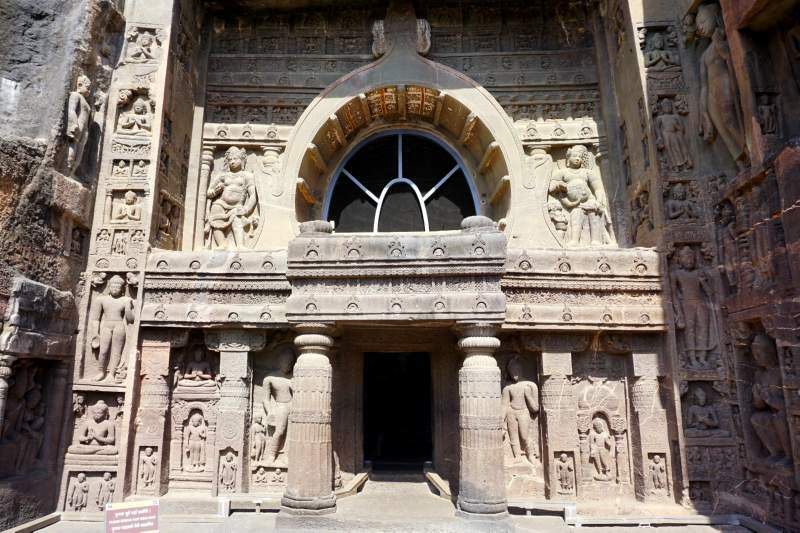 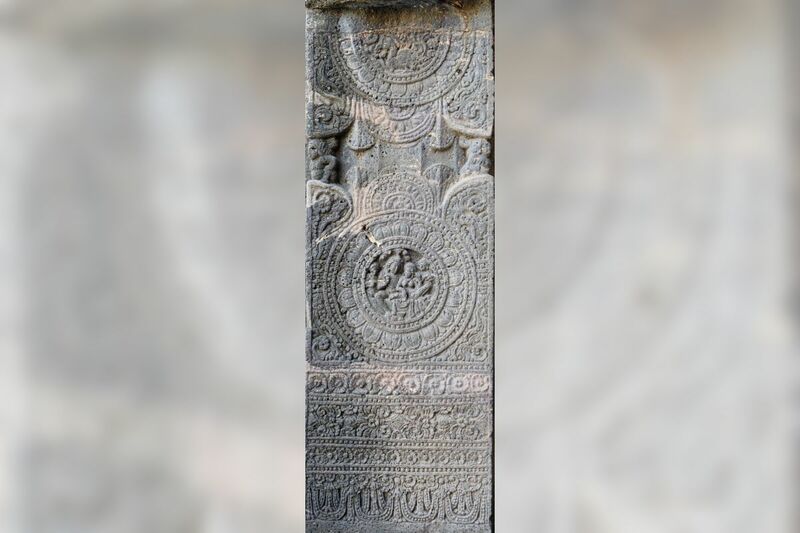 The facade is considered to be one of the most elegant in terms of execution and elaborate ornamentation, and has the arched chaitya window set into it. 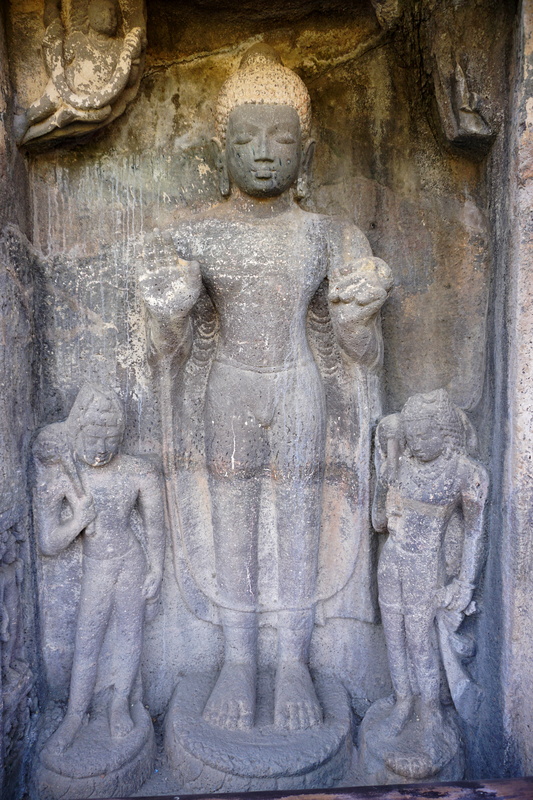 Two fine, standing Buddha figures flank the entrance. 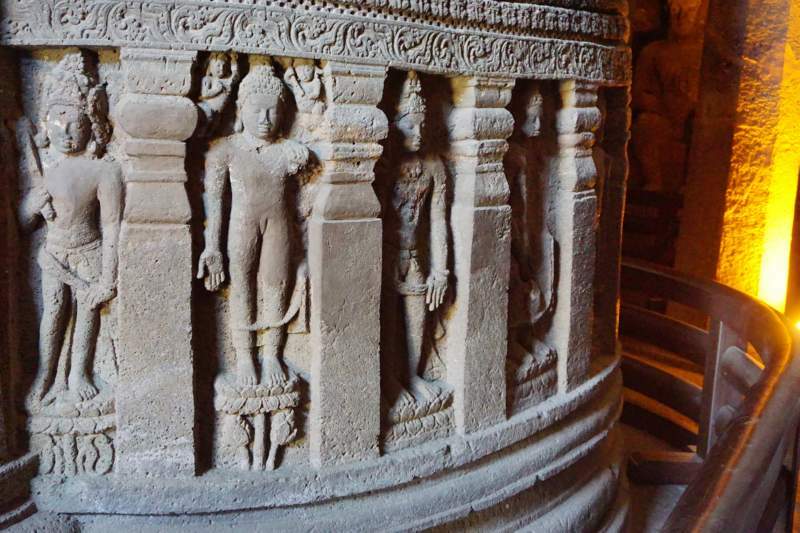 The interior is in the layout seen before, with two rows of richly decorated columns leading up to and around the back of the standing Buddha, which here is in front of the slender stūpa. 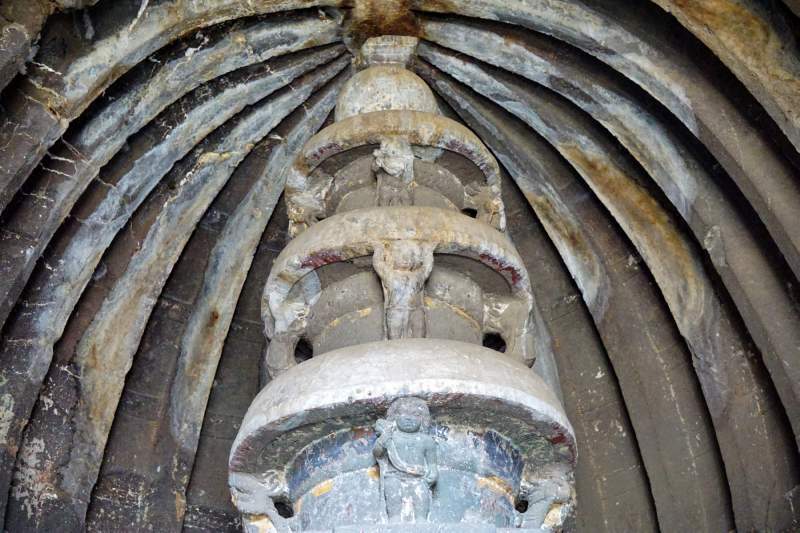 This tall shrine has a triple stone umbrella above it. 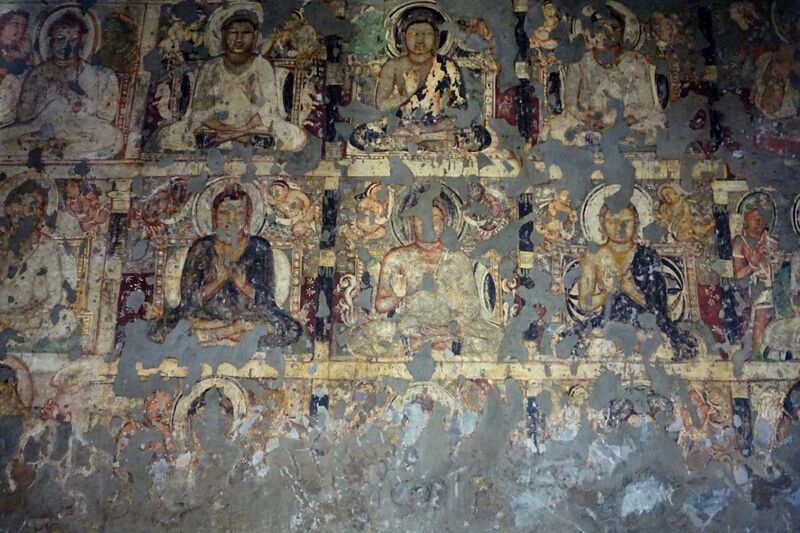 This is a beautiful monastery excavated on a higher level during the 6th century AD. 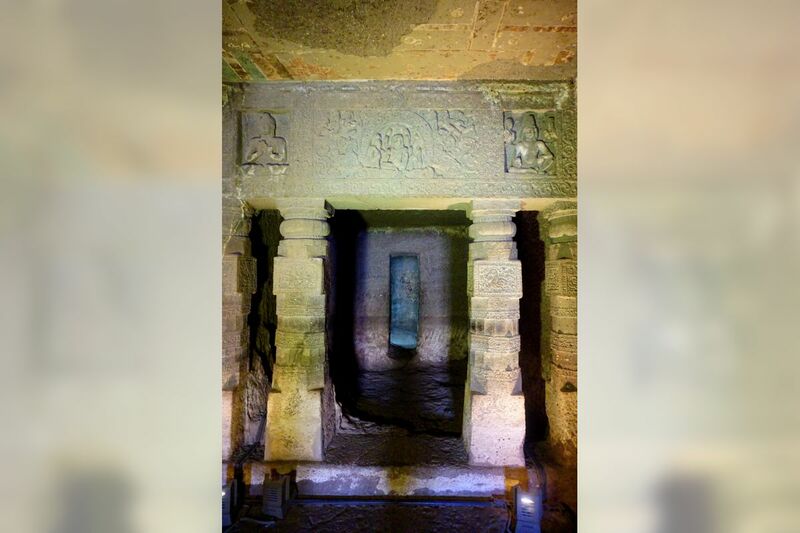 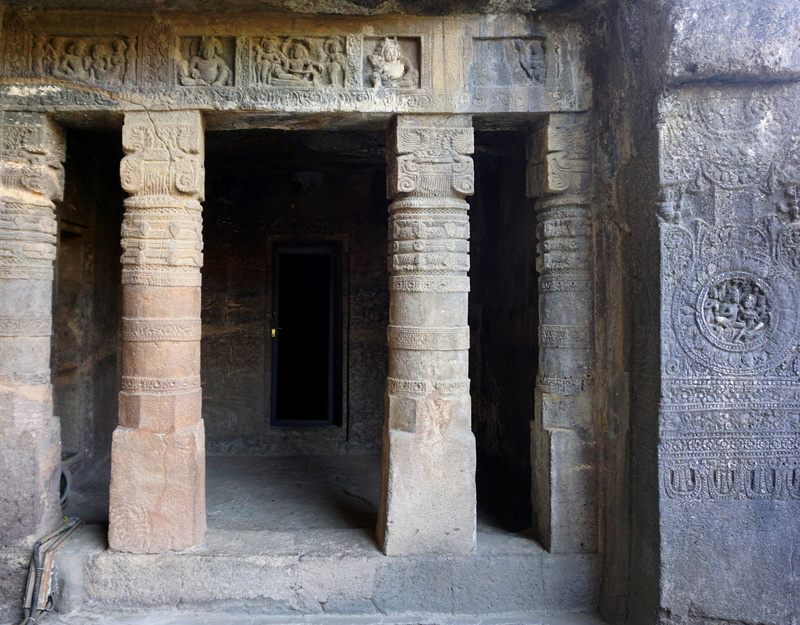 It consists of a pillared veranda, a sanctum with an antechamber and cells along the wall. 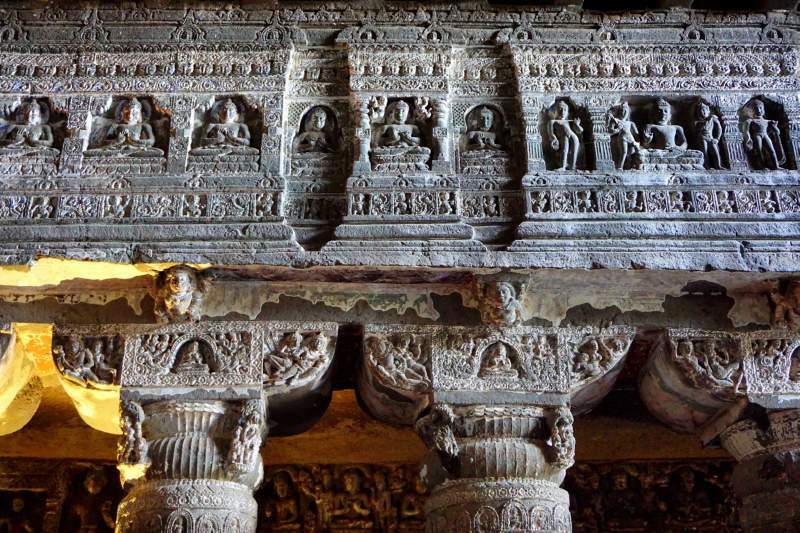 Twelve massive pillars support the roof of the hall where flora, fauna, celestial figures and worshippers are carved in great detail. 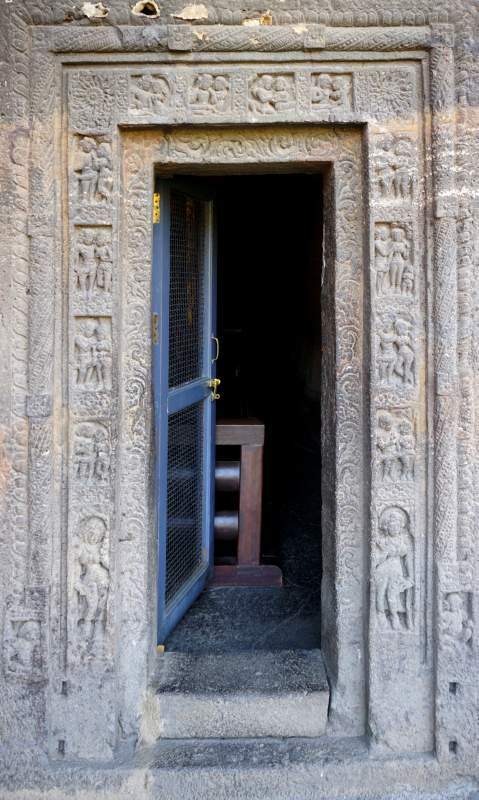 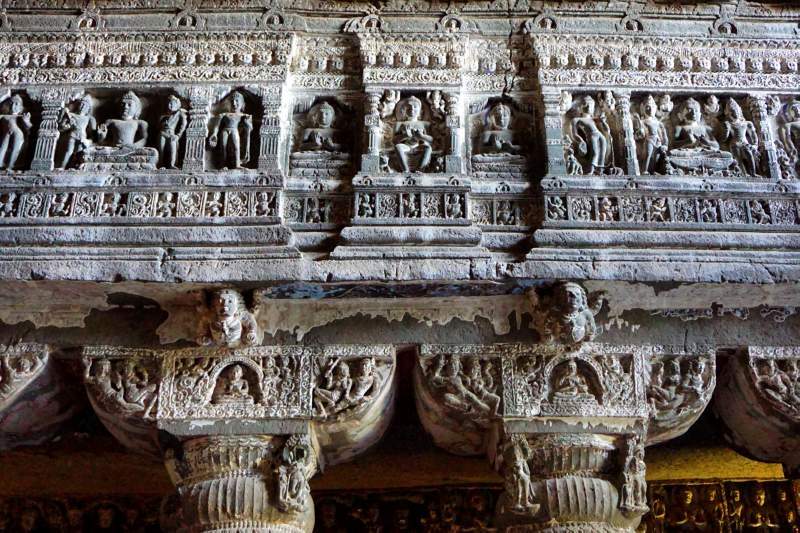 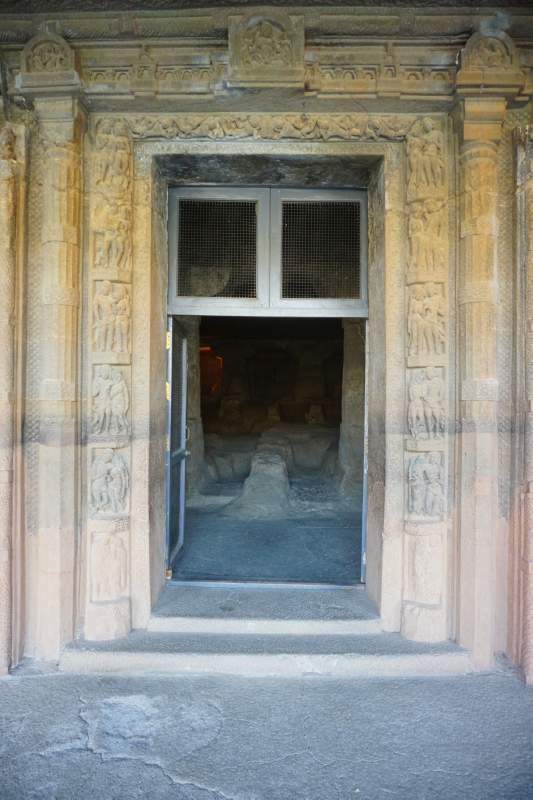 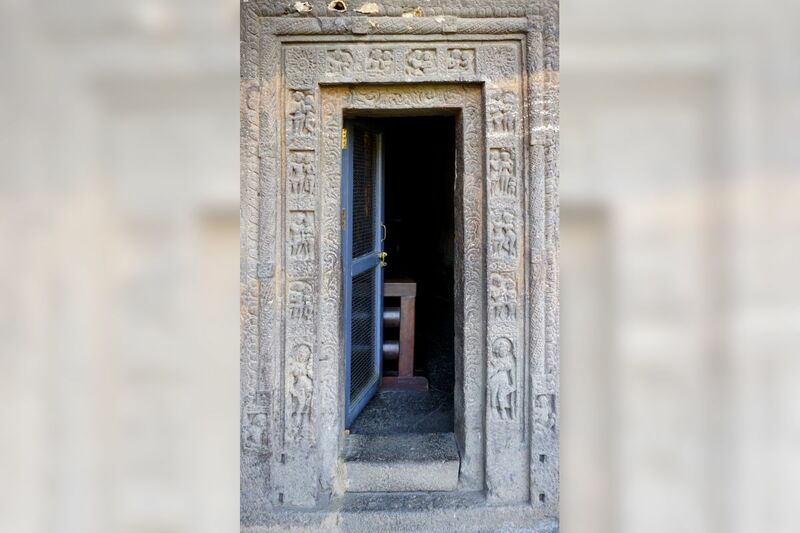 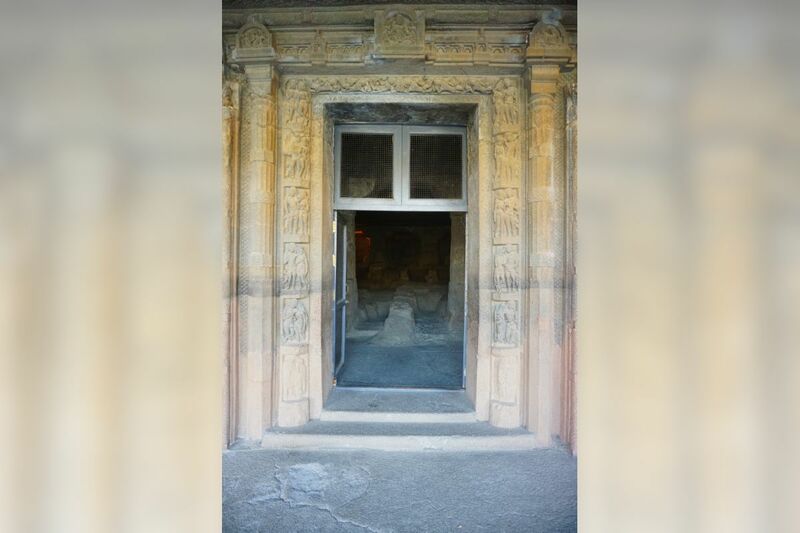 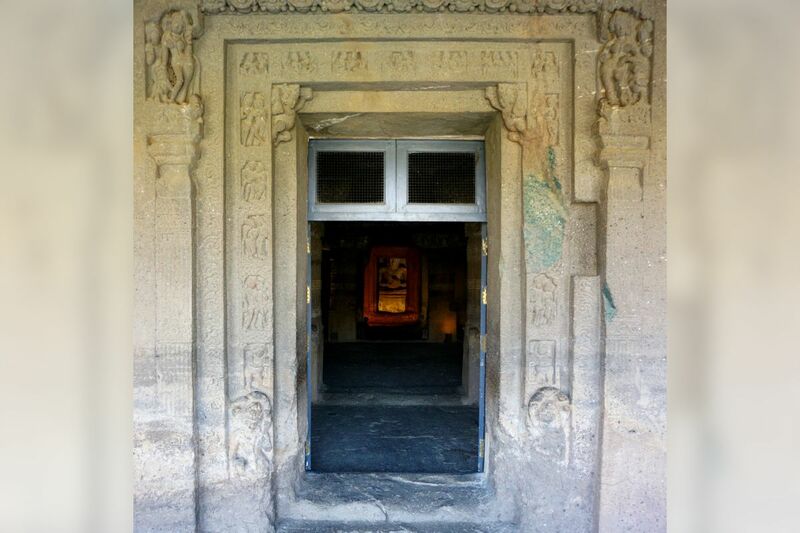 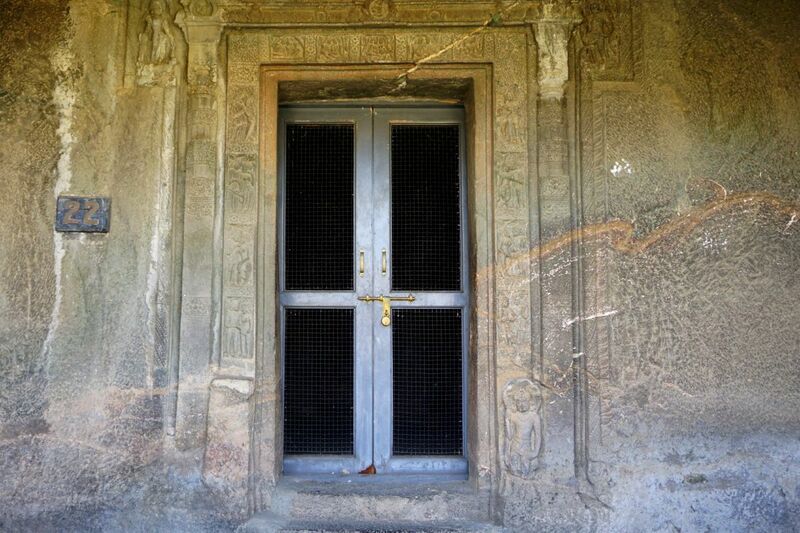 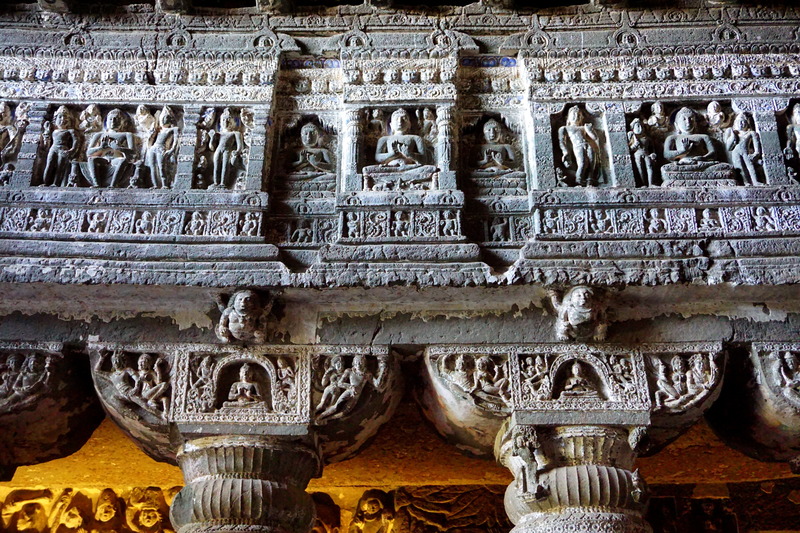 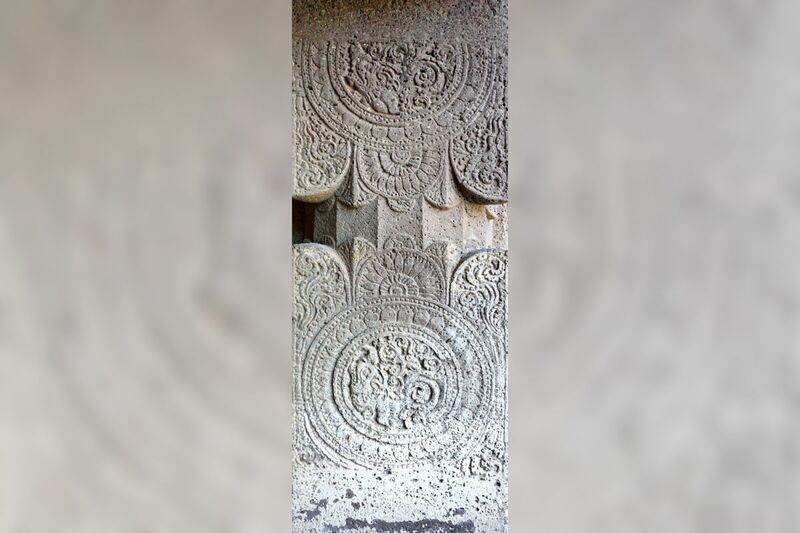 The door frames and window frames are also carved with beautiful designs and sculptures. 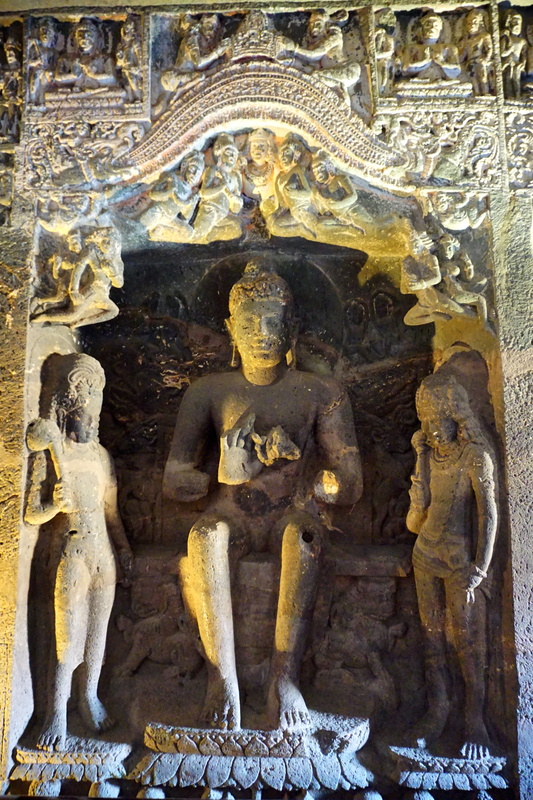 The sanctum houses a seated Buddha in Dharmacakra posture, flanked by Bodhisattvas as fly-whisk bearers and celestial figures. 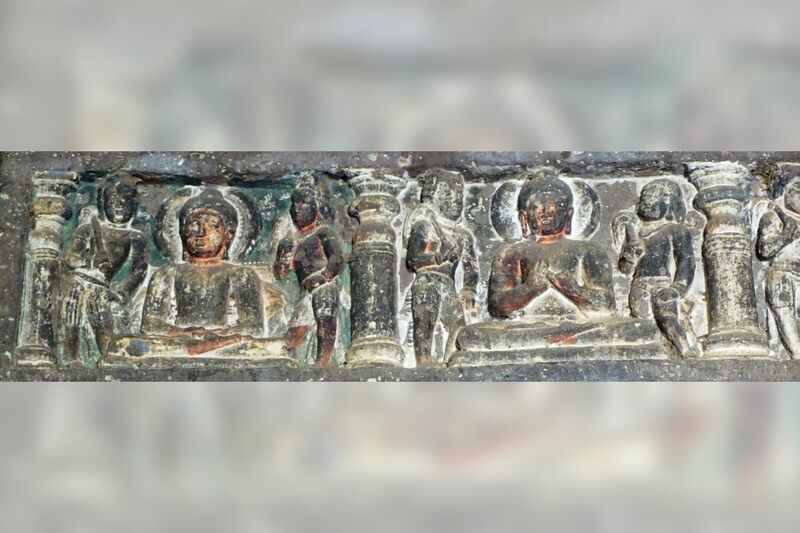 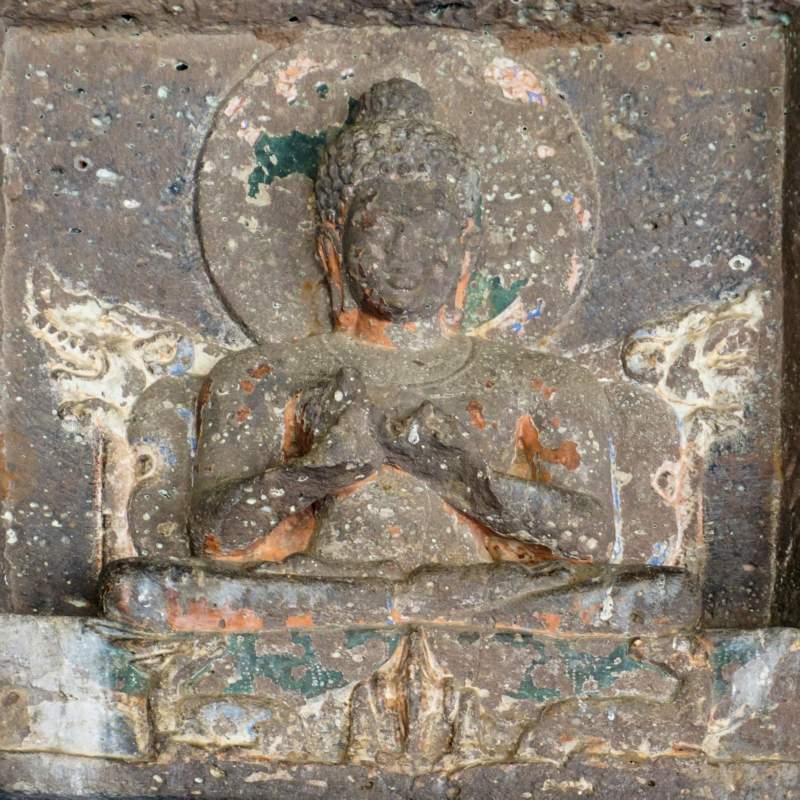 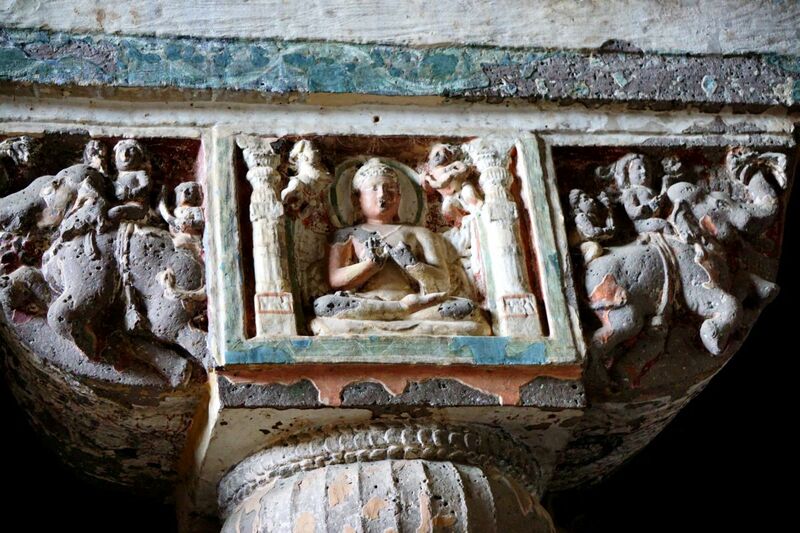 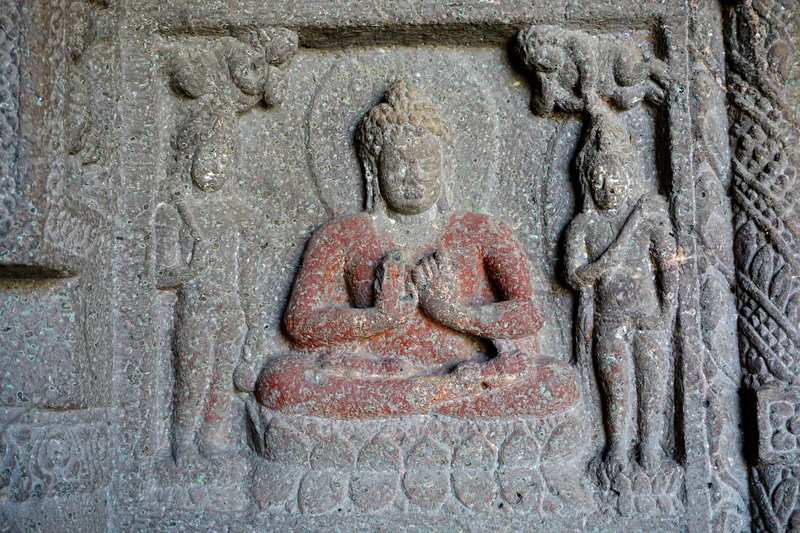 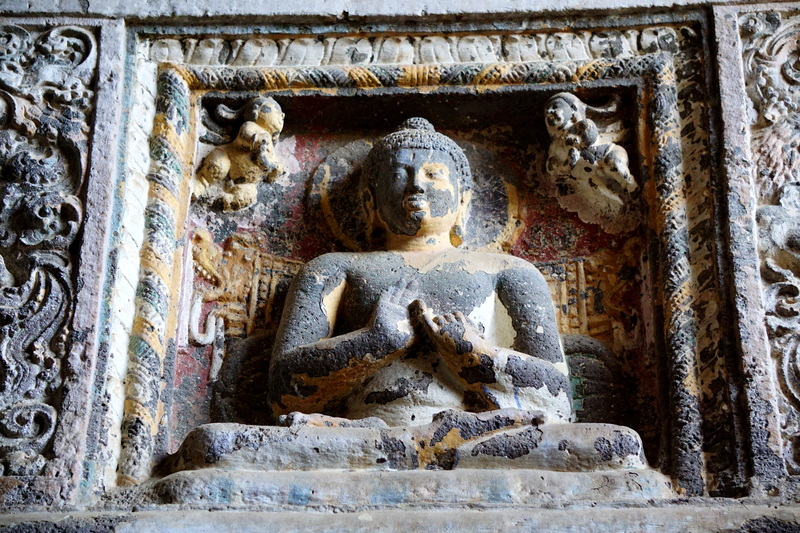 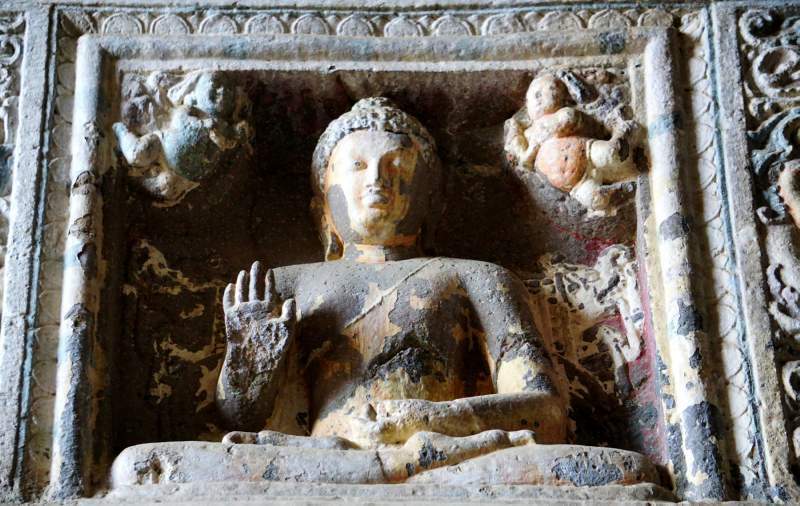 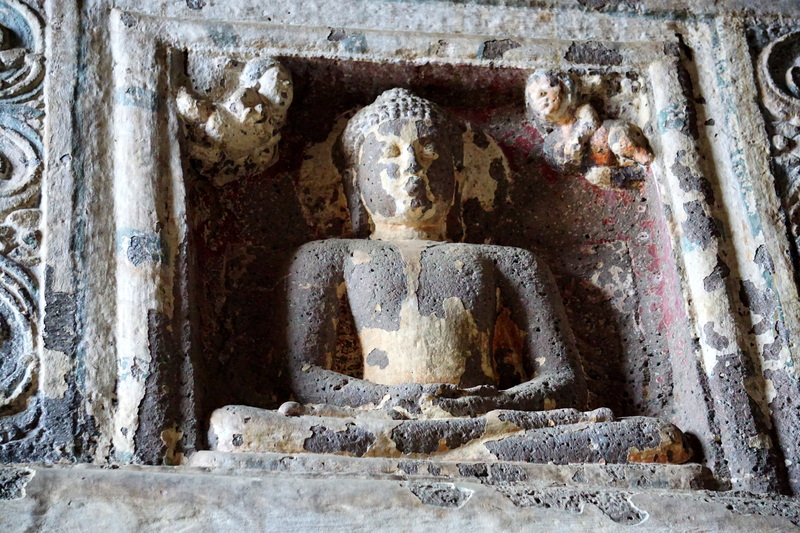 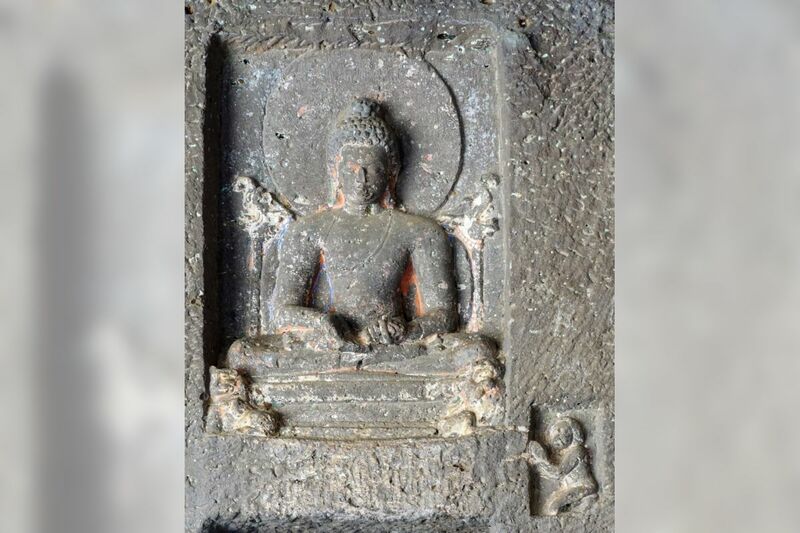 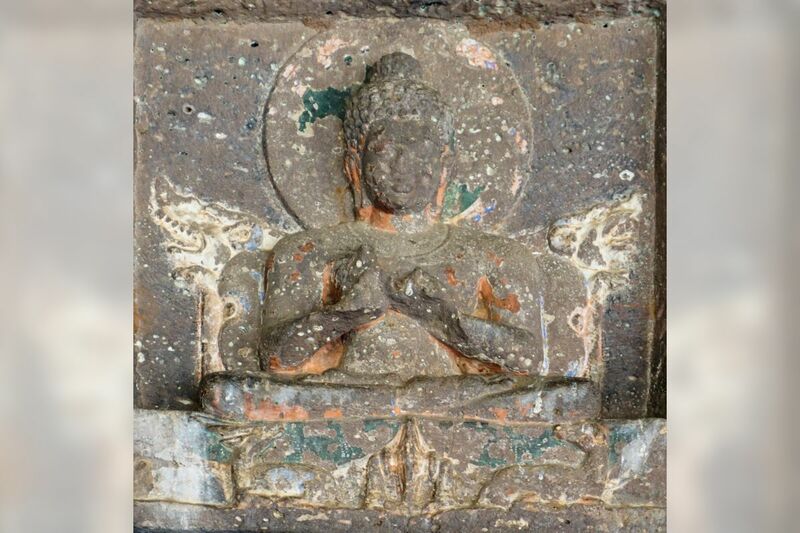 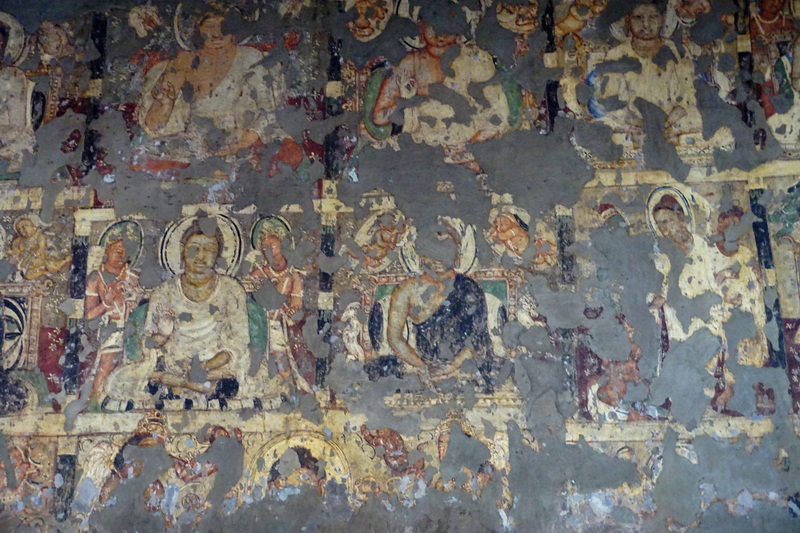 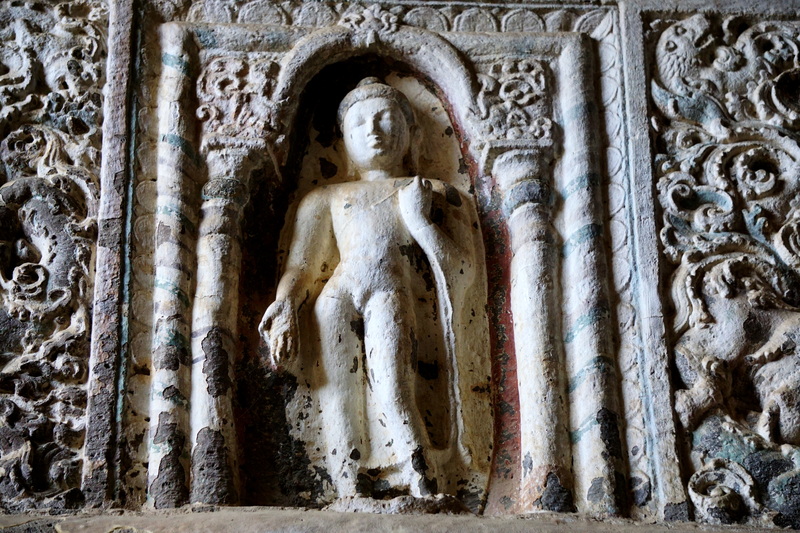 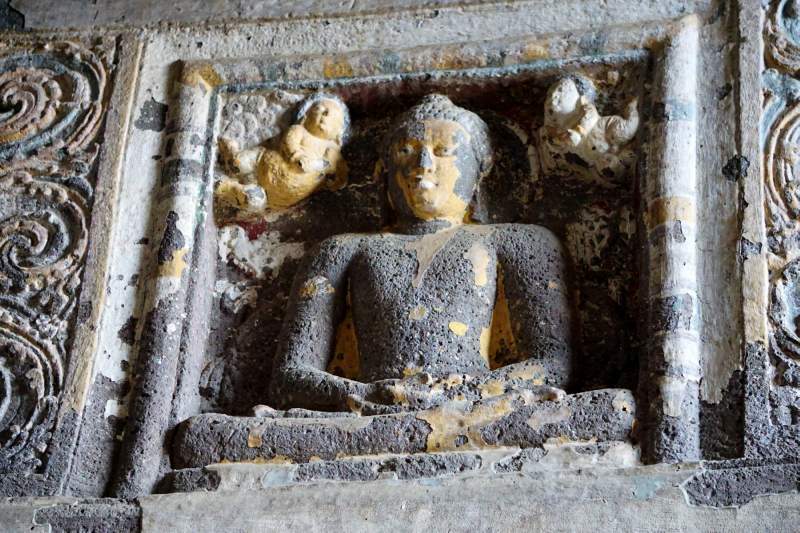 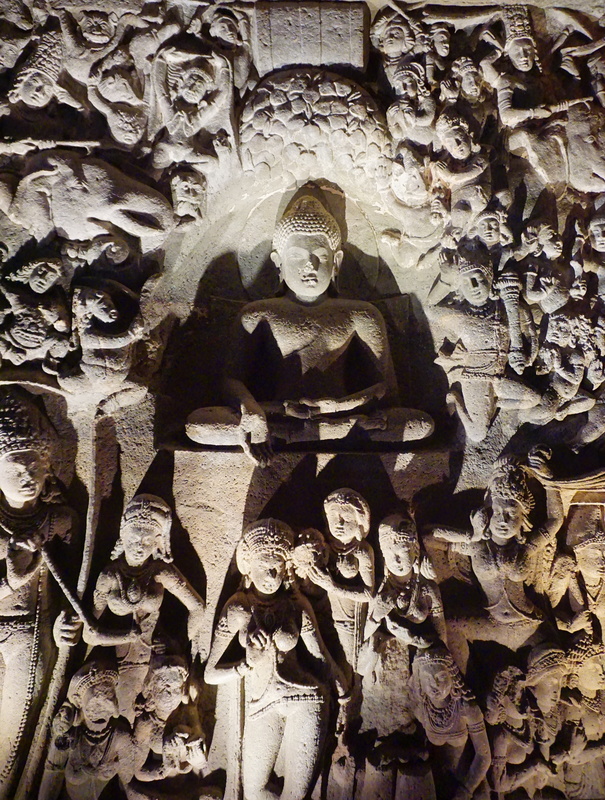 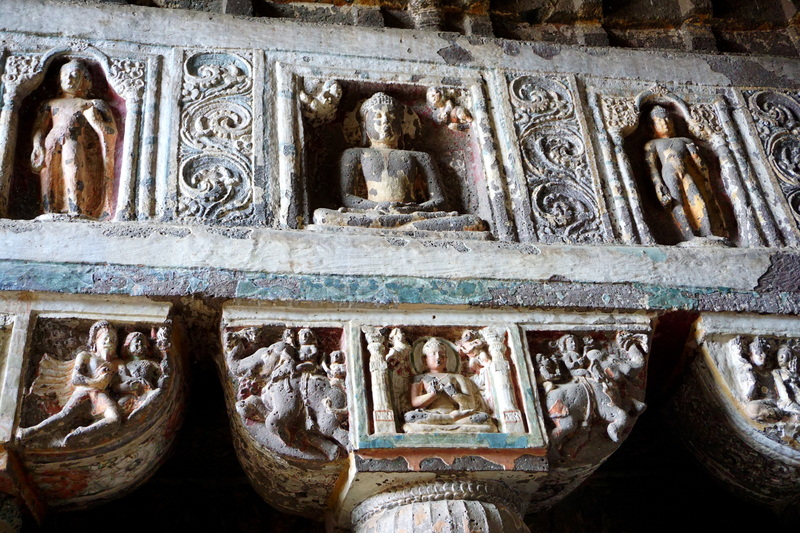 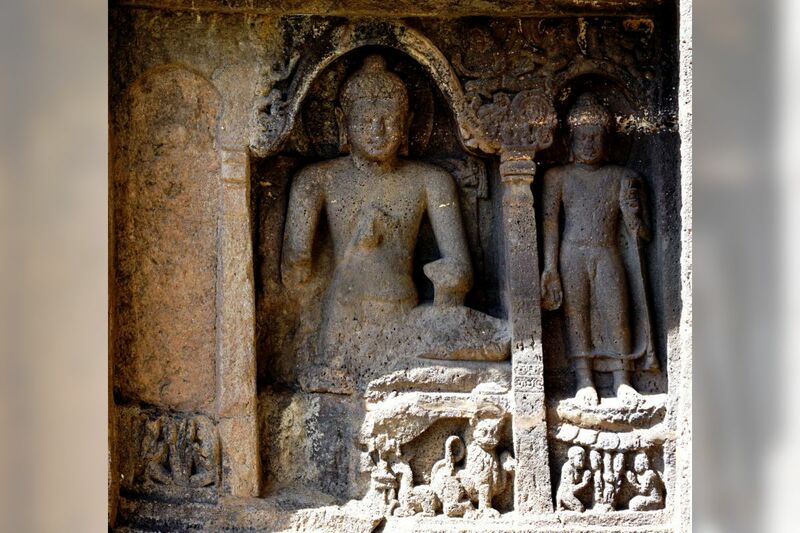 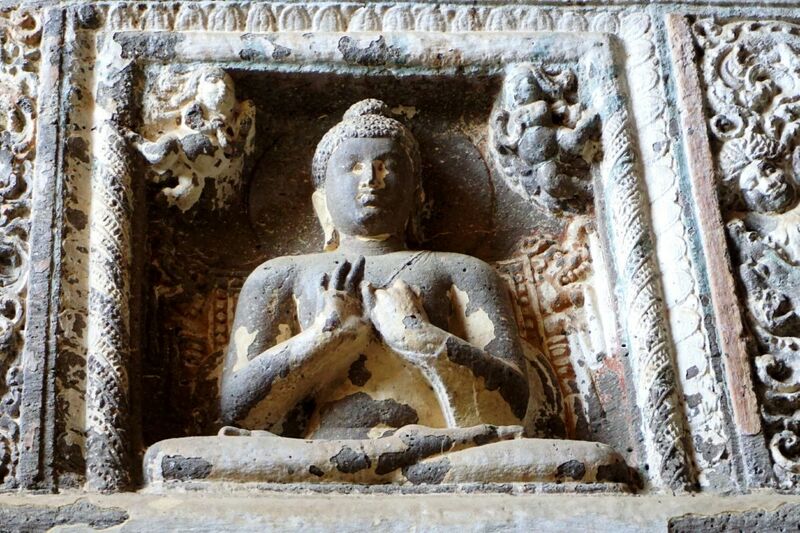 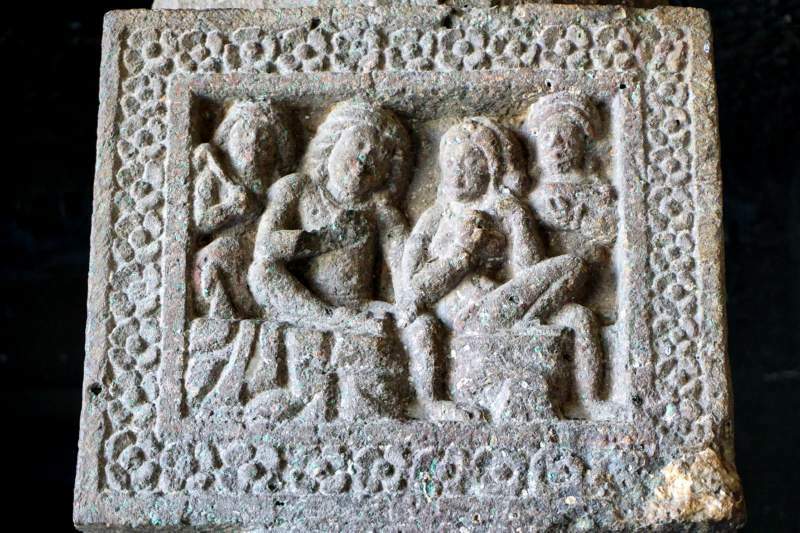 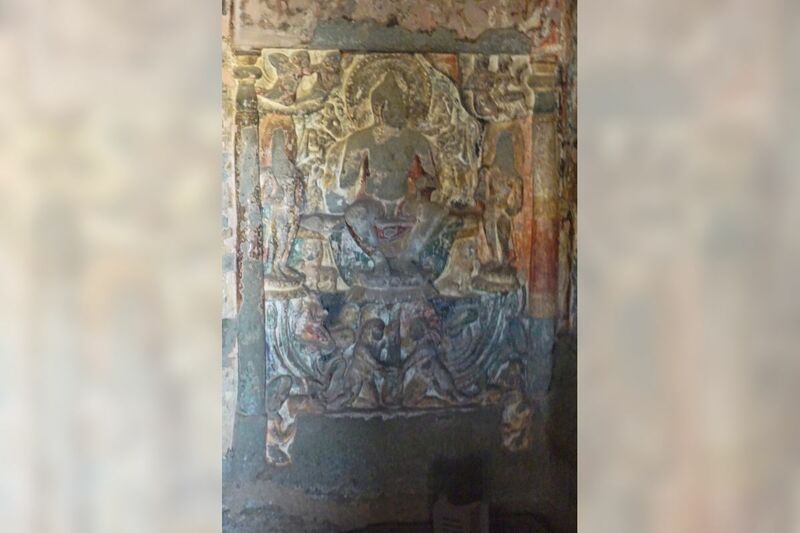 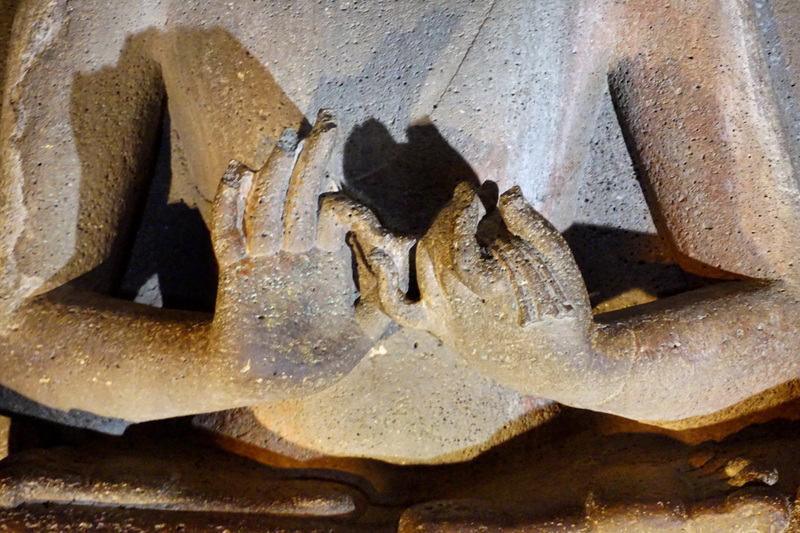 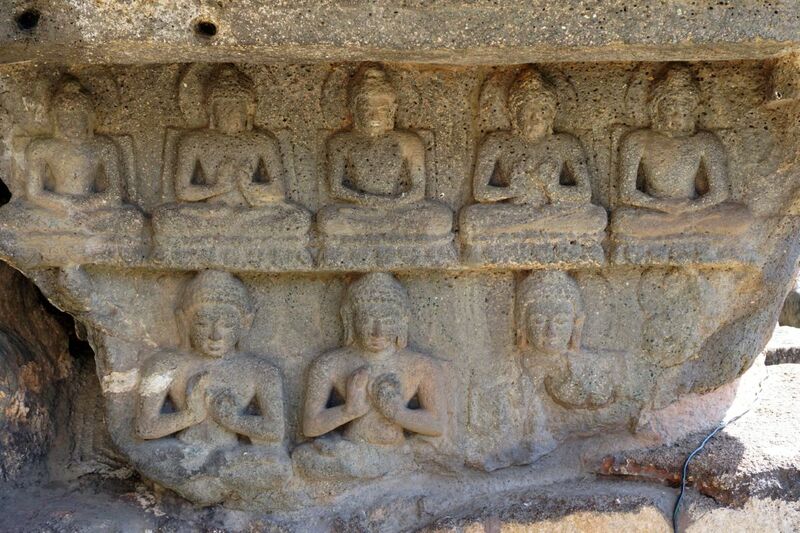 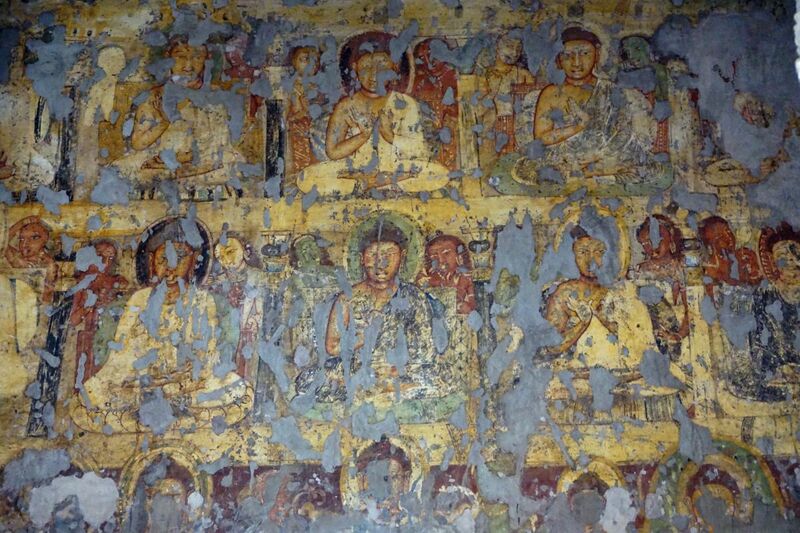 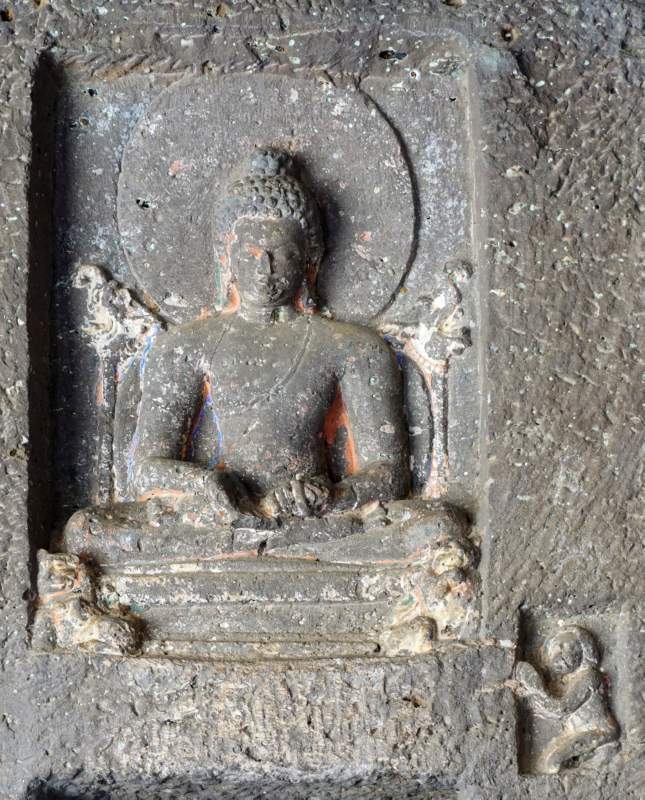 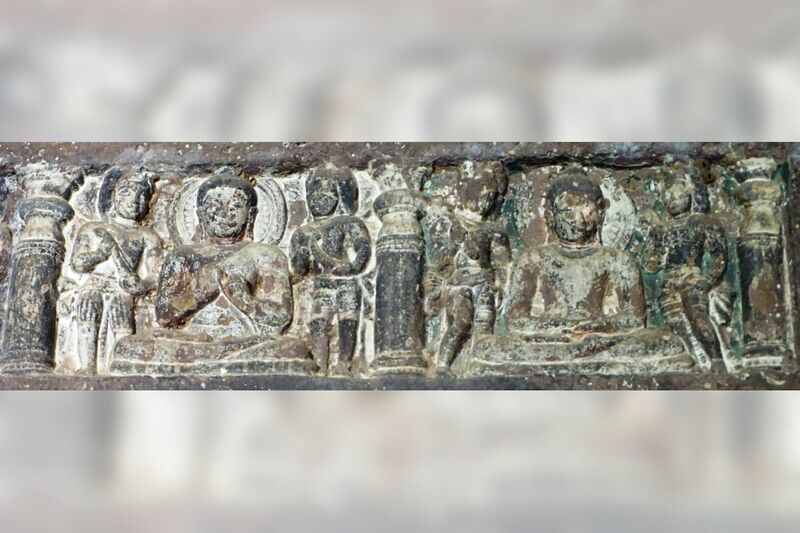 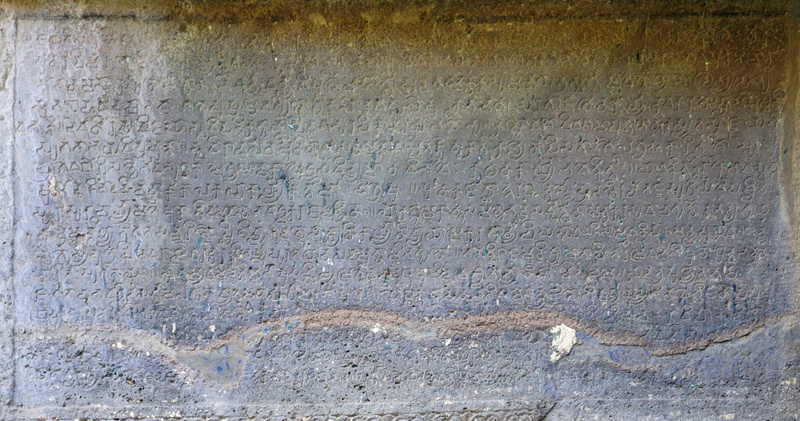 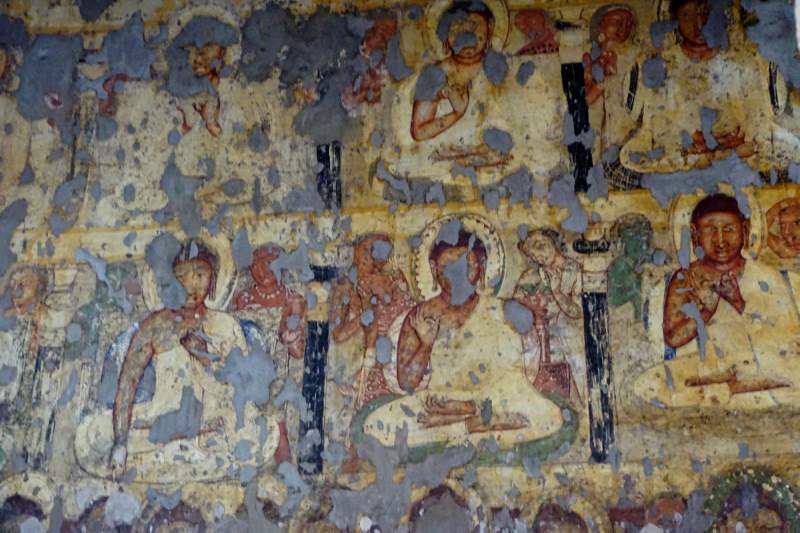 Traces of paintings depicting Buddha teaching a congregation can be seen. 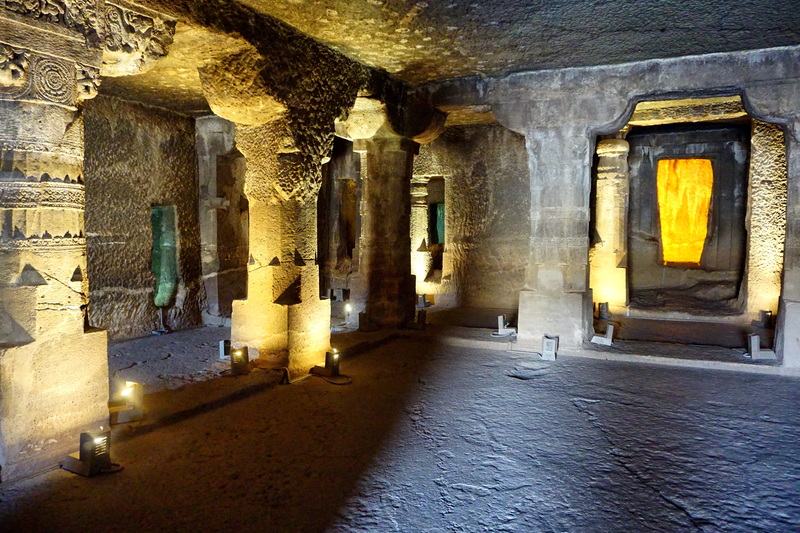 This is an incomplete monastery but ranks the second largest excavation at Ajaṇṭā. 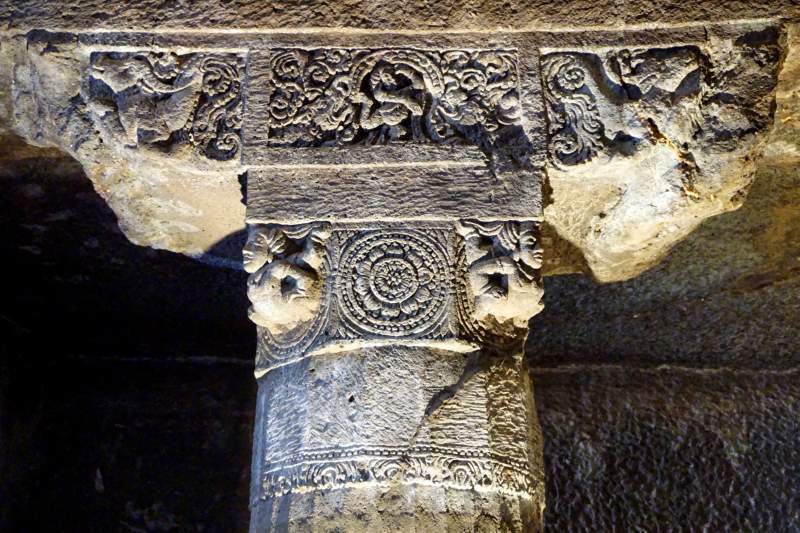 The work was stopped before completion and on the basis of architecture and design it is assigned to 7th century A.D. 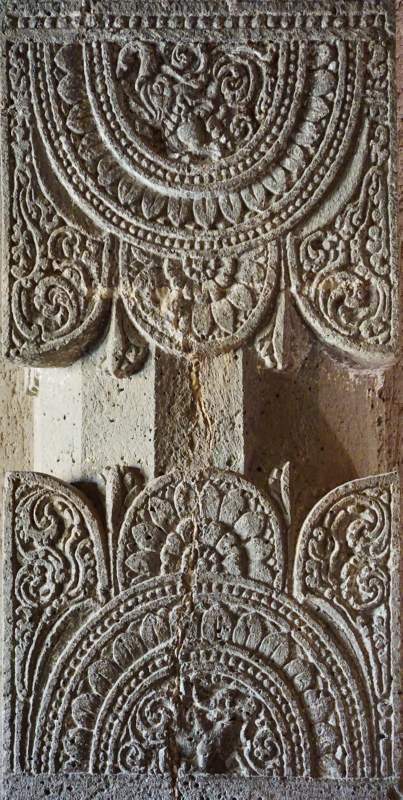 The pillars are lavishly carved with vase and foliage, couples and medallions. 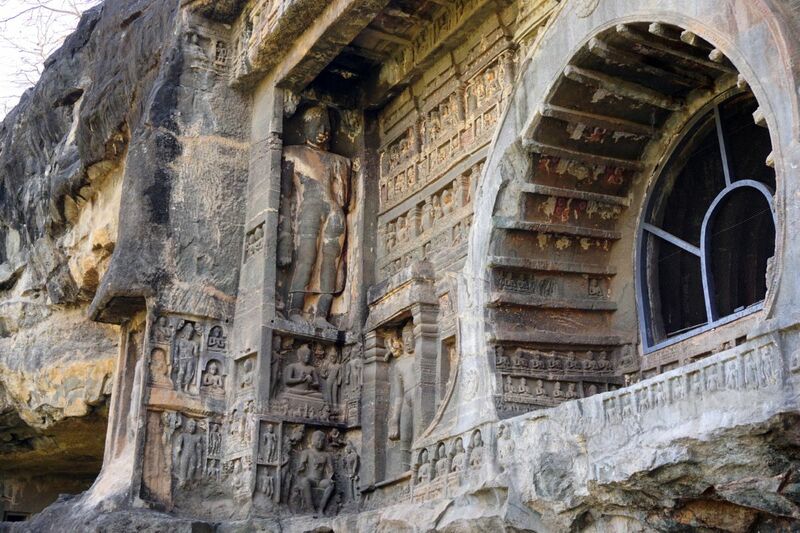 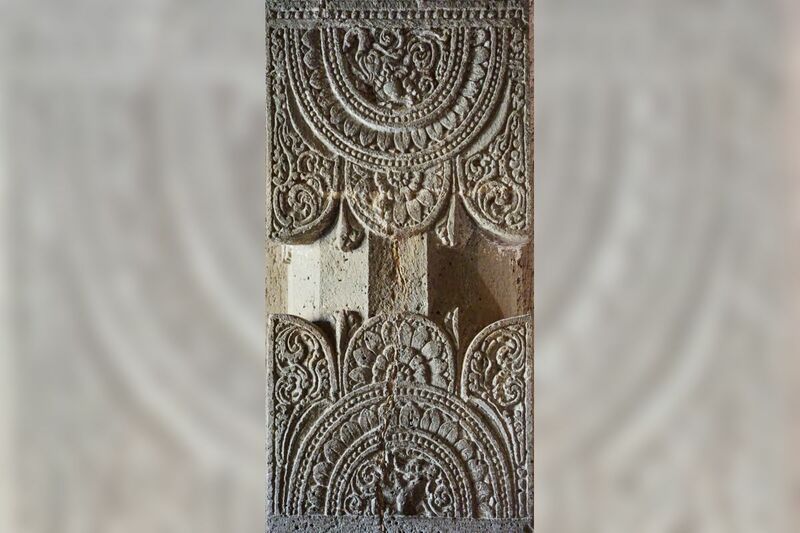 The door frame and window frame are also intricately carved. Only the verandah with raised pillar porches on either side is finished. The unfinished hall gives us the idea of the distribution of works. 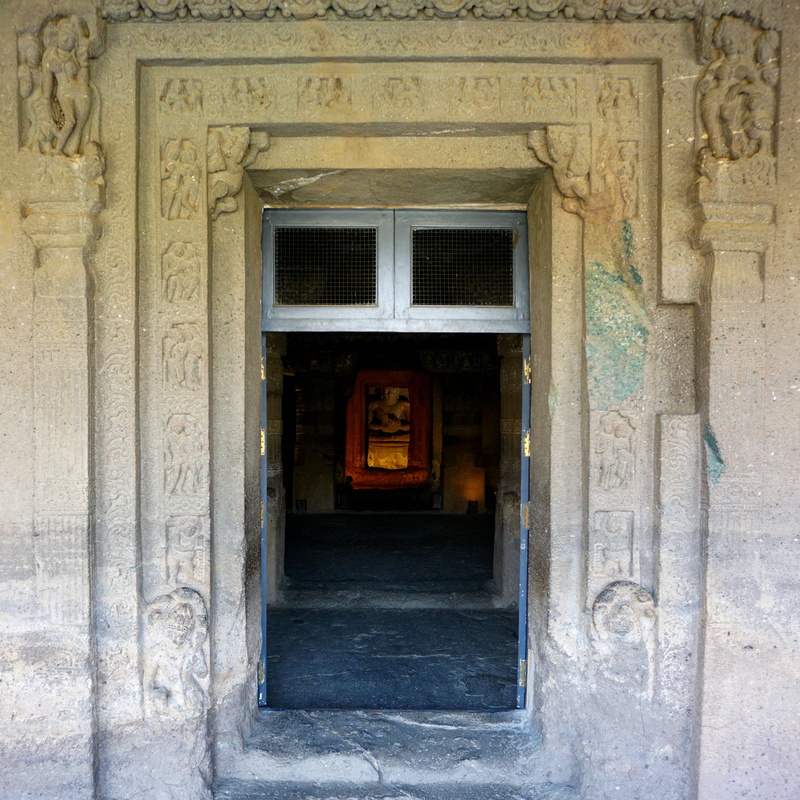 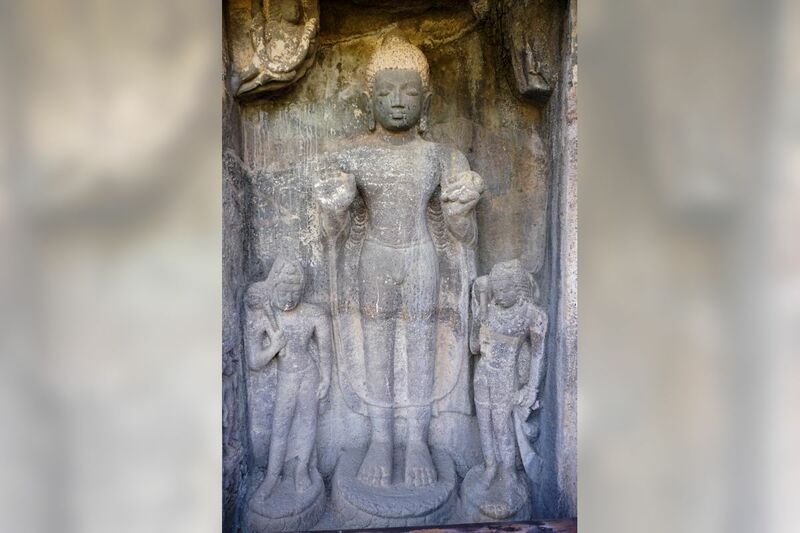 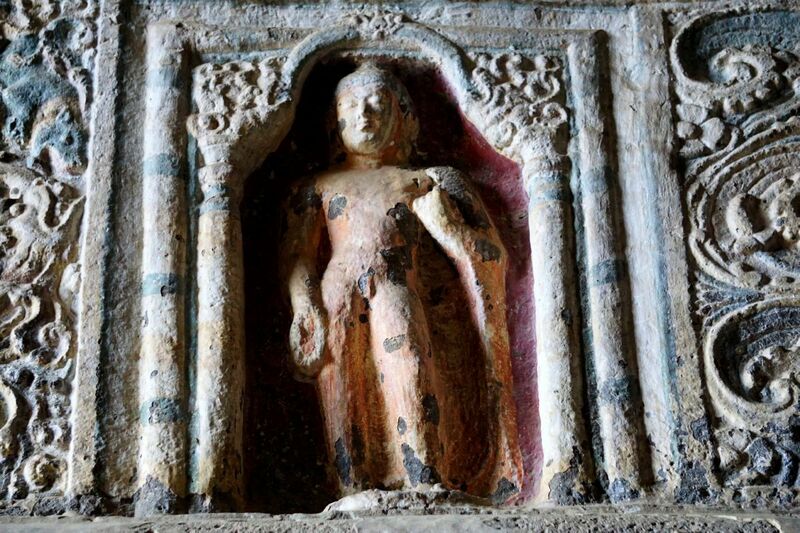 The cell in the courtyard and verandah contain the images of Lord Buddha with Bodhisattvas holding fly-whisks and celestial figures hovering above. 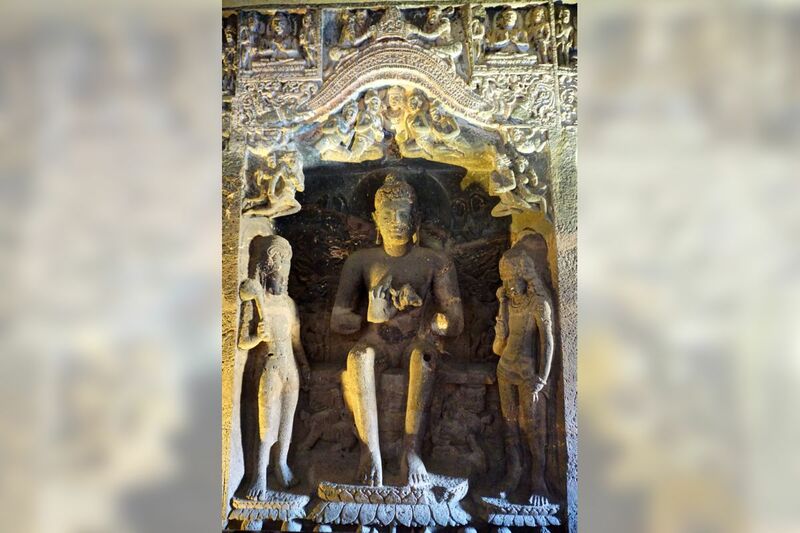 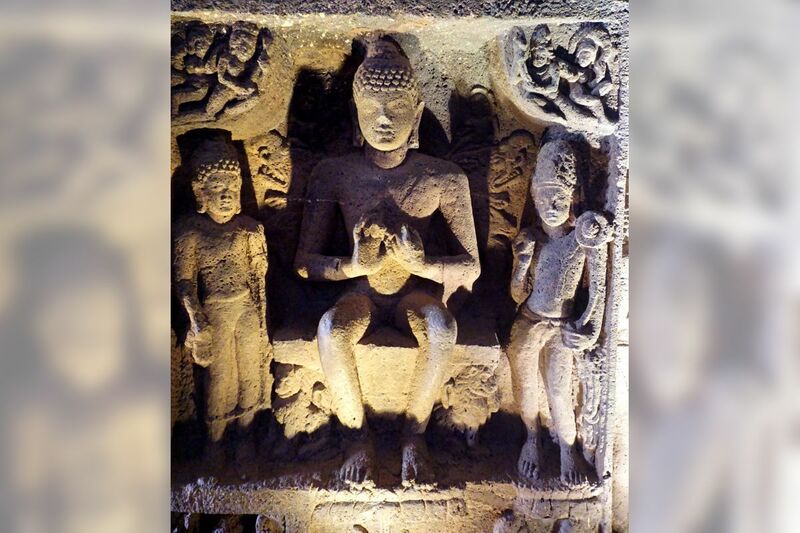 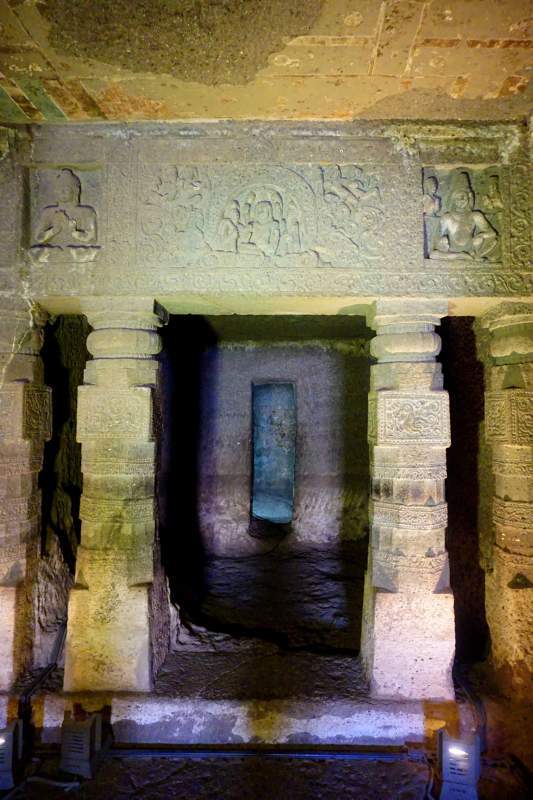 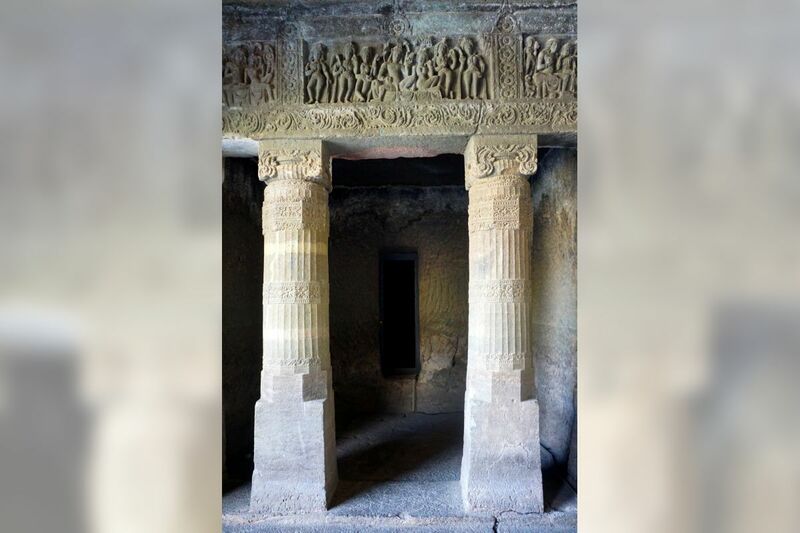 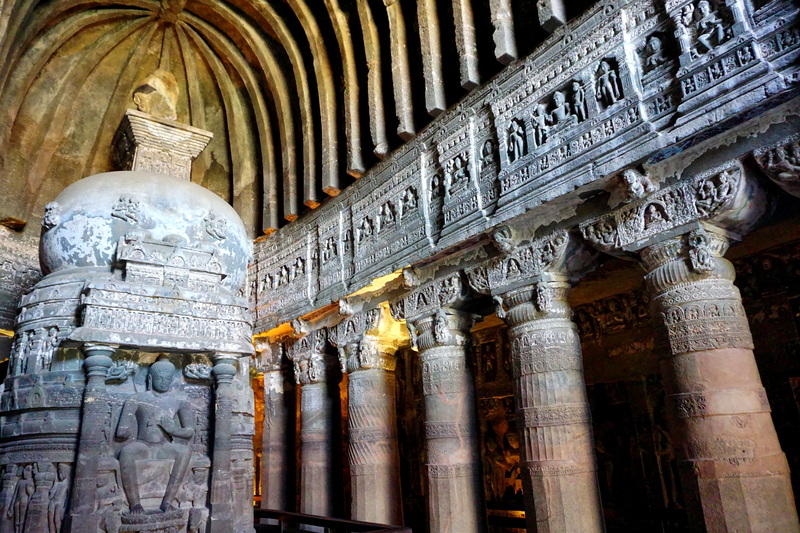 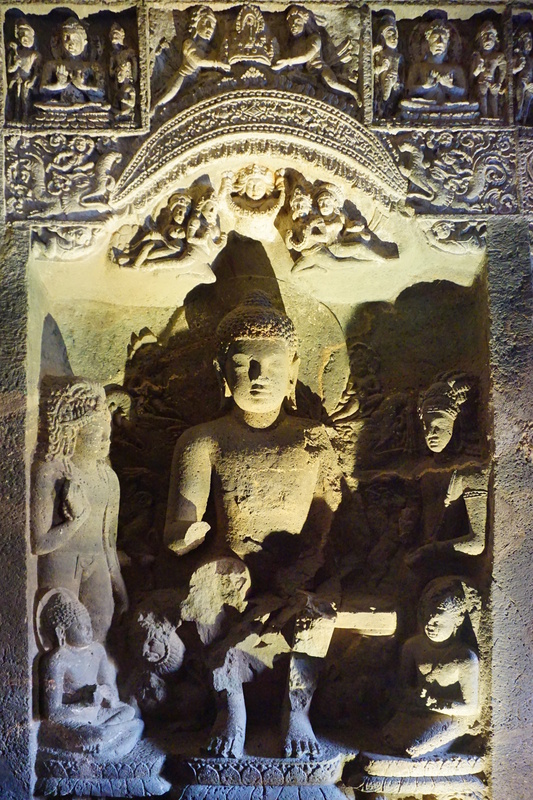 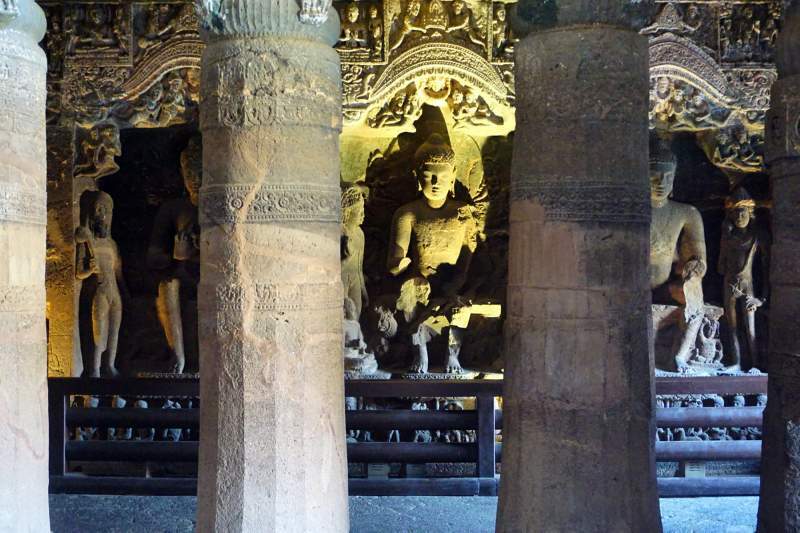 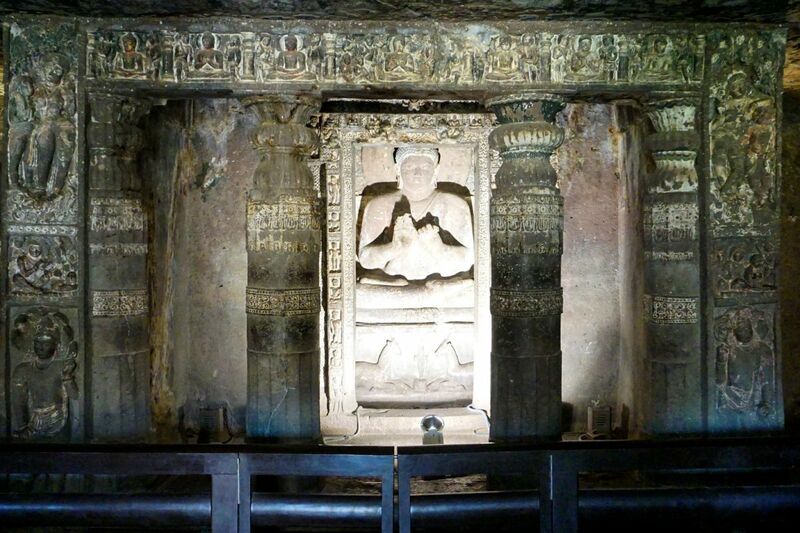 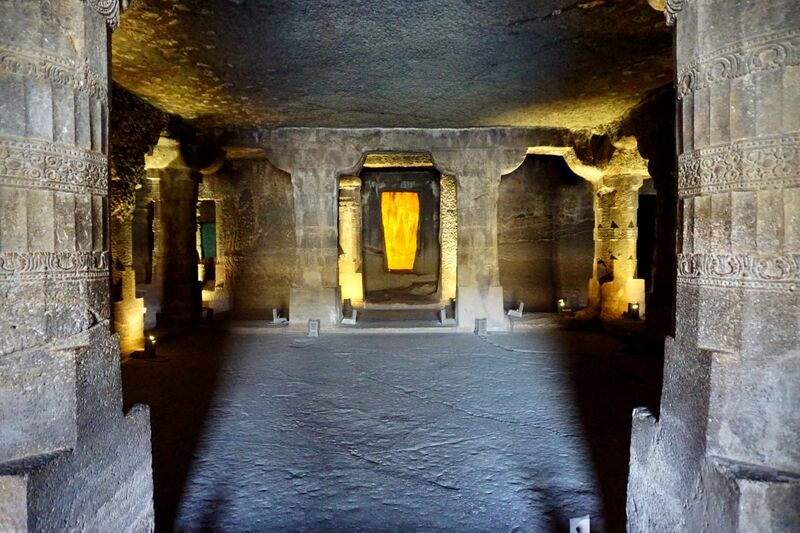 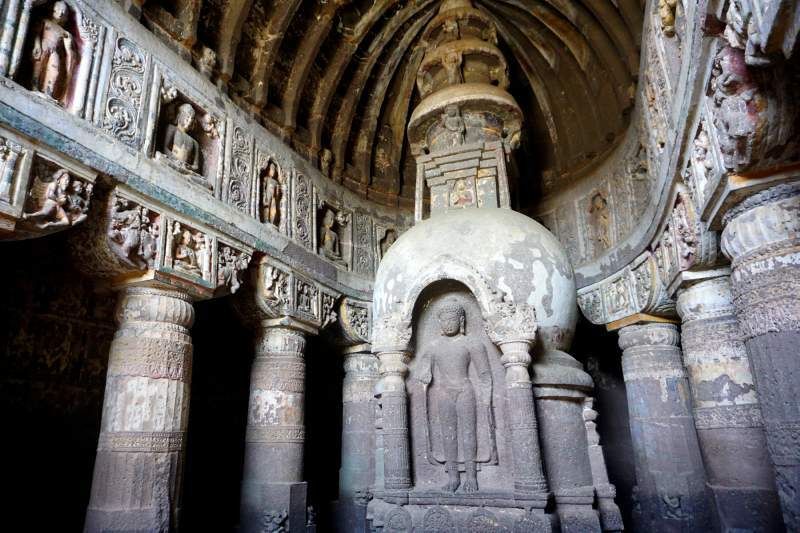 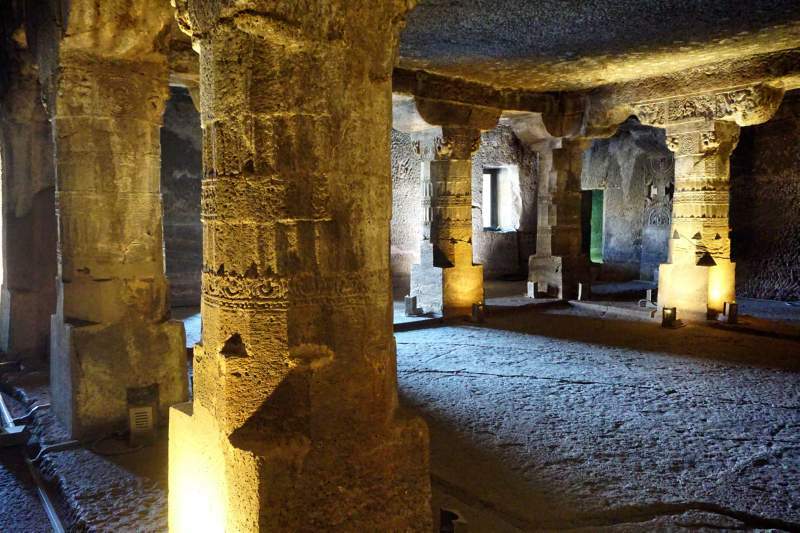 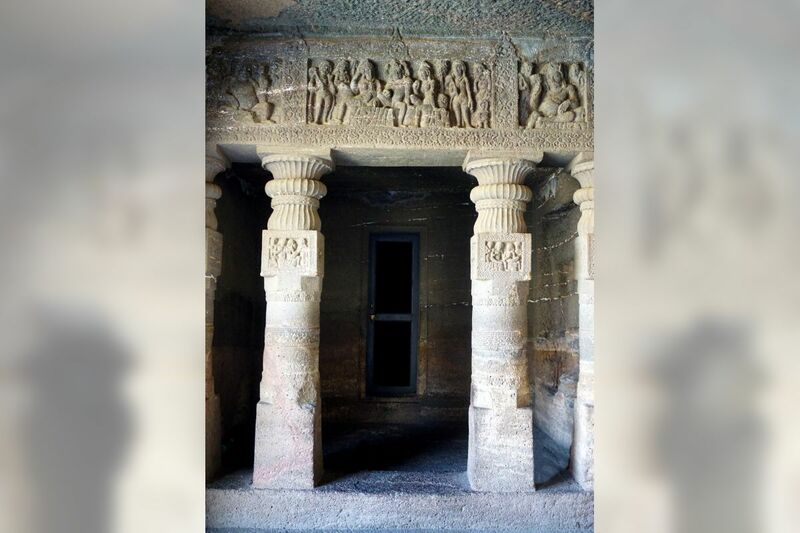 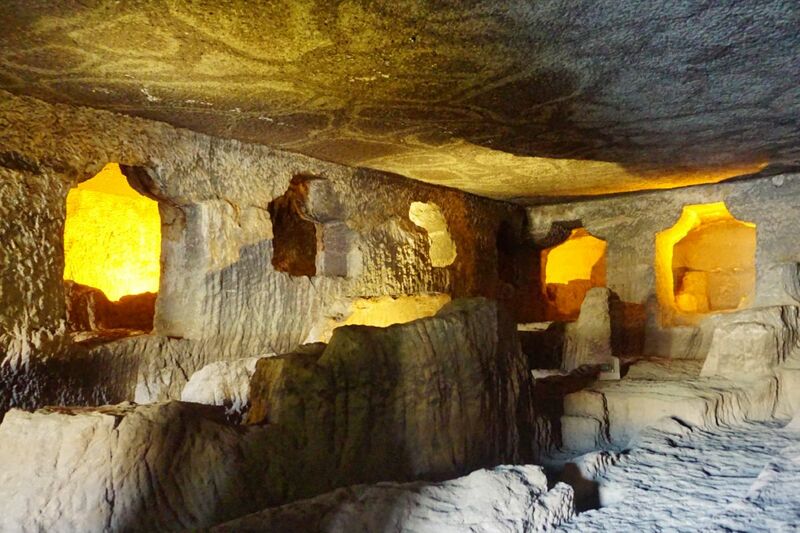 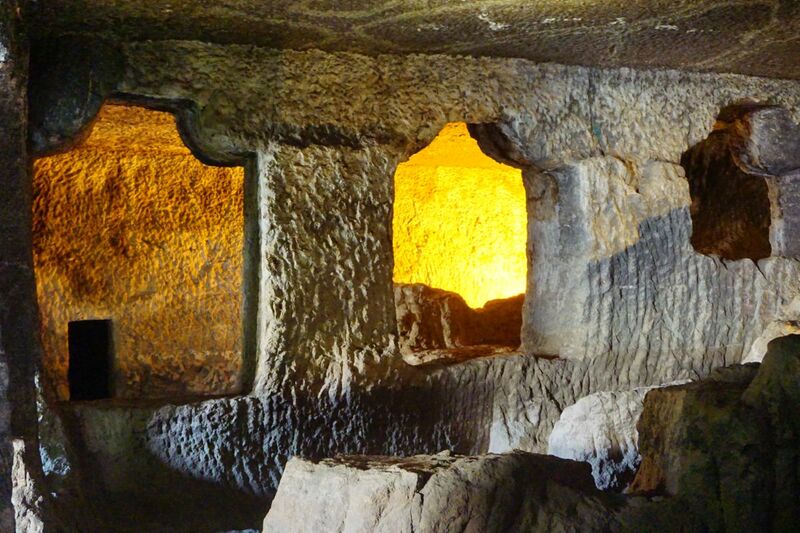 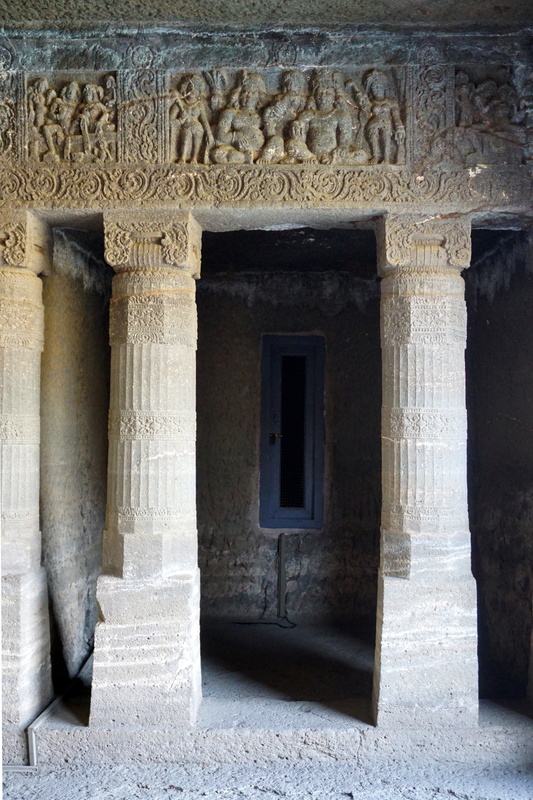 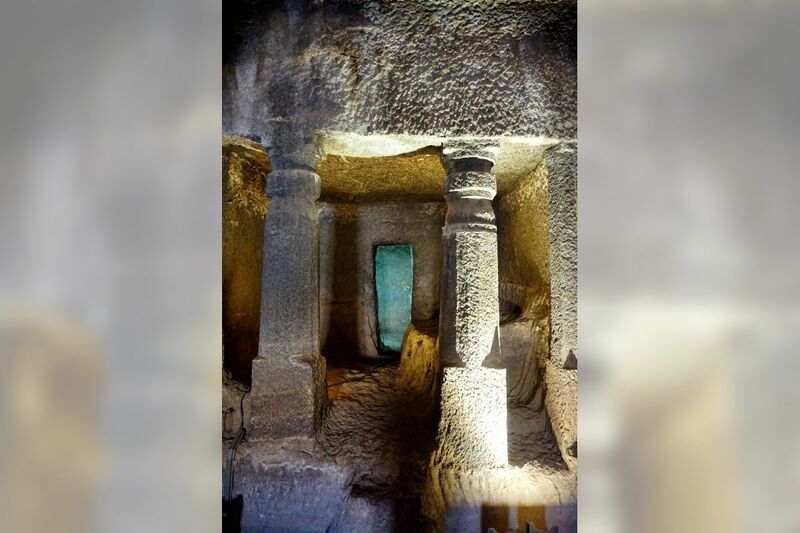 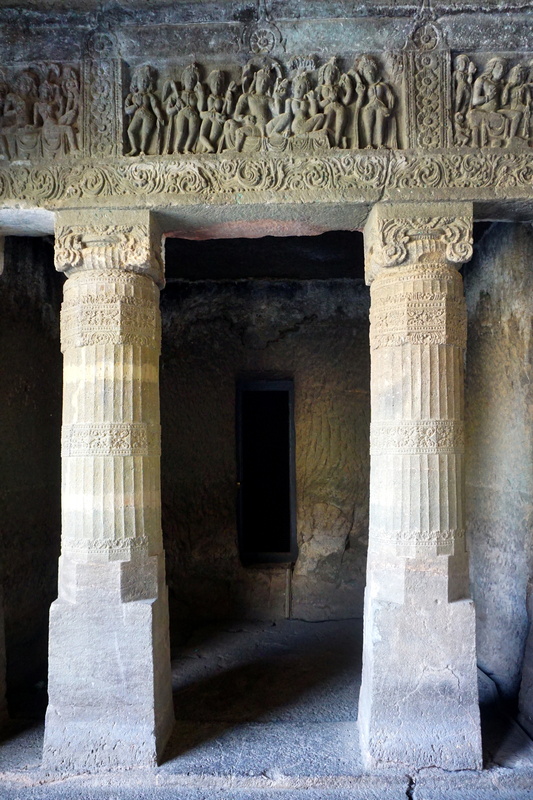 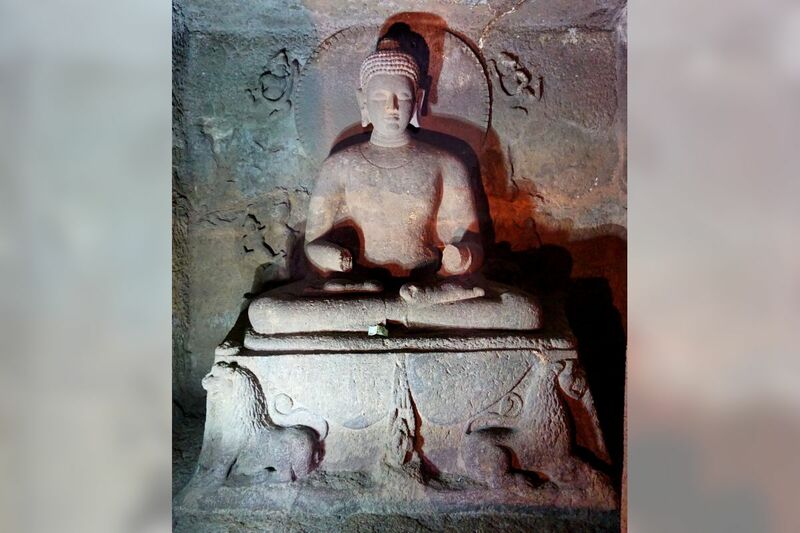 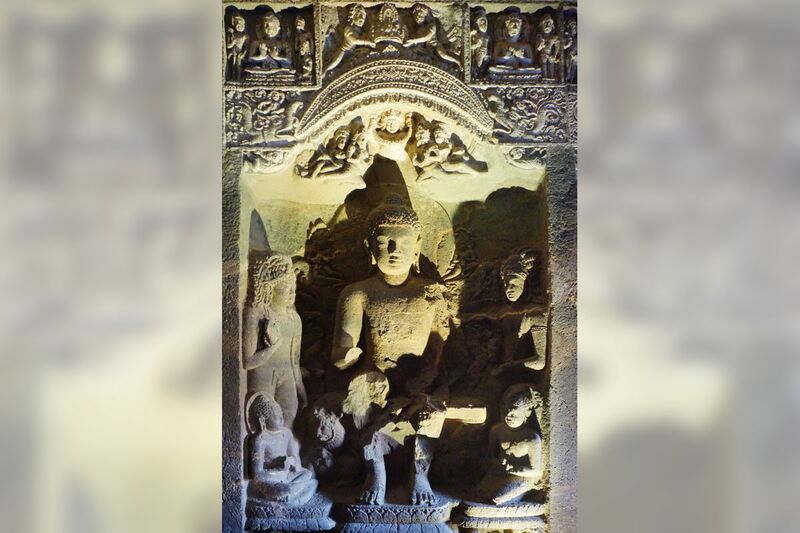 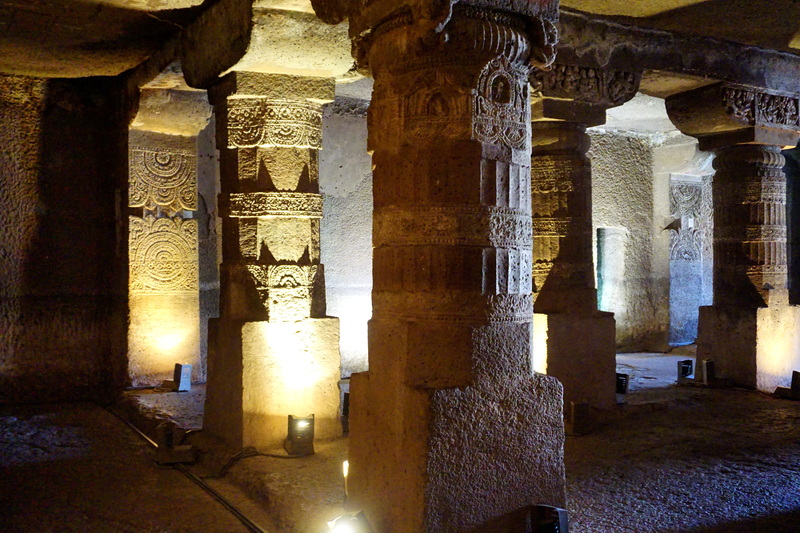 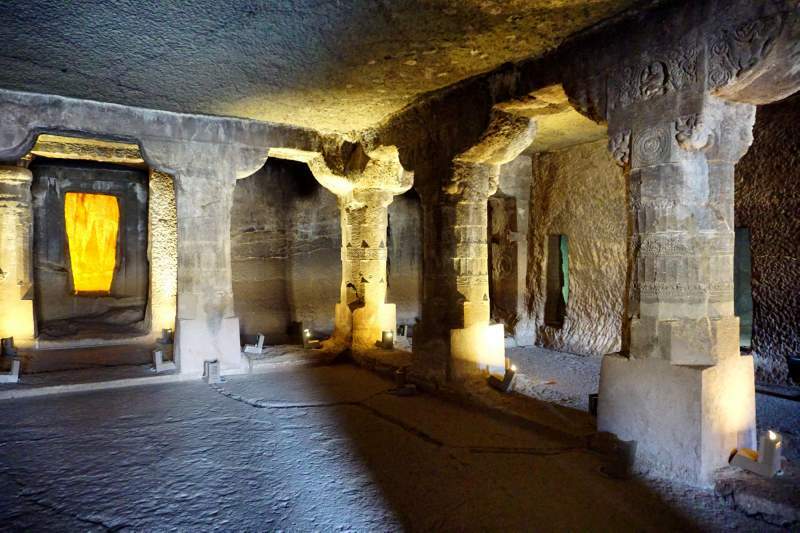 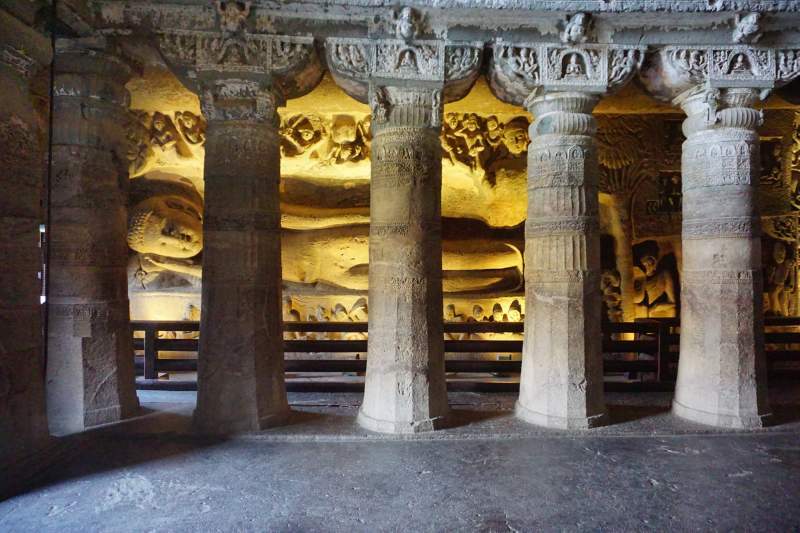 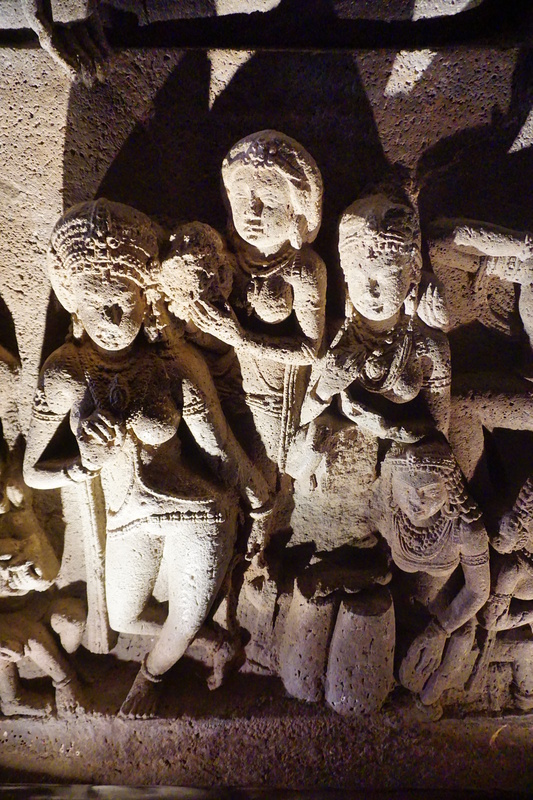 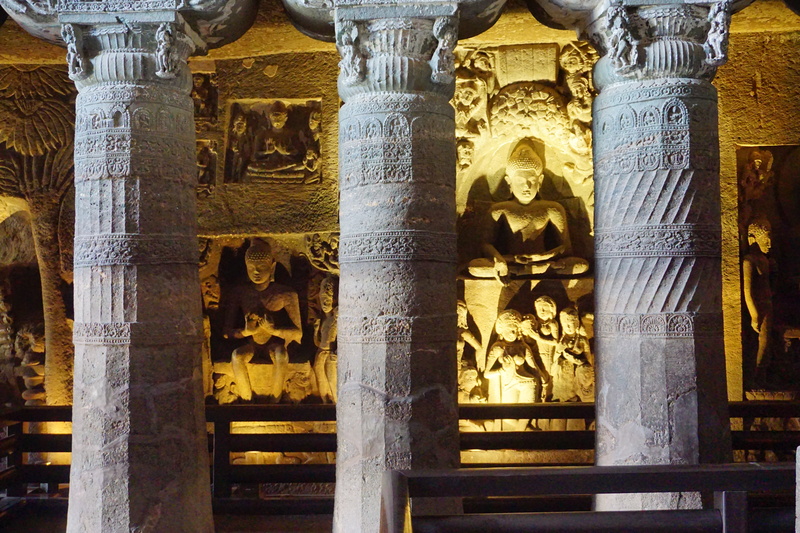 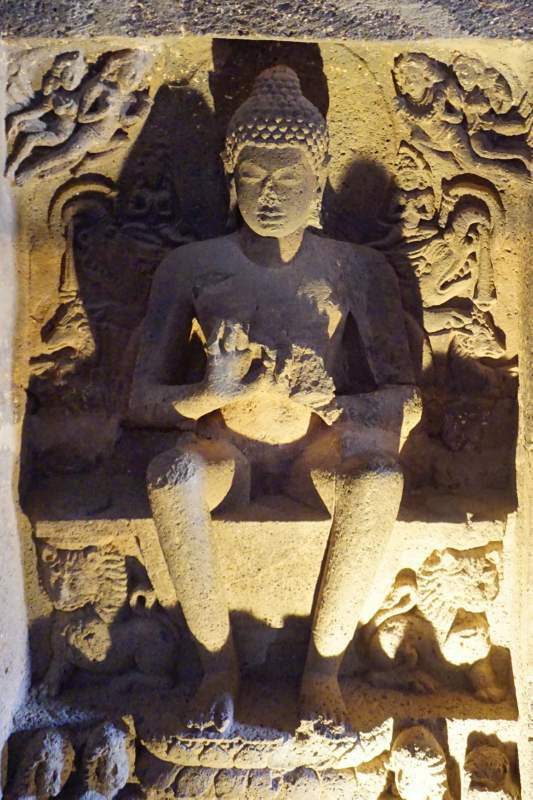 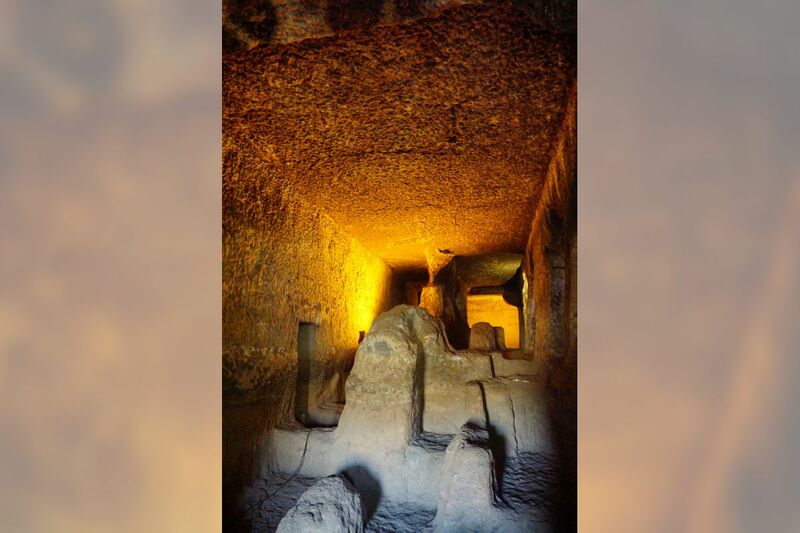 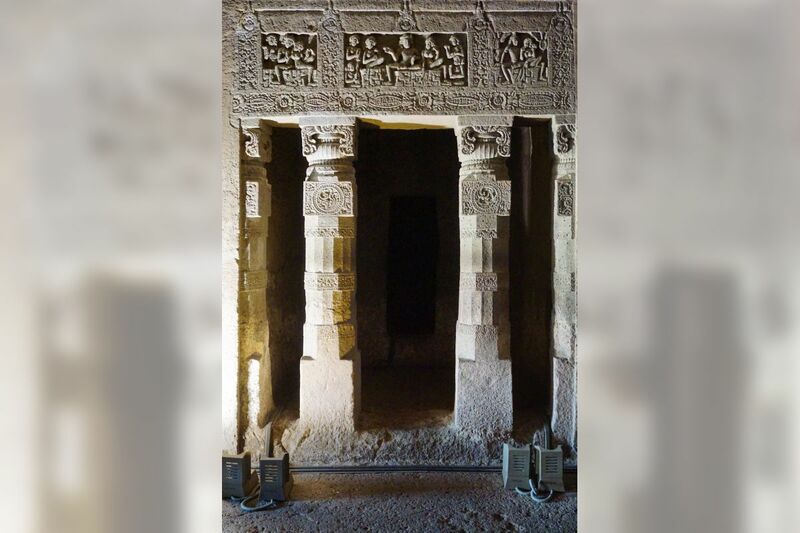 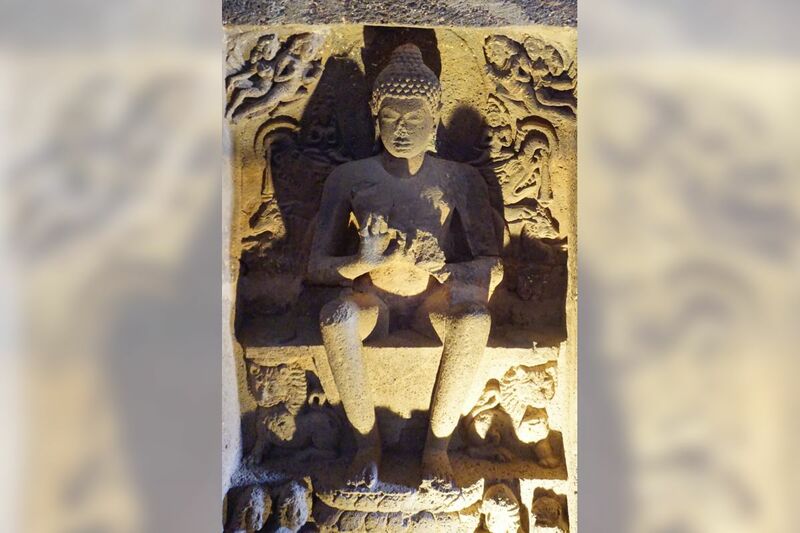 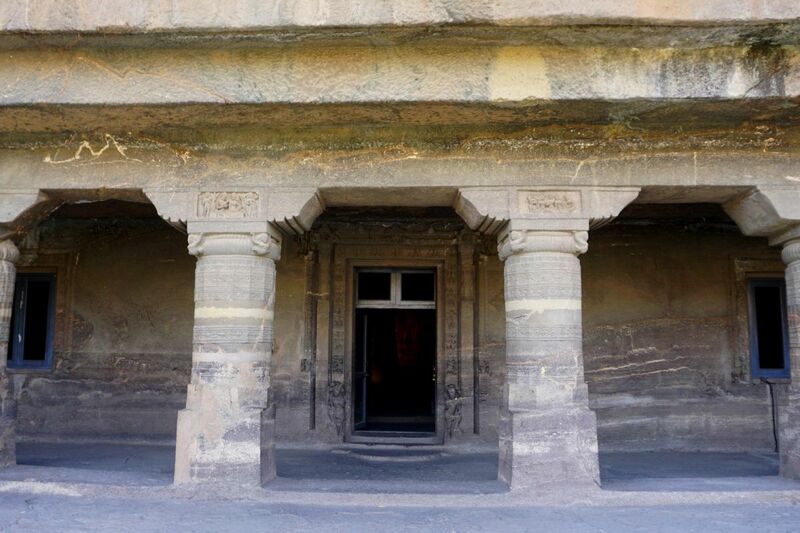 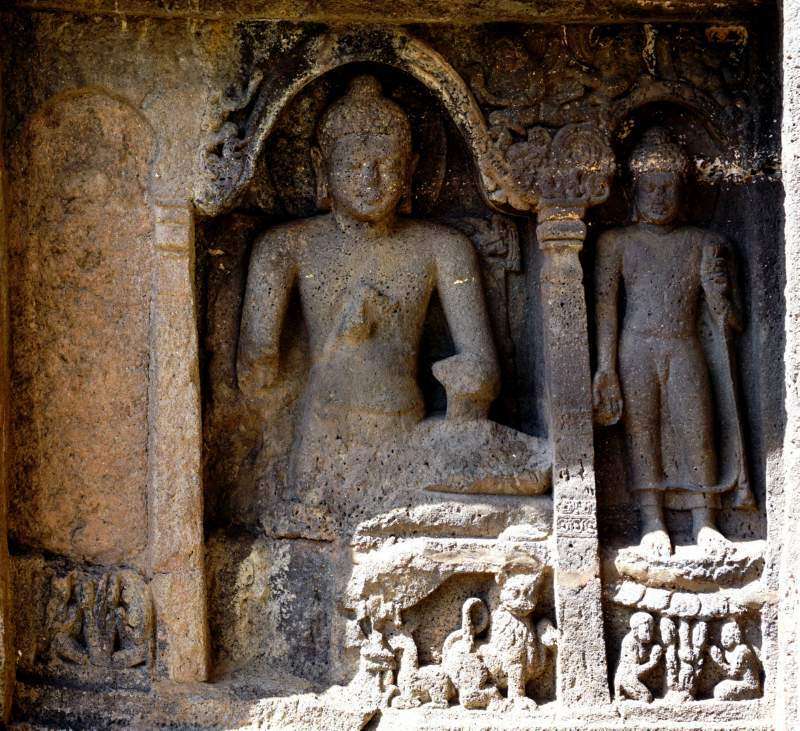 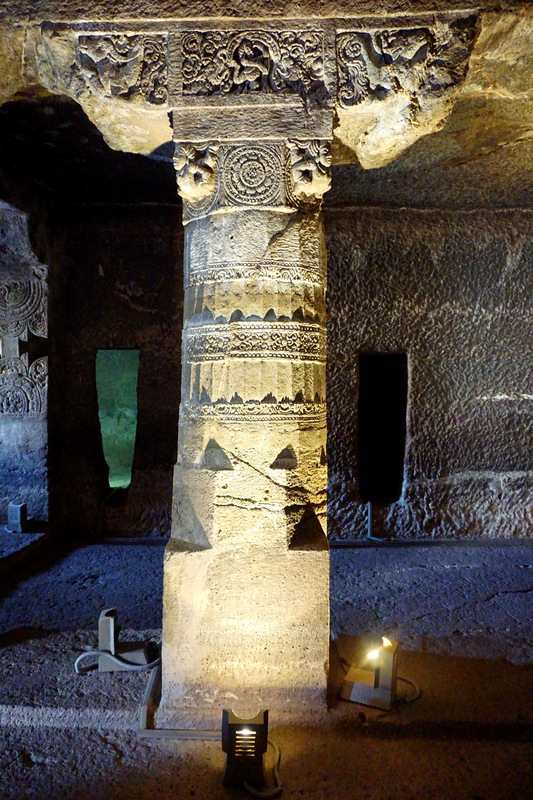 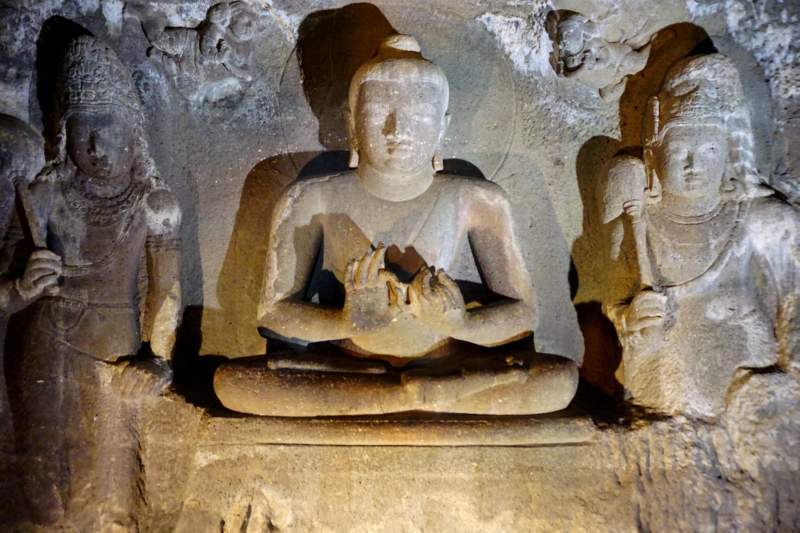 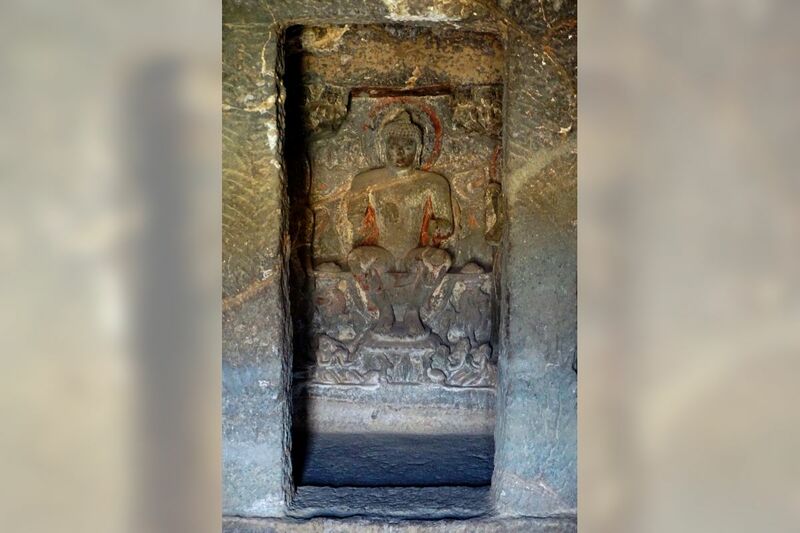 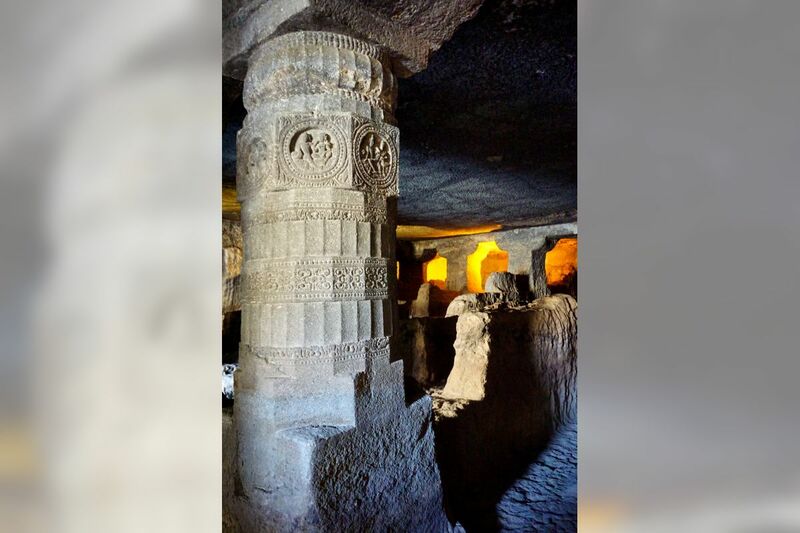 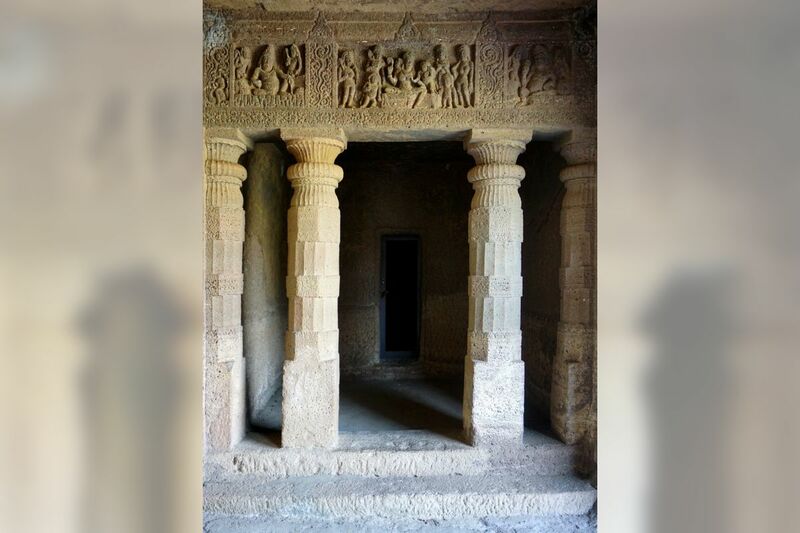 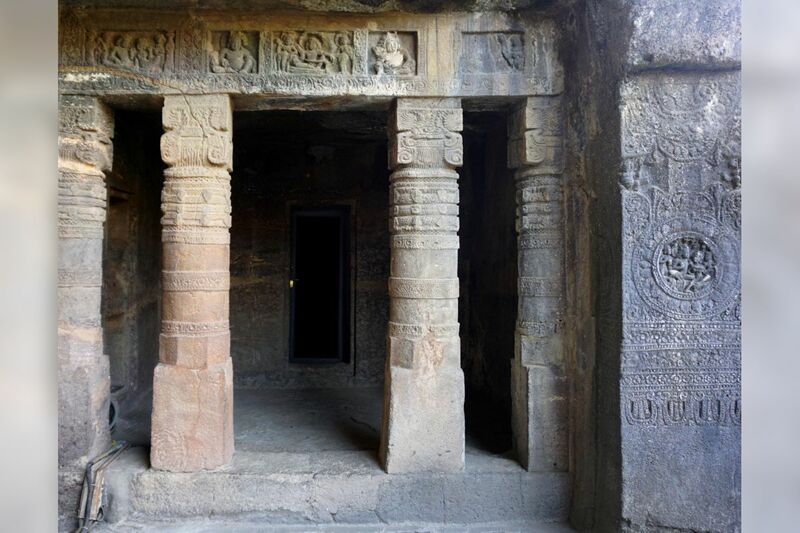 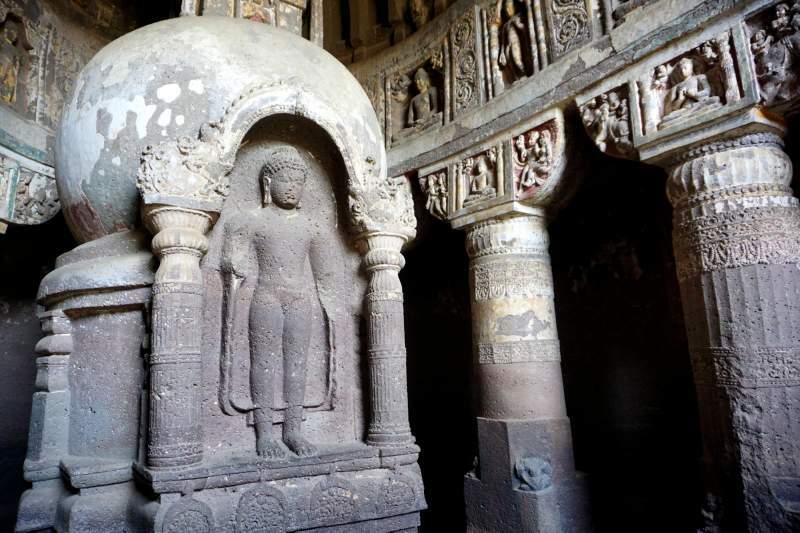 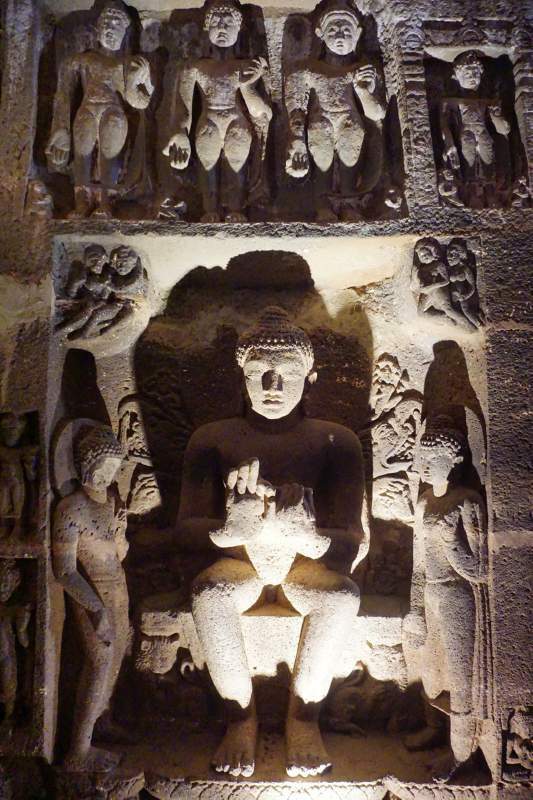 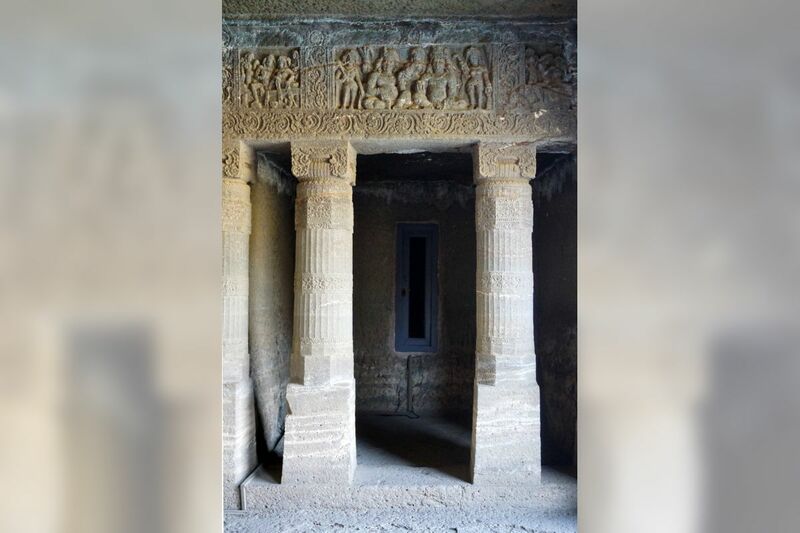 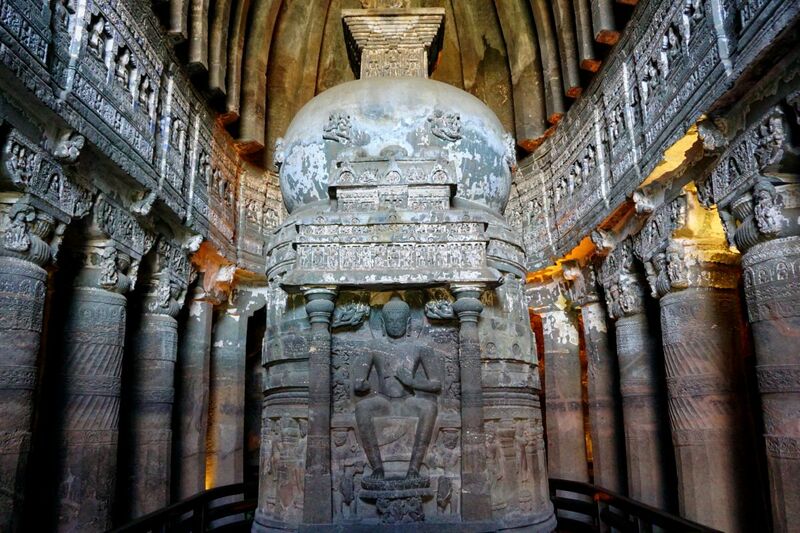 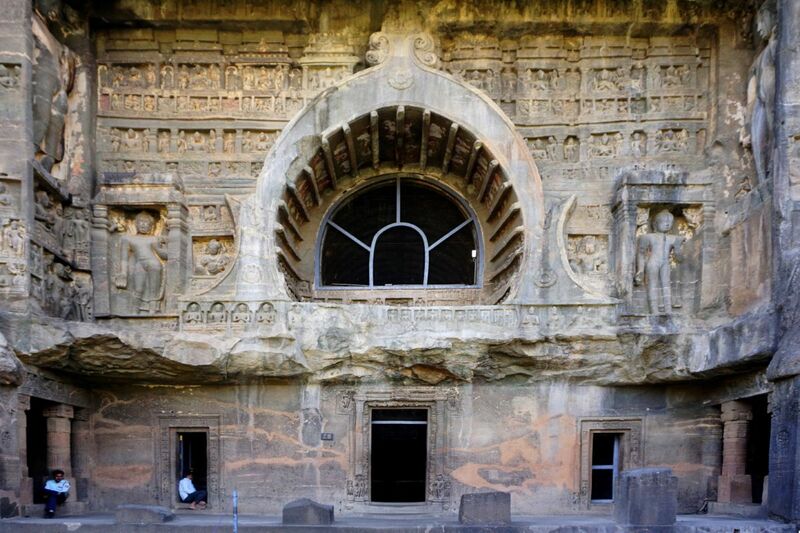 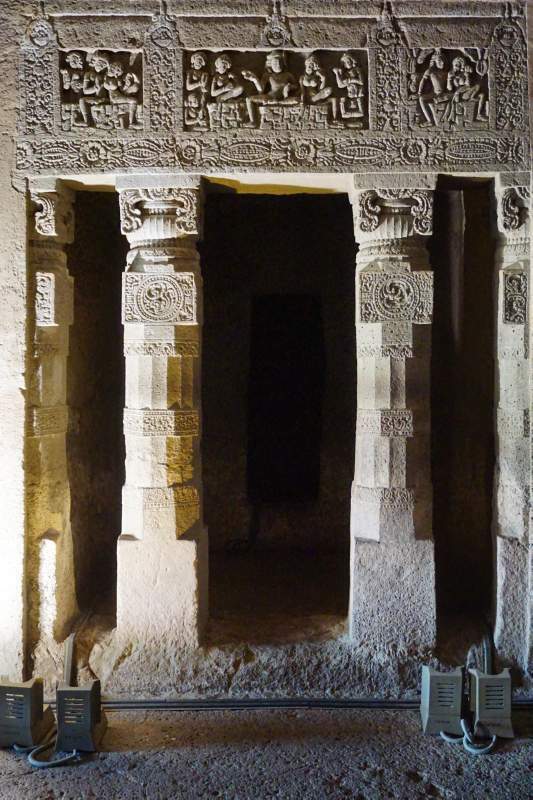 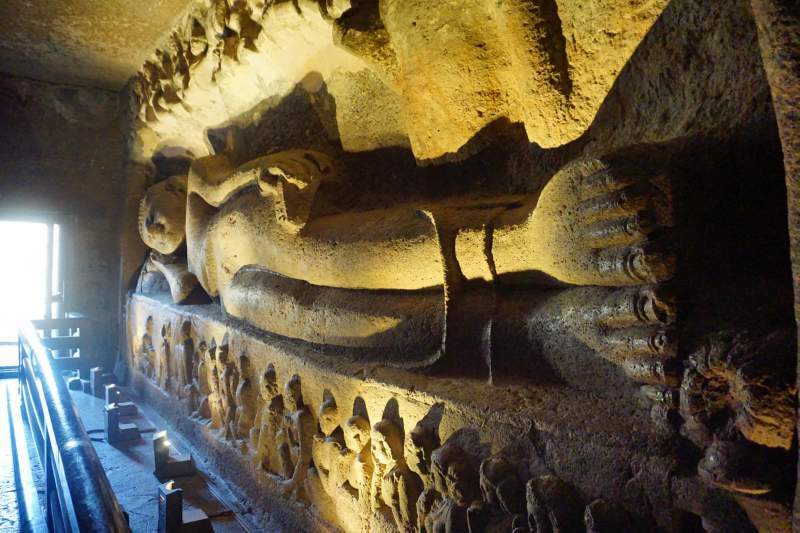 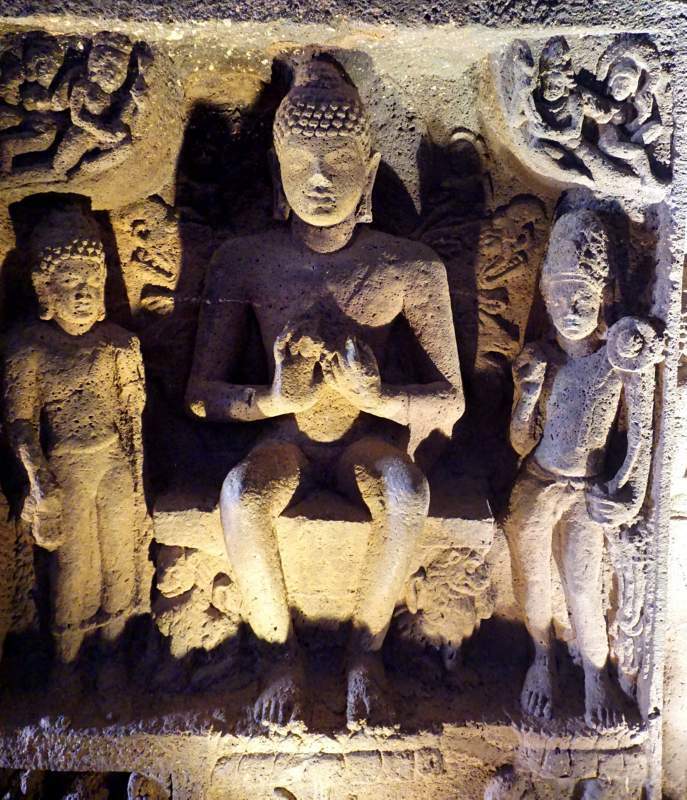 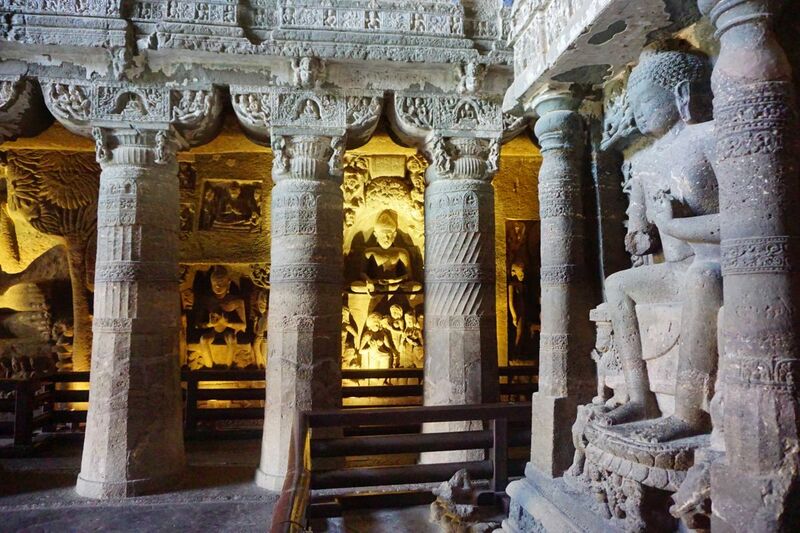 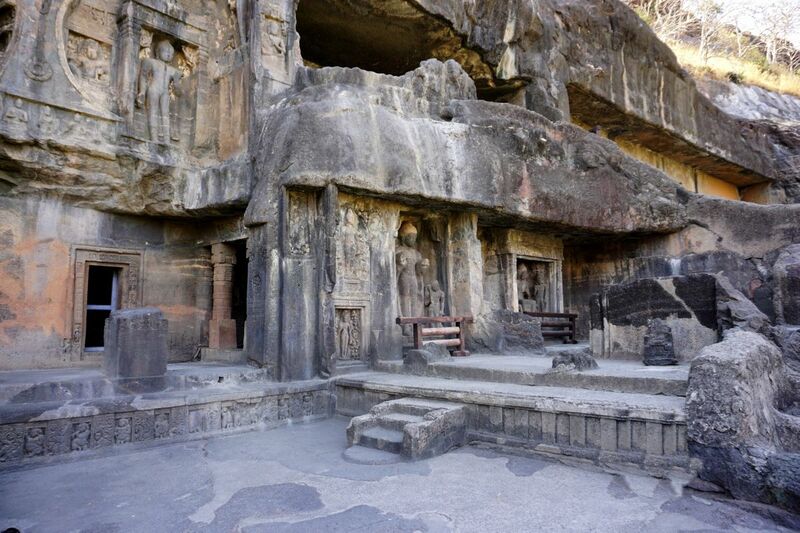 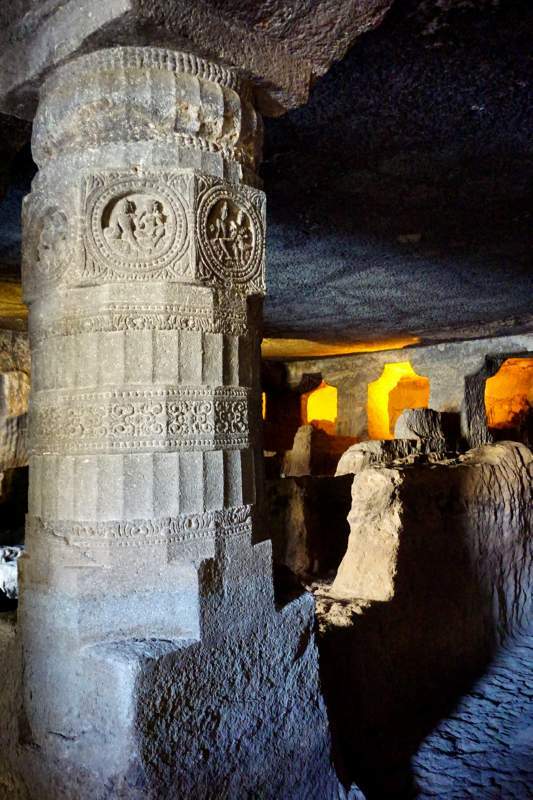 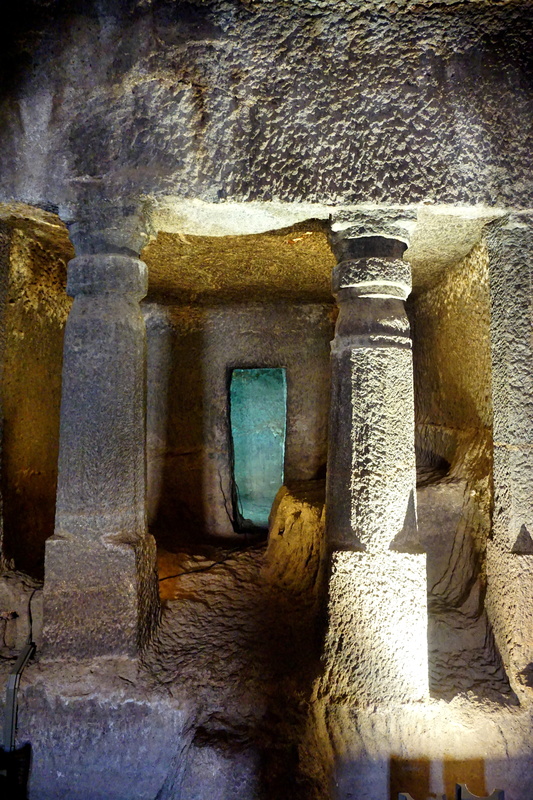 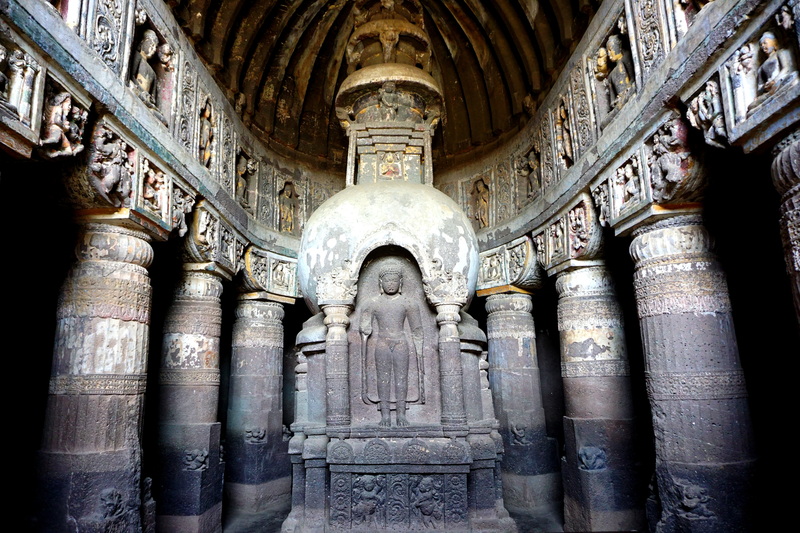 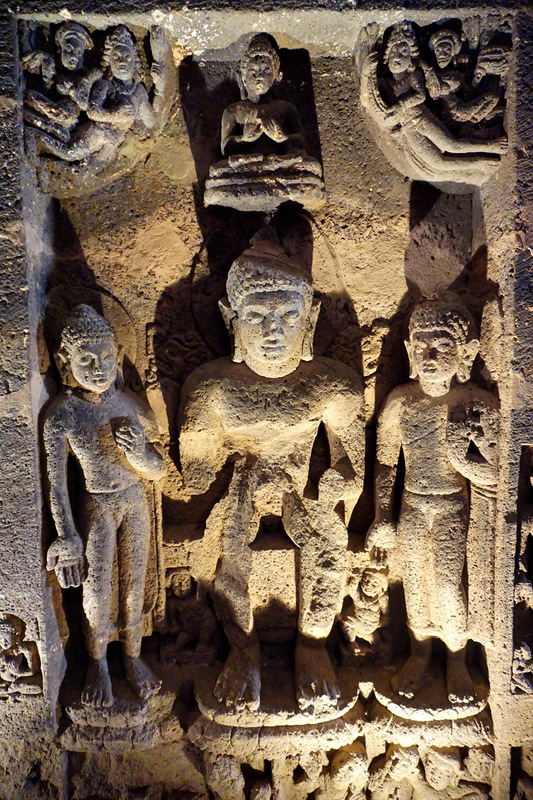 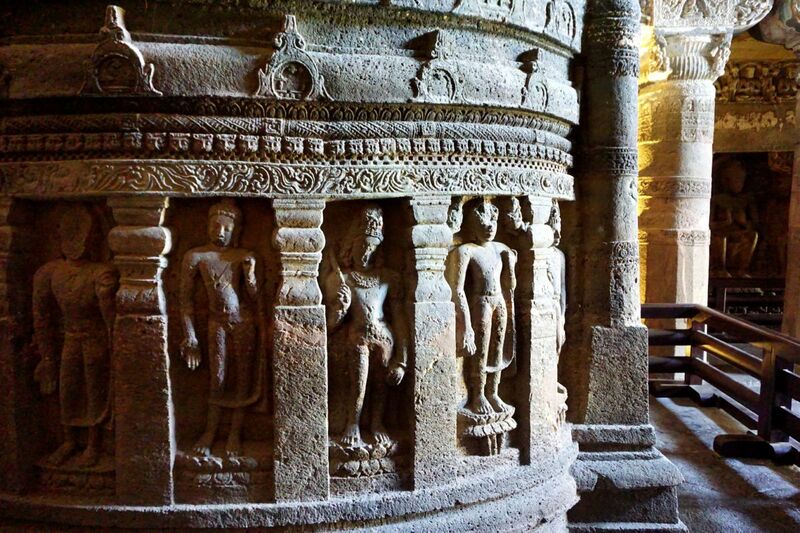 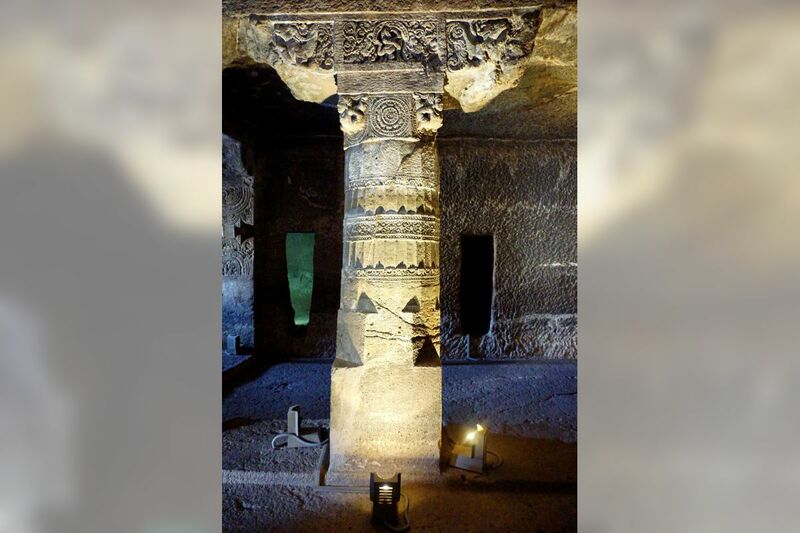 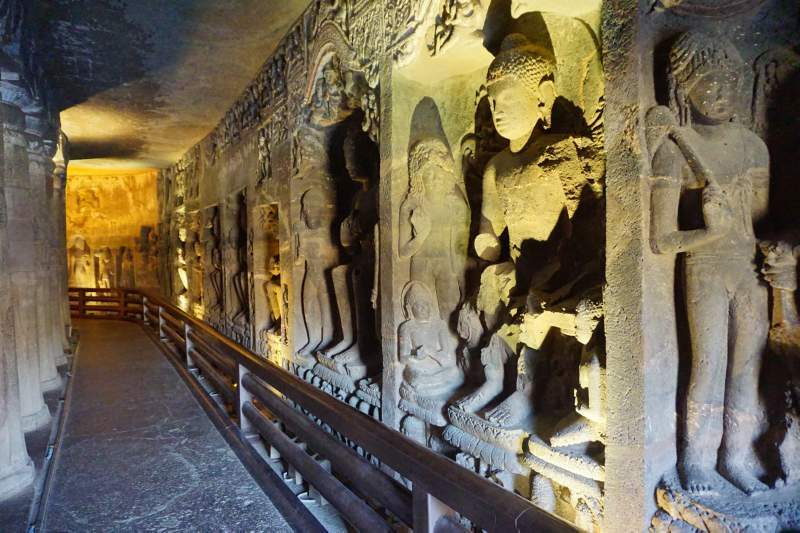 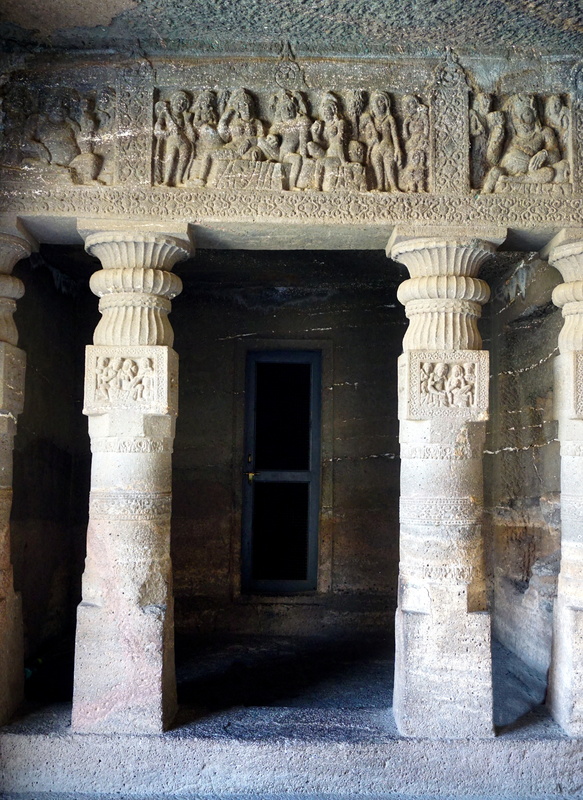 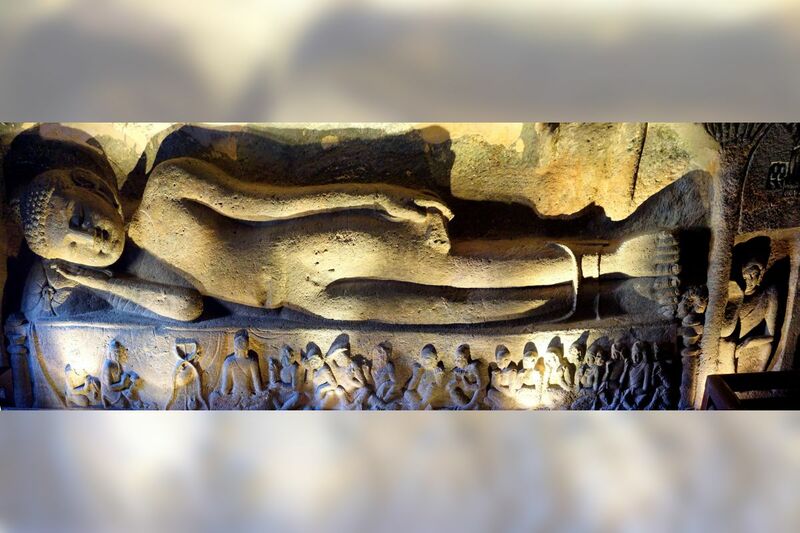 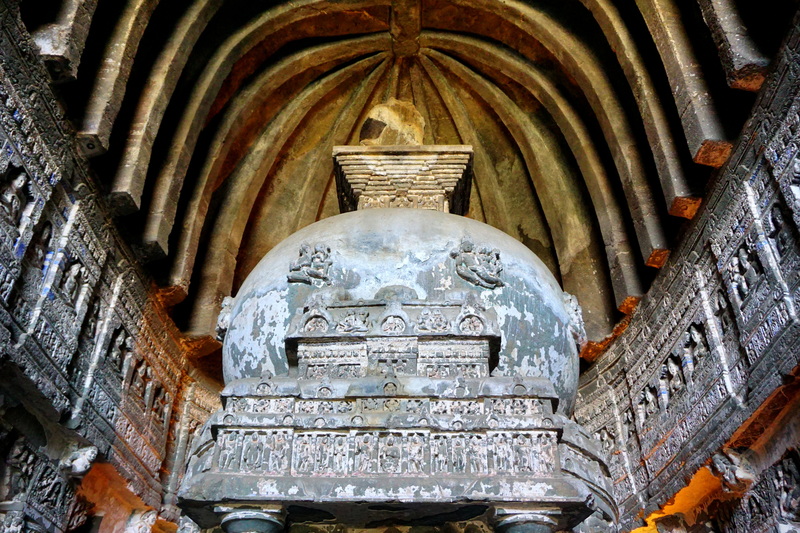 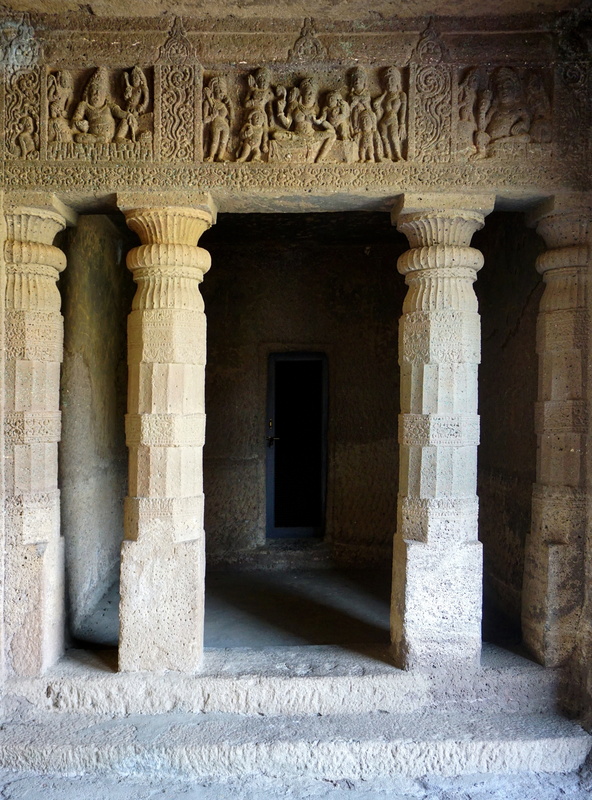 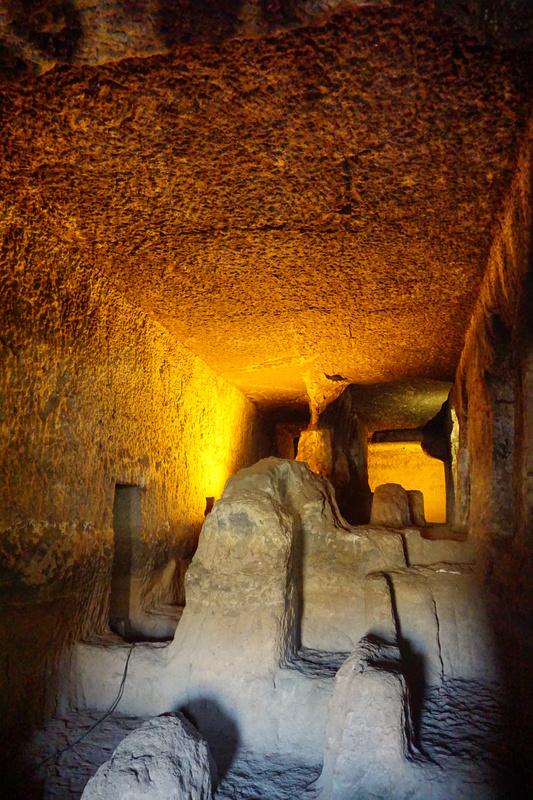 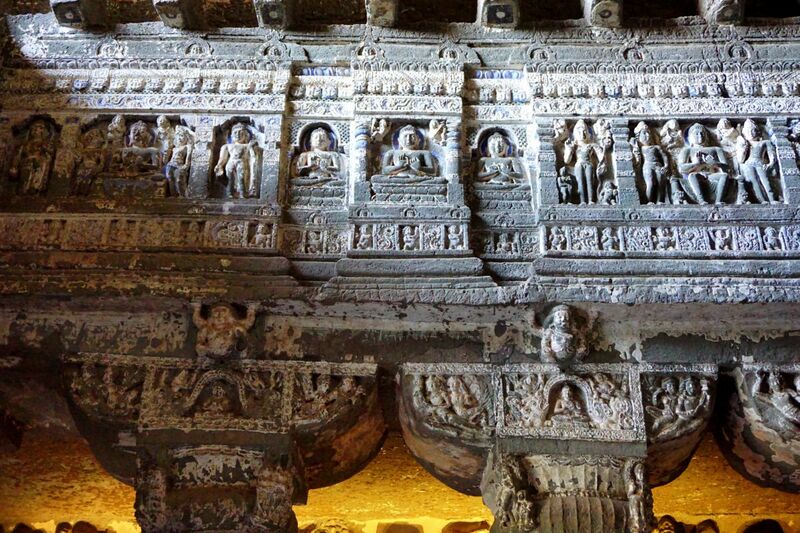 This cave is a large Chaitya Hall that is dramatically lit and contains some fine sculptures that shouldn’t be missed. A partly damaged columned facade stretches across the front with the customary side chambers at each end. 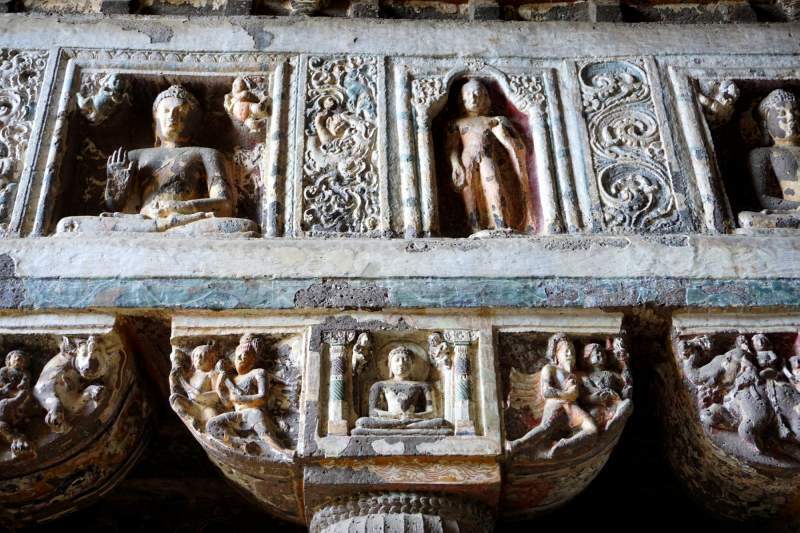 The 3-metre high window is flanked by sculptured Buddha reliefs. Inside, 26 pillars run in an elongated semicircle around the cylindrical stūpa which is decorated with Buddha and other figures. 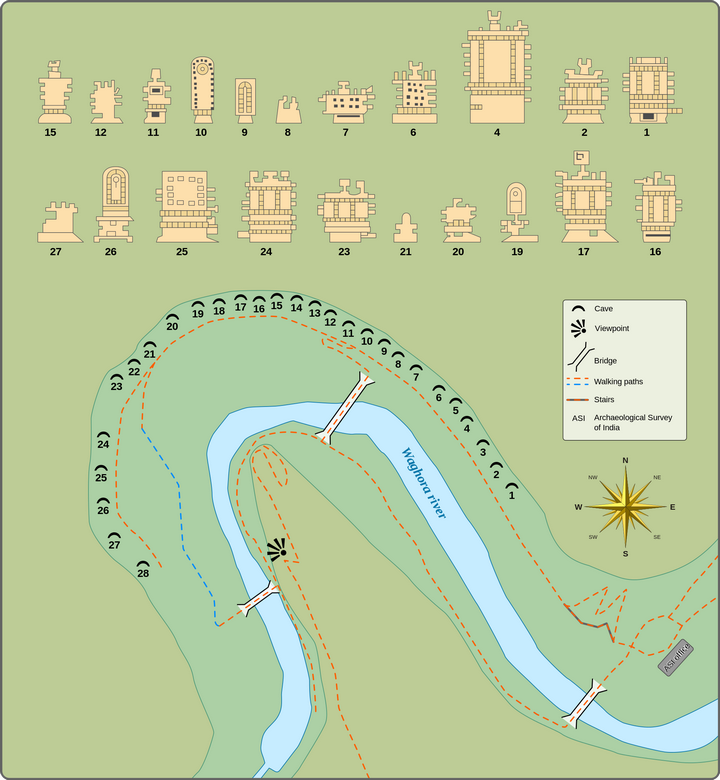 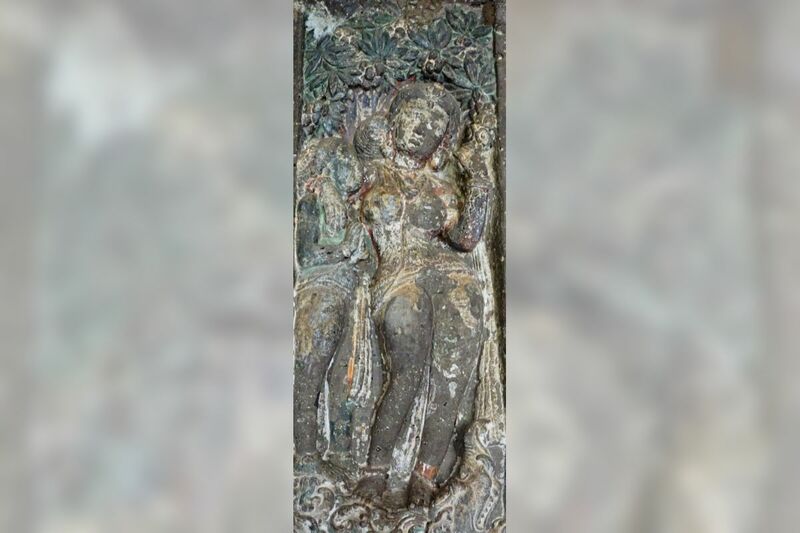 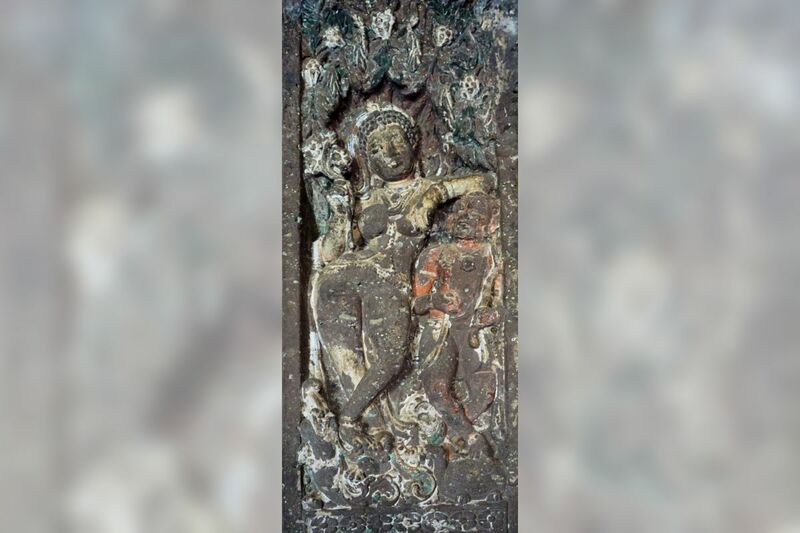 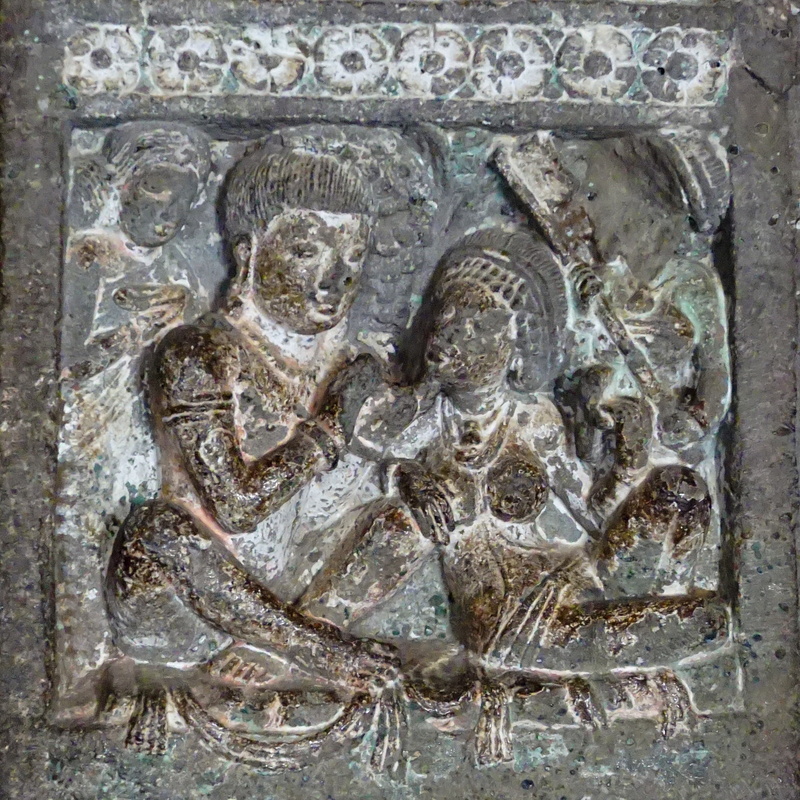 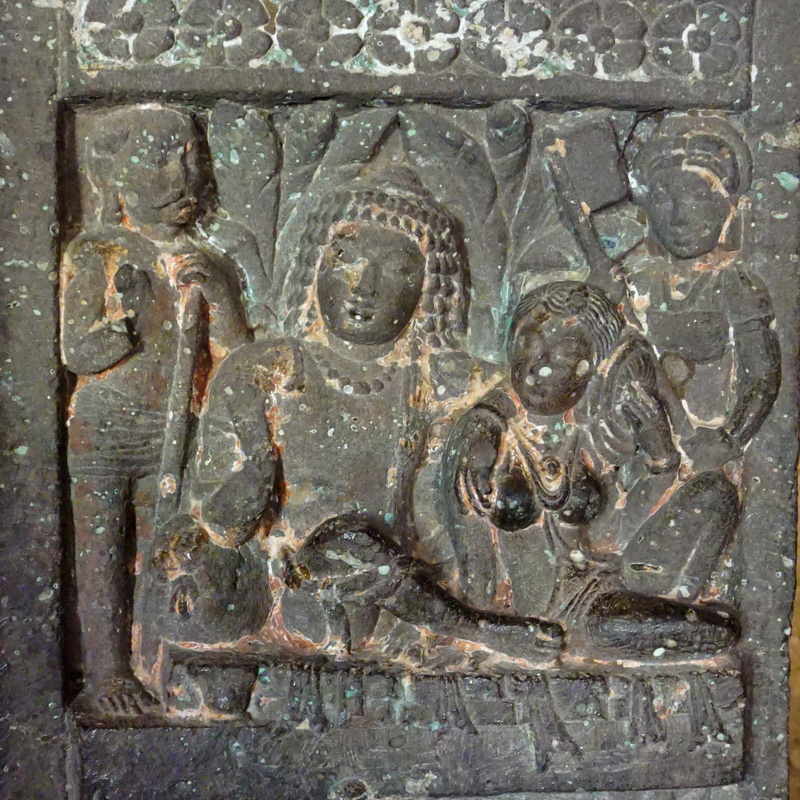 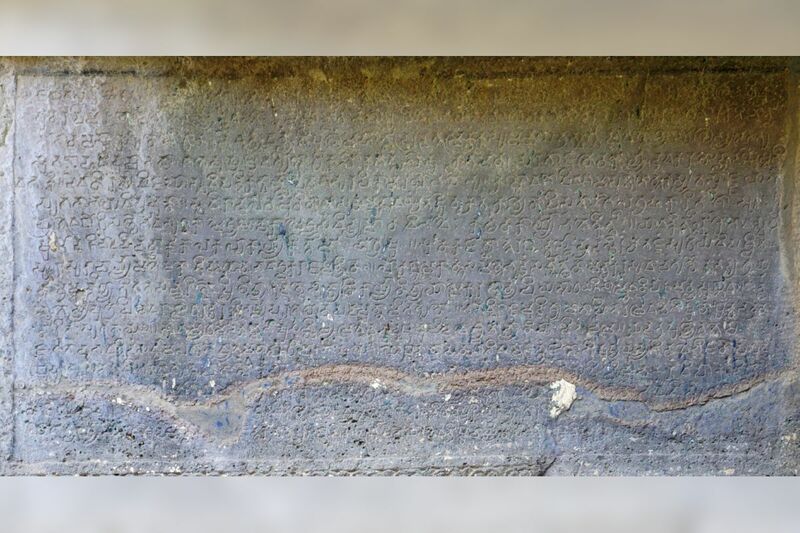 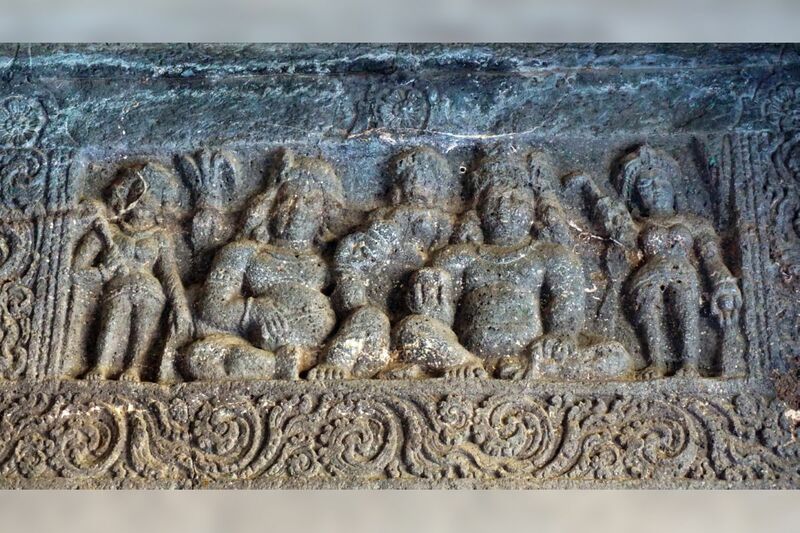 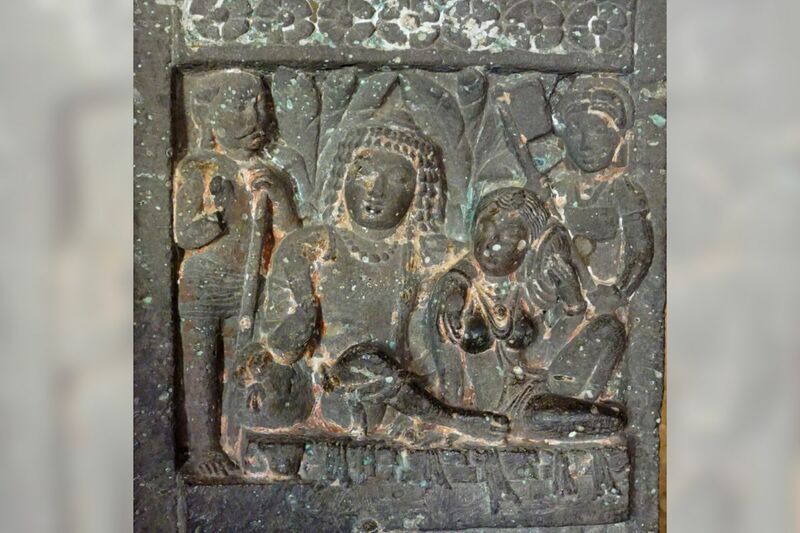 The walls are decorated with sculpture, including the Temptation by Māra’s daughters, but the most striking is the 9-metre reclining image of the reclining Buddha, about to enter Nirvāṇa, his death mourned by some of his followers.